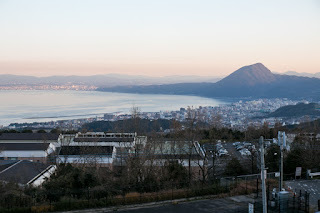 Takasaki Castle (高崎山城) is built over Takasaki-yama mountain, a beautiful shape independent peak of about 600 meter height sea, stands at the middle of current Oita city and Beppu city. 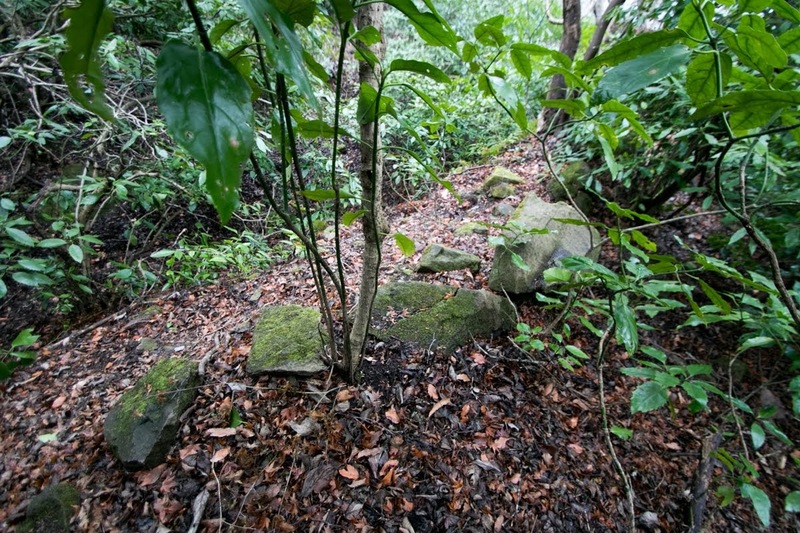 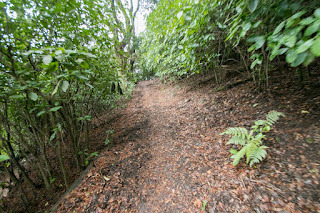 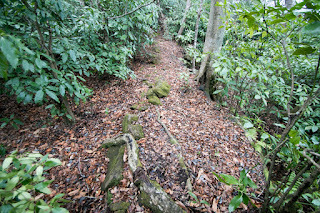 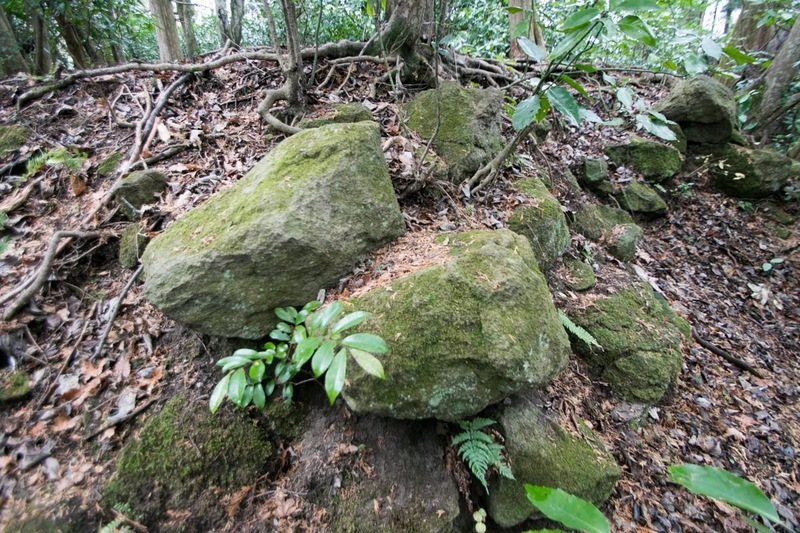 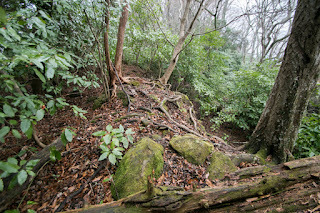 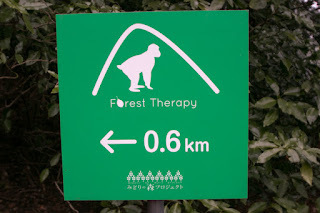 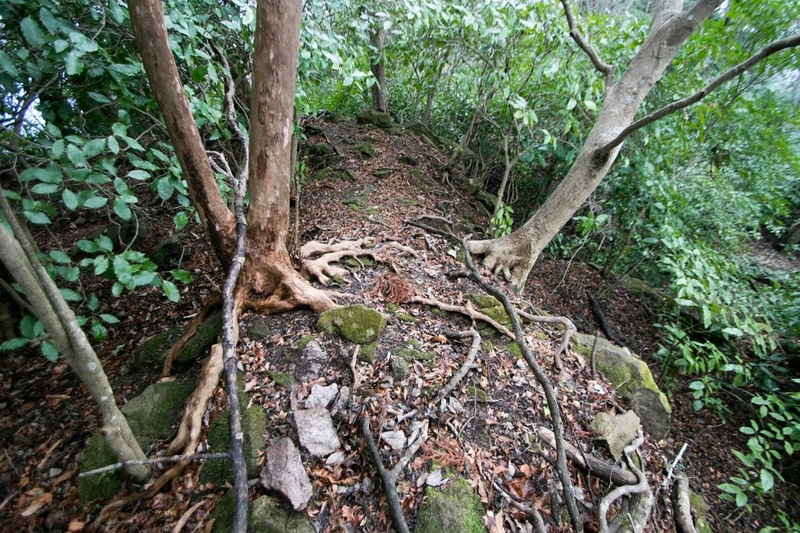 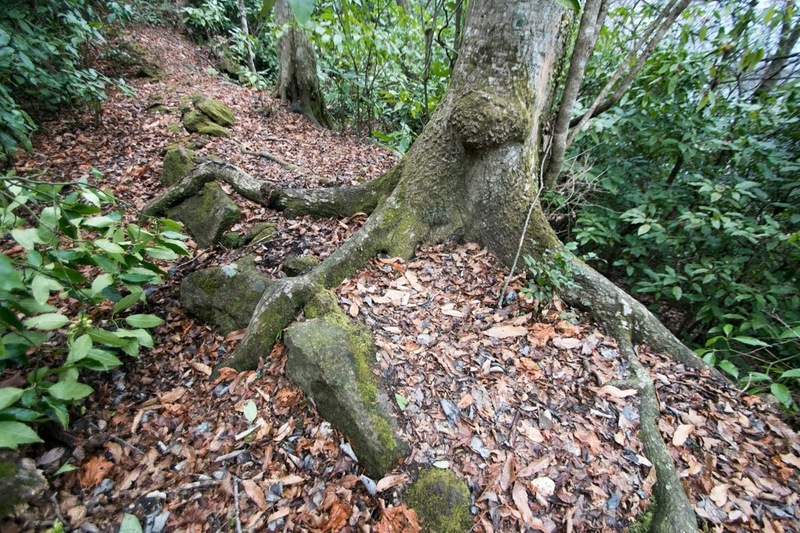 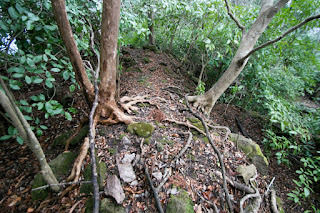 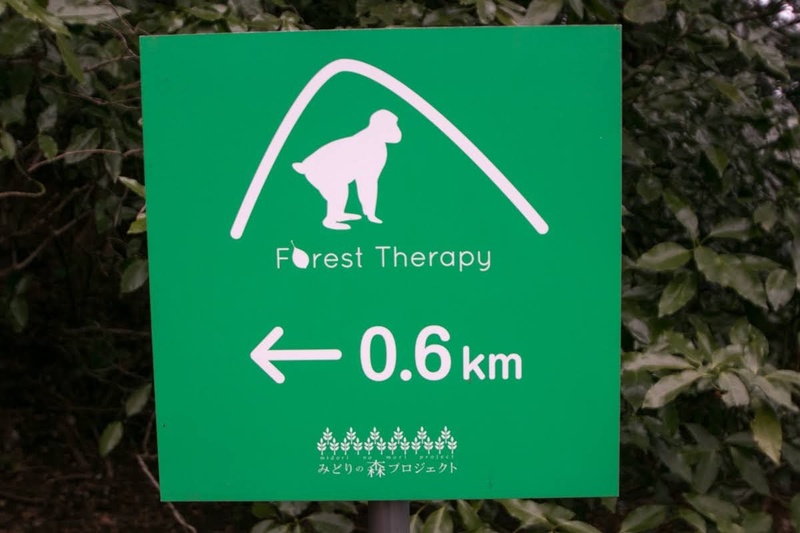 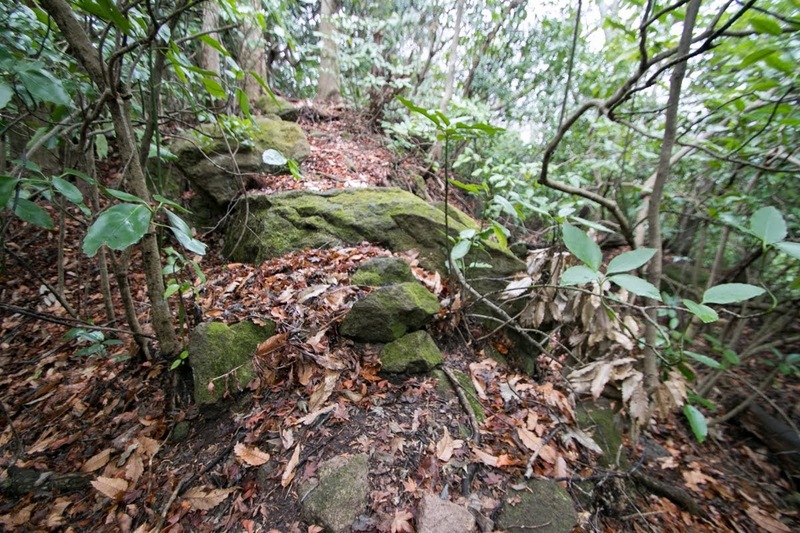 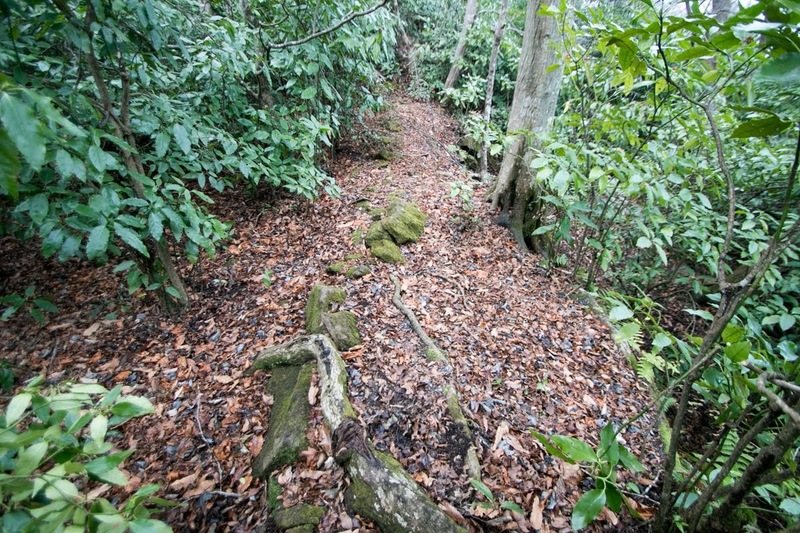 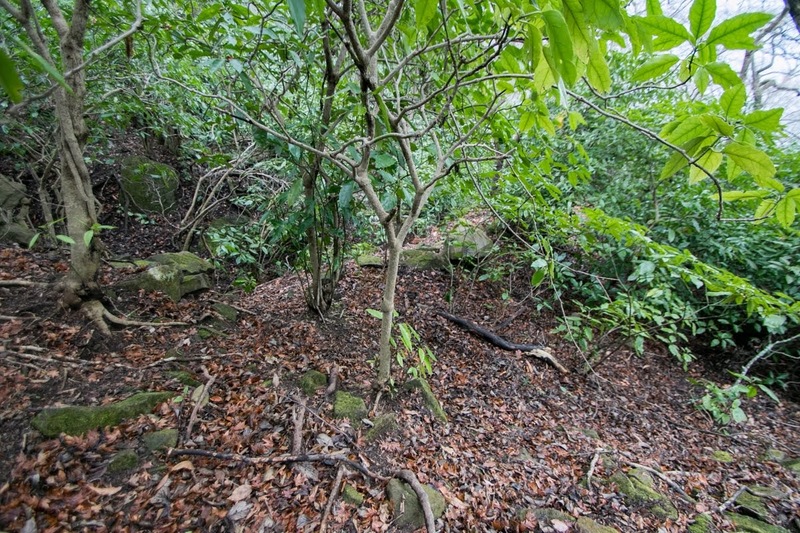 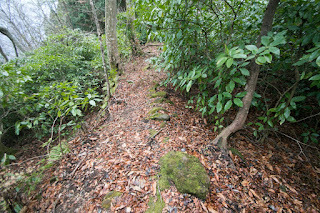 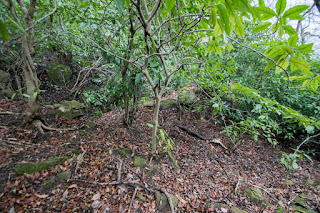 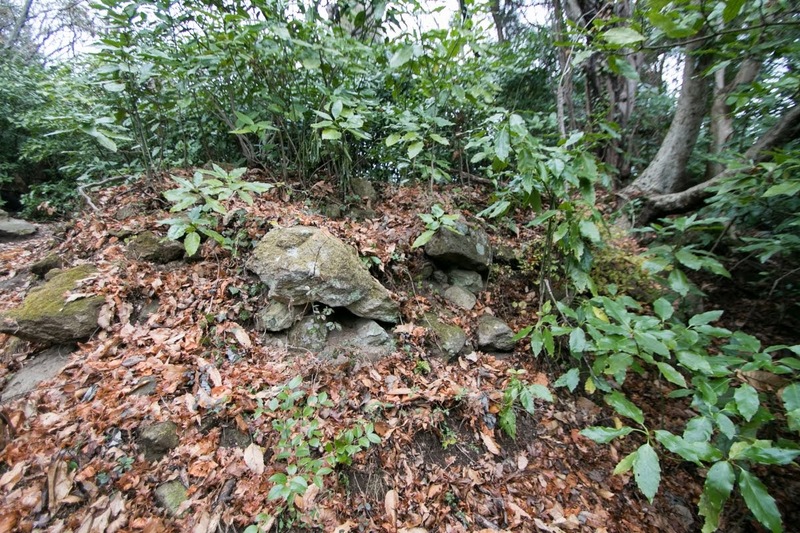 Other than a symbol of the area, this mountain is also known as a habitat of wild monkeys, which formed two colonies and their feeding is observable. Currently sea side road runs along the coast side, but formerly this was a sheer cliff and a mountainous road passed at the backside highland of the mountain. 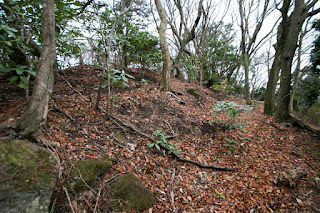 From this side the height difference of hillside and hilltop is about 200 meter, a suitable height both for access and defense. 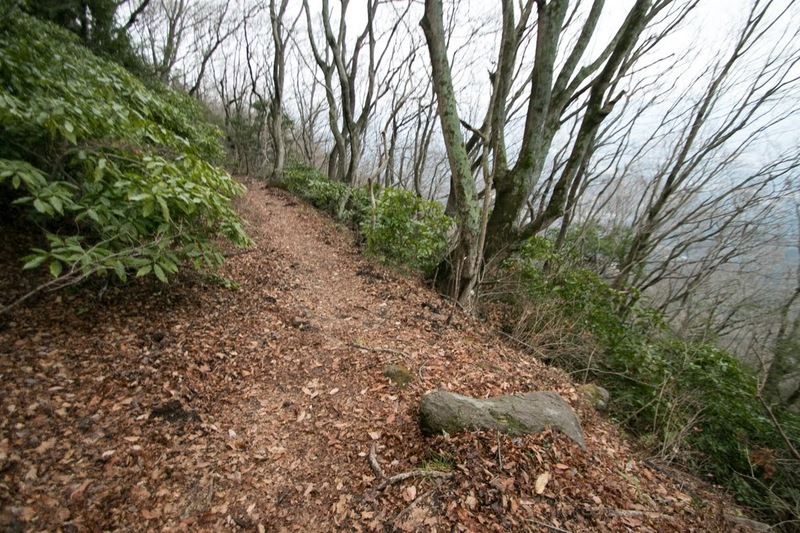 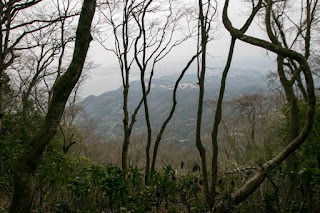 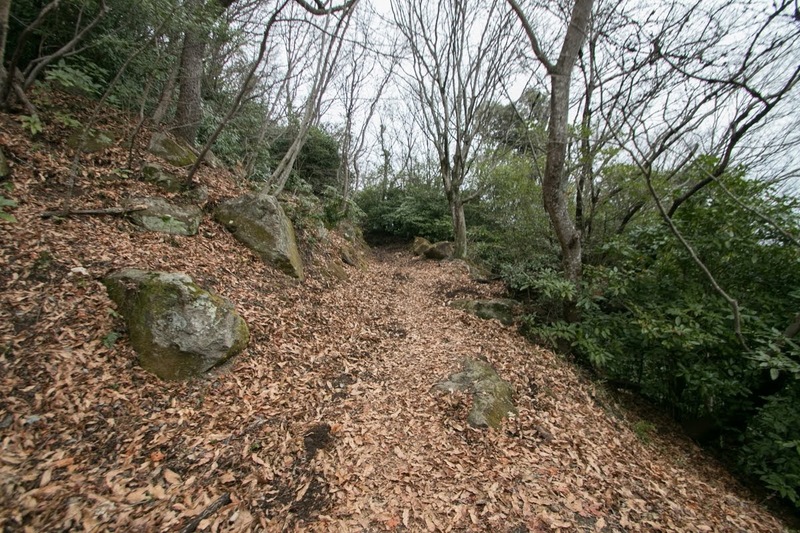 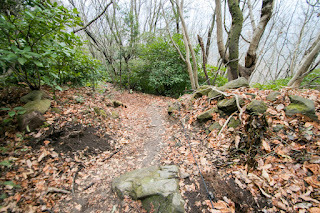 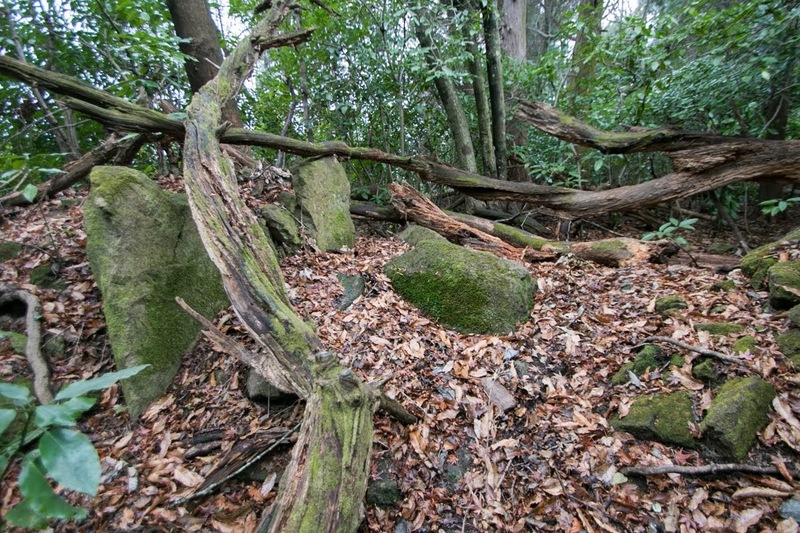 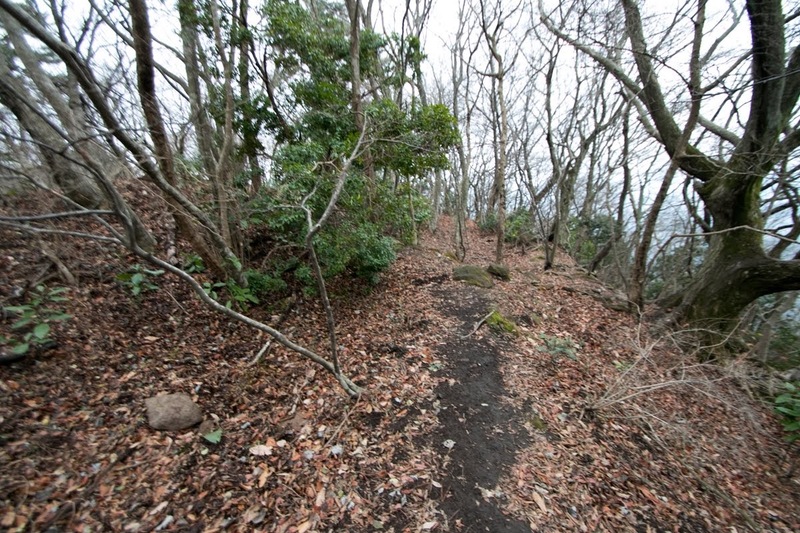 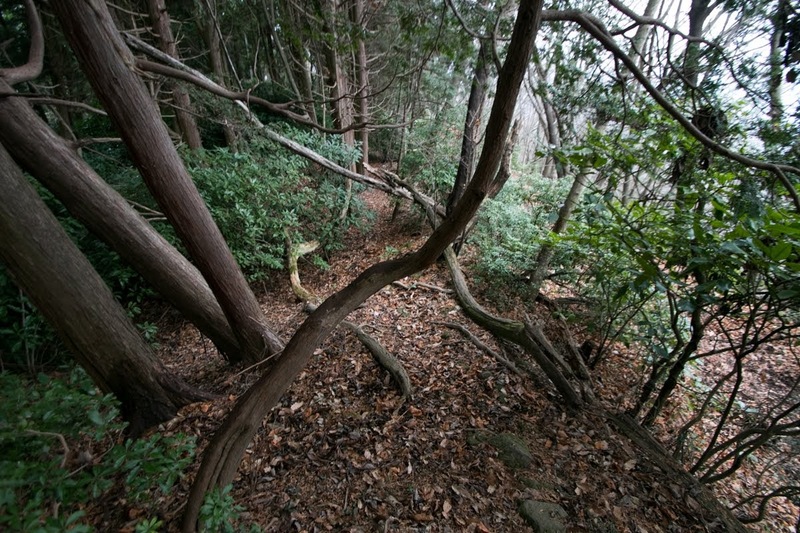 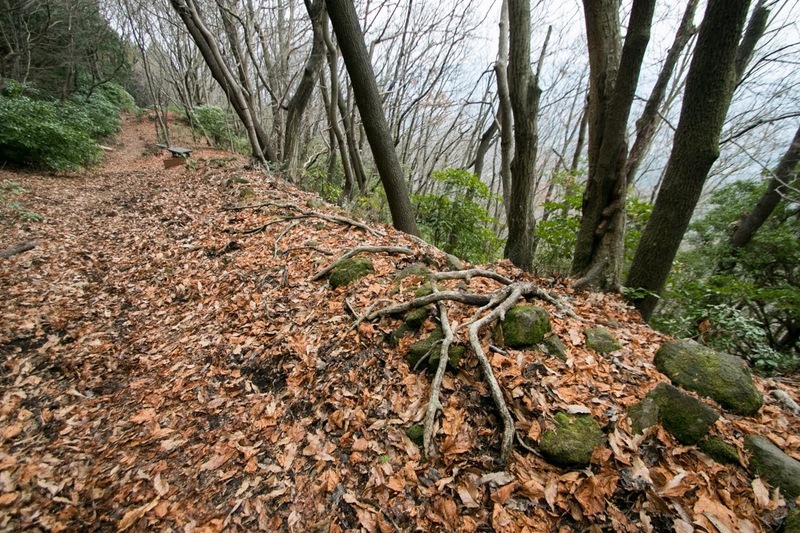 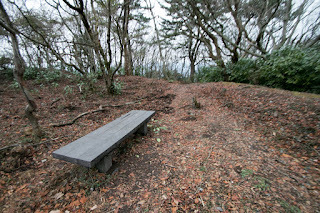 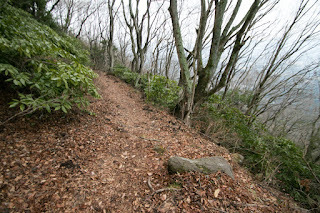 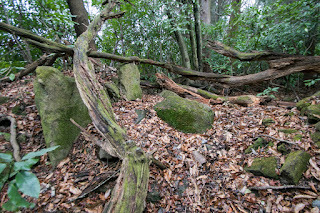 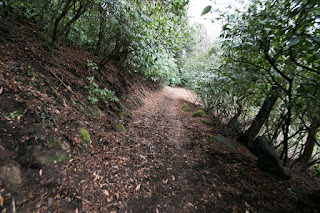 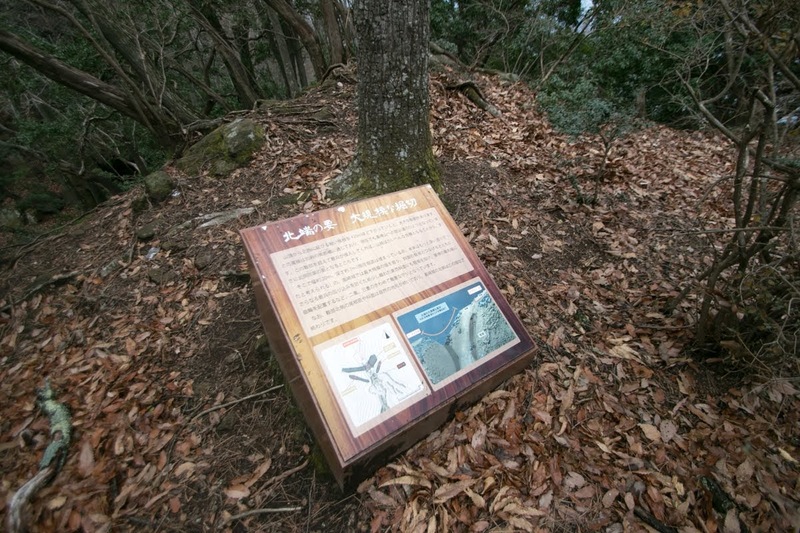 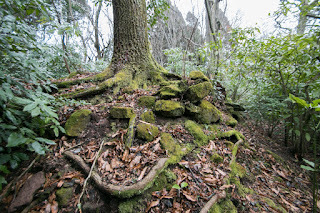 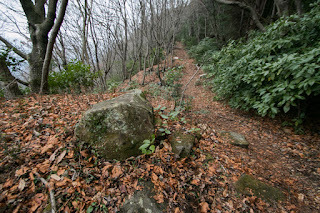 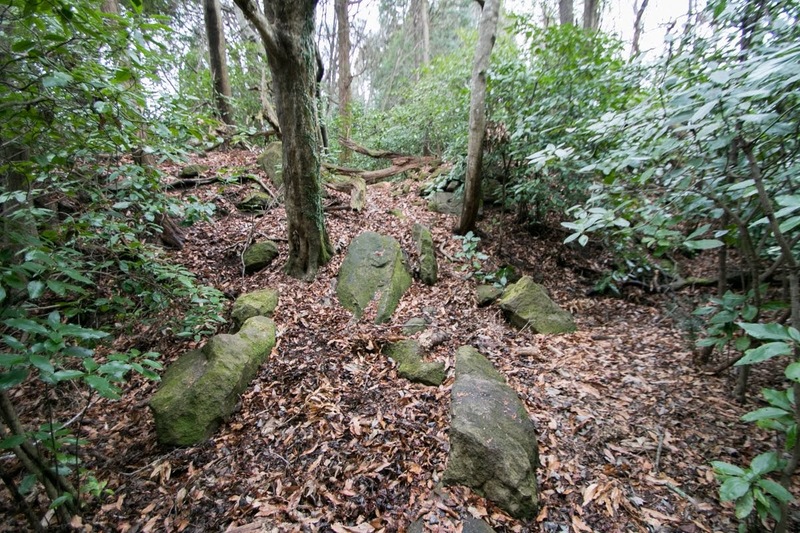 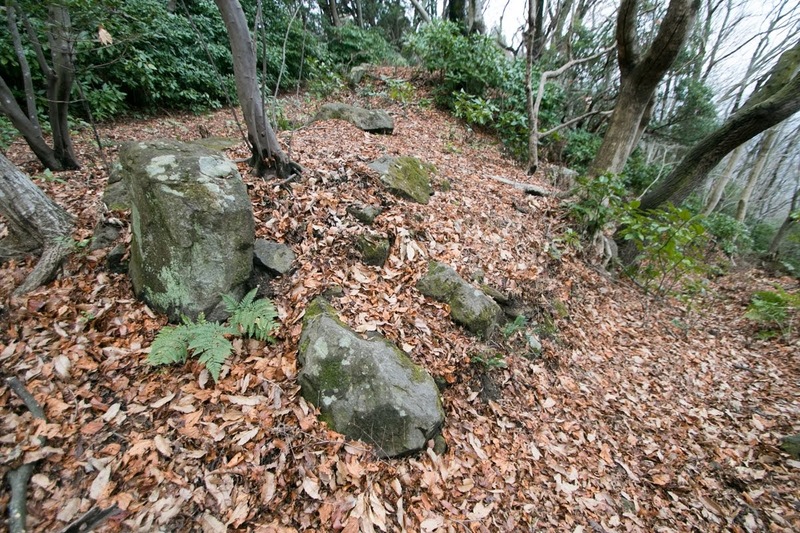 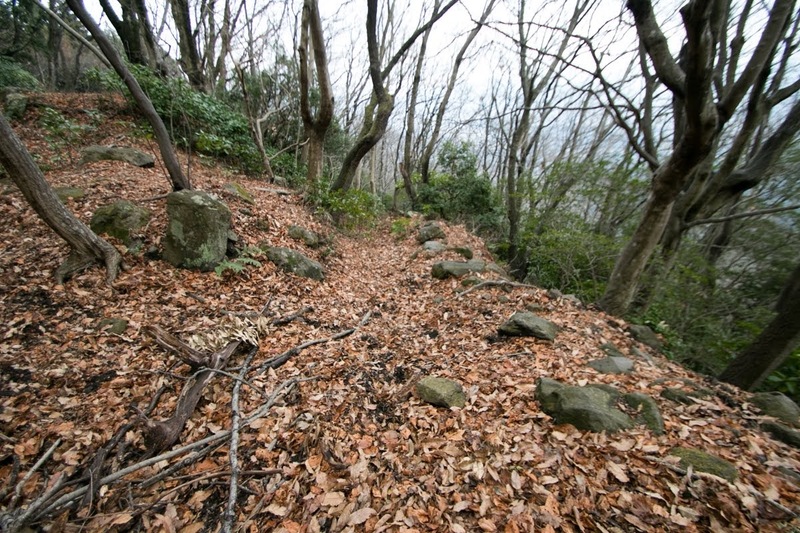 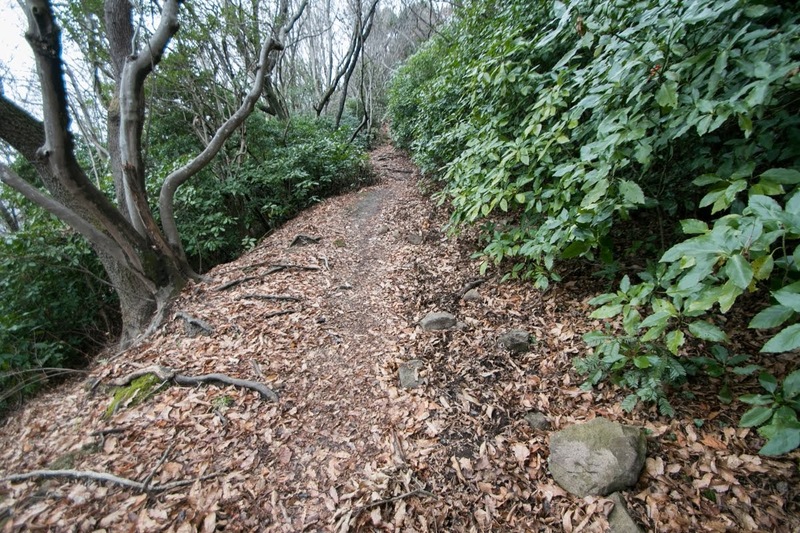 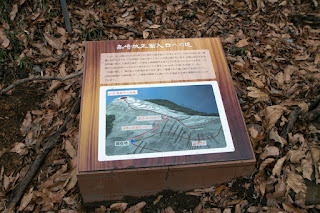 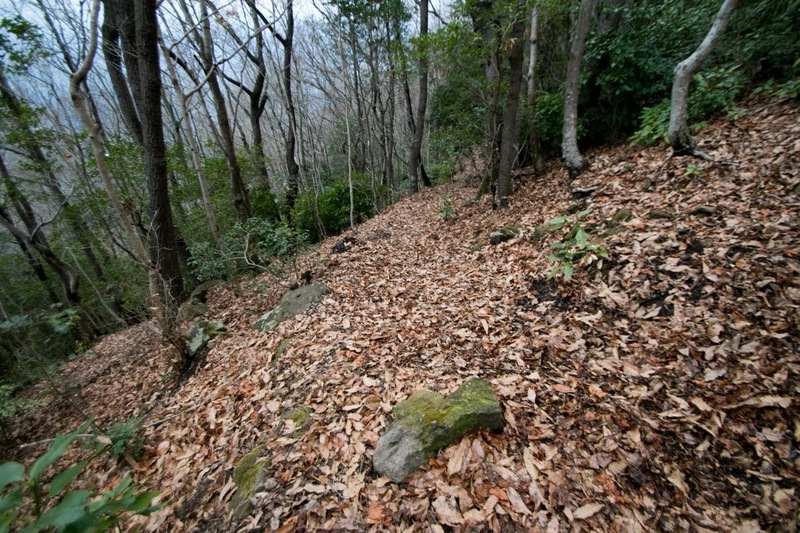 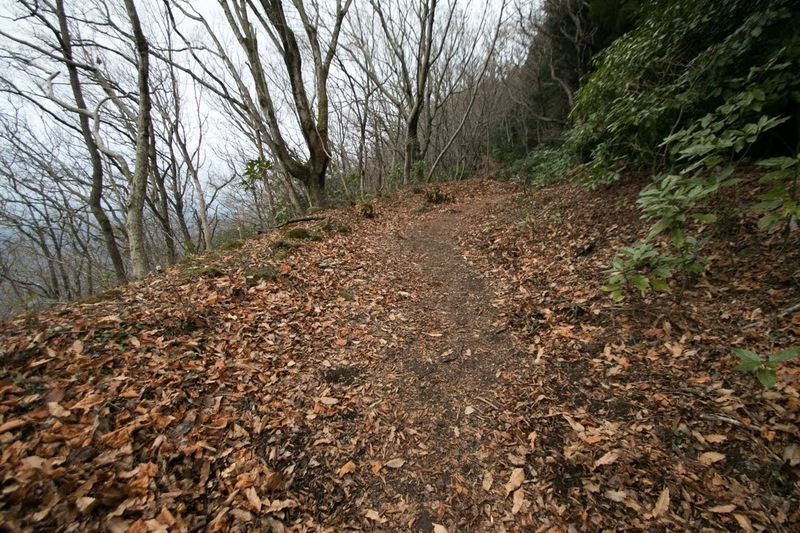 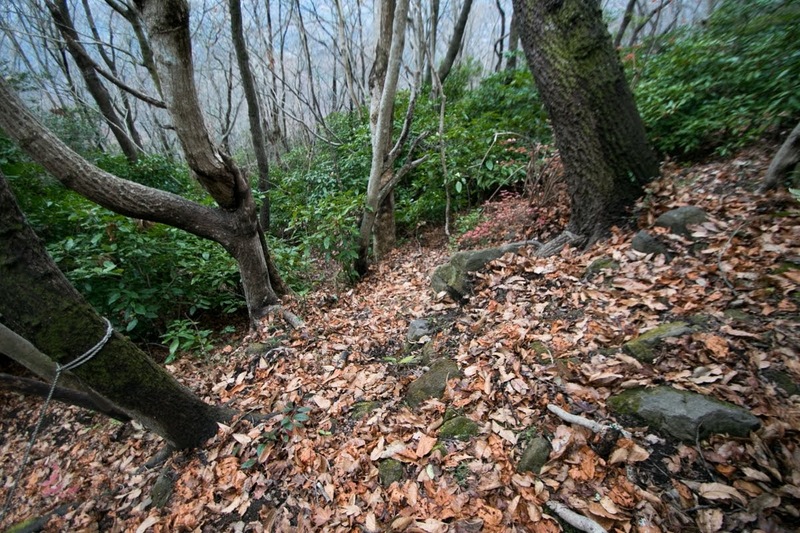 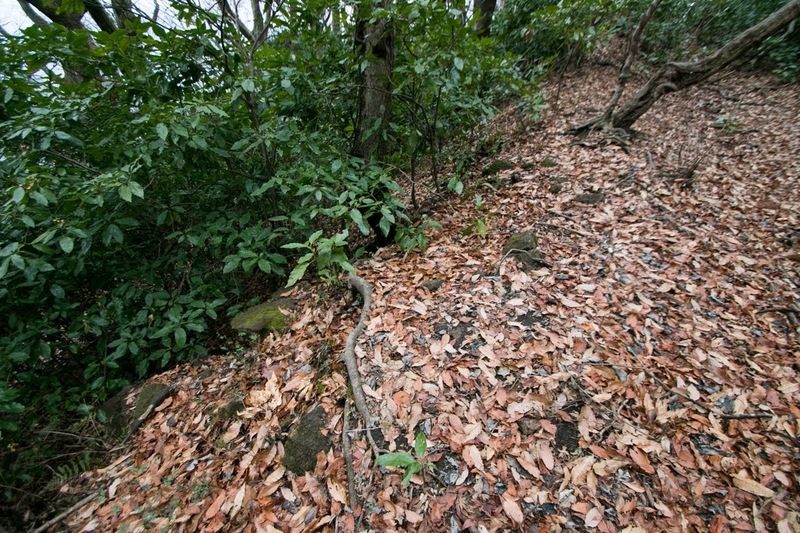 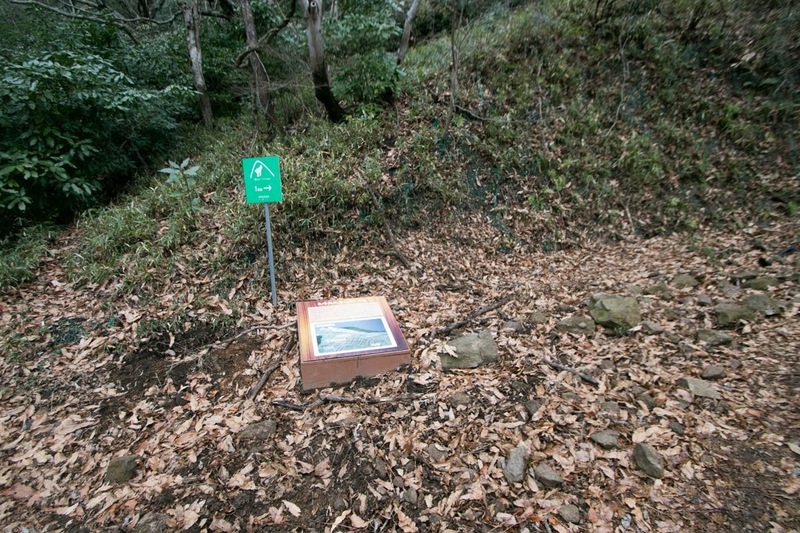 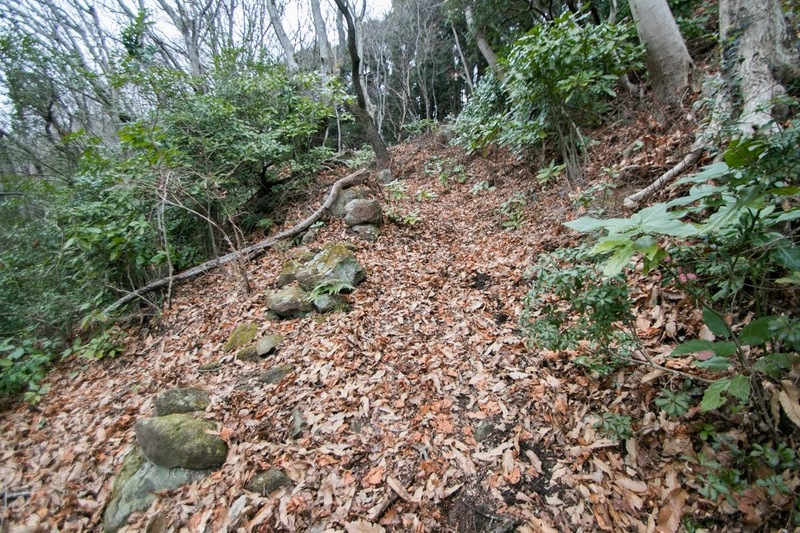 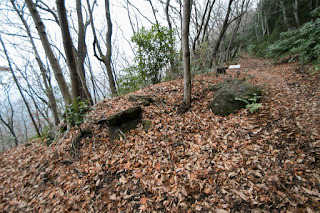 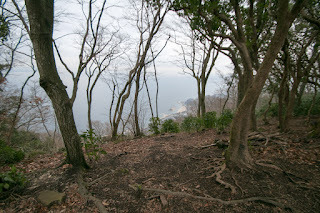 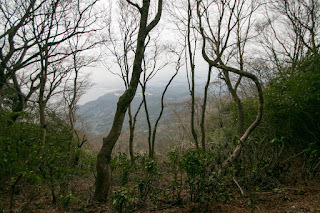 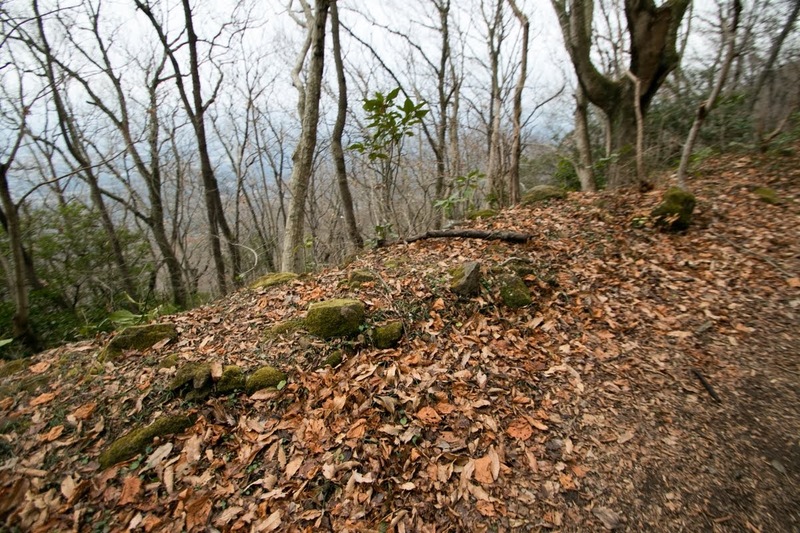 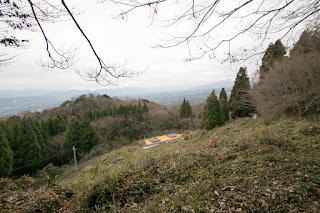 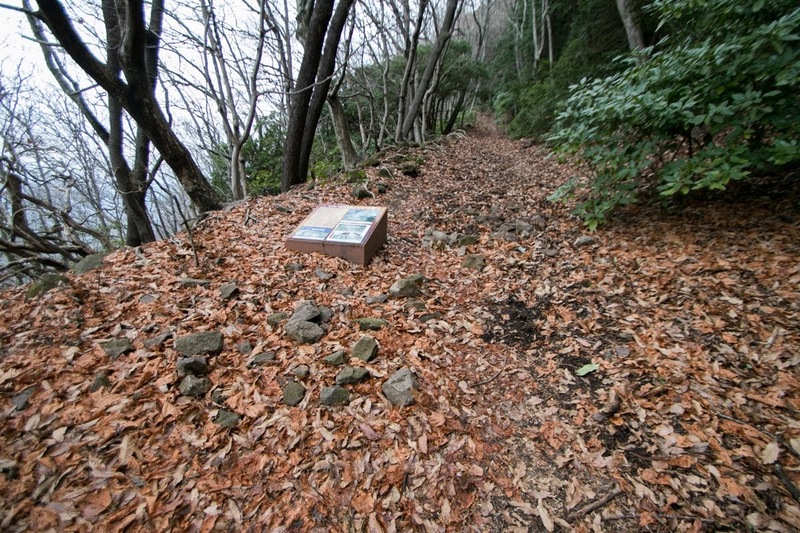 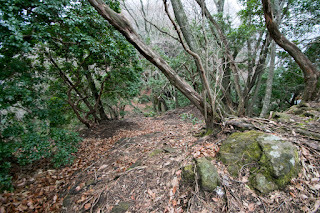 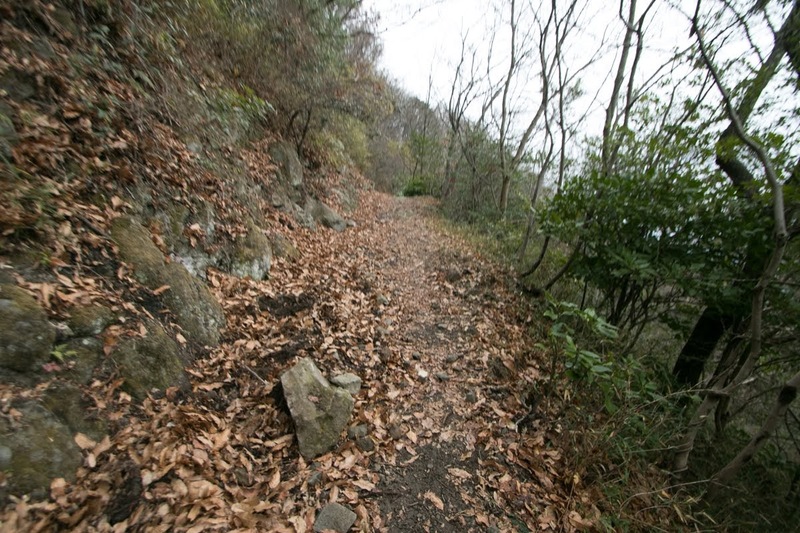 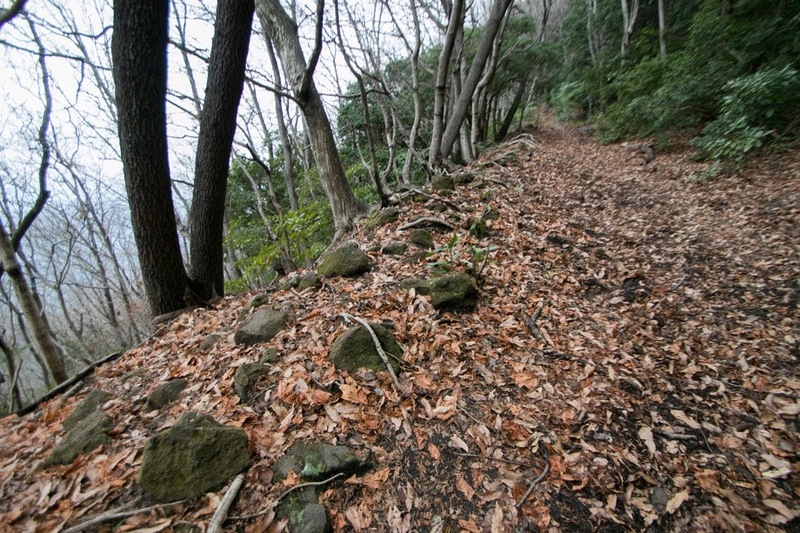 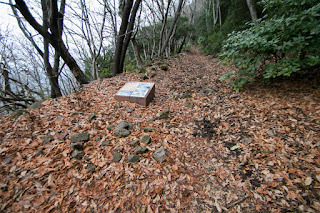 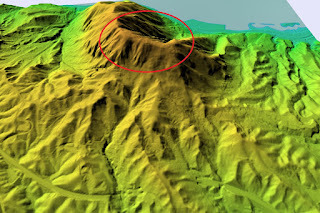 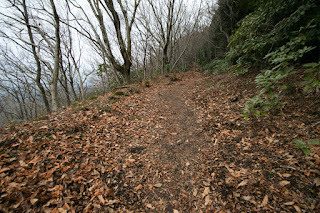 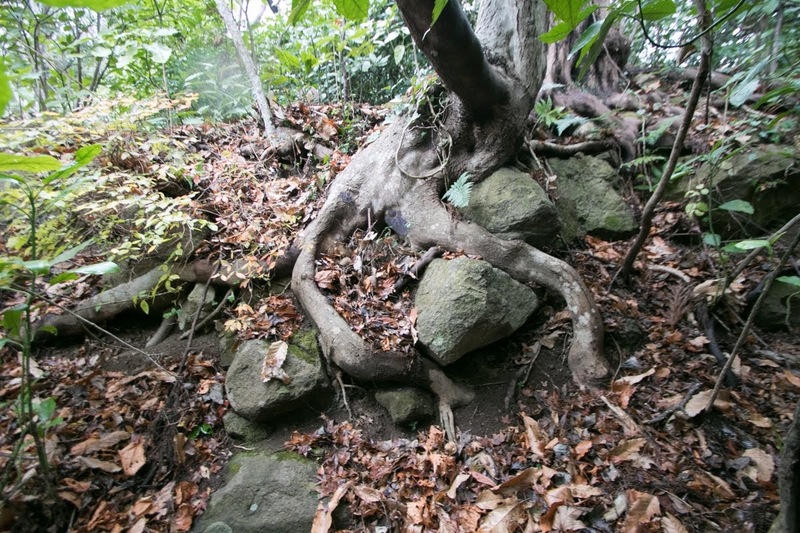 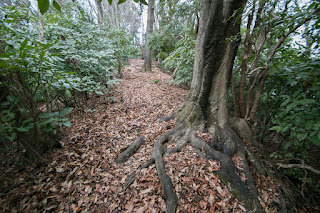 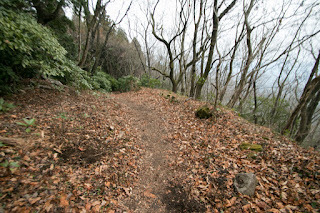 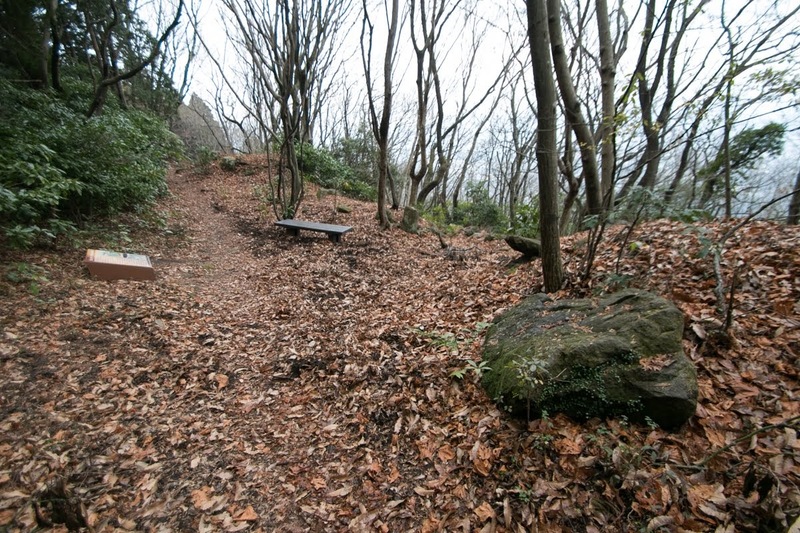 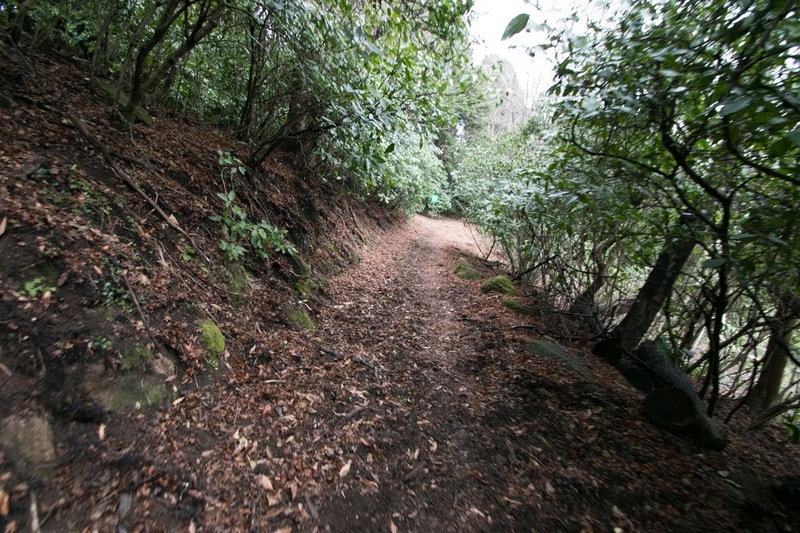 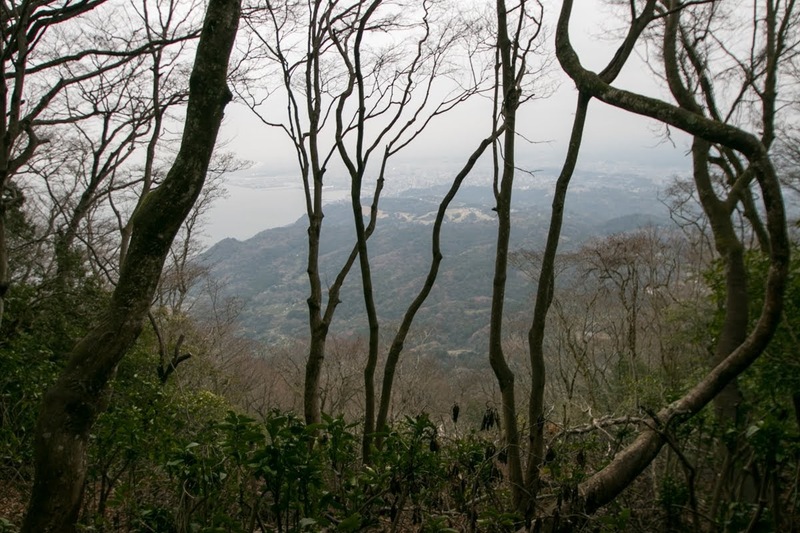 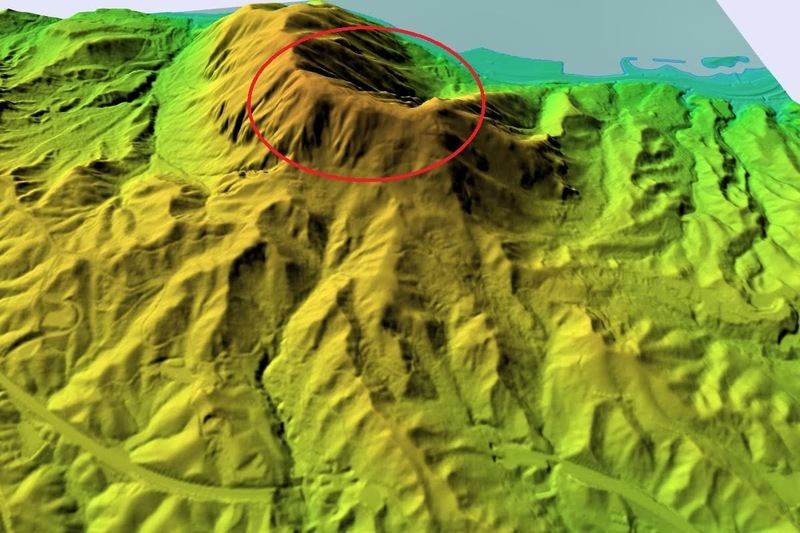 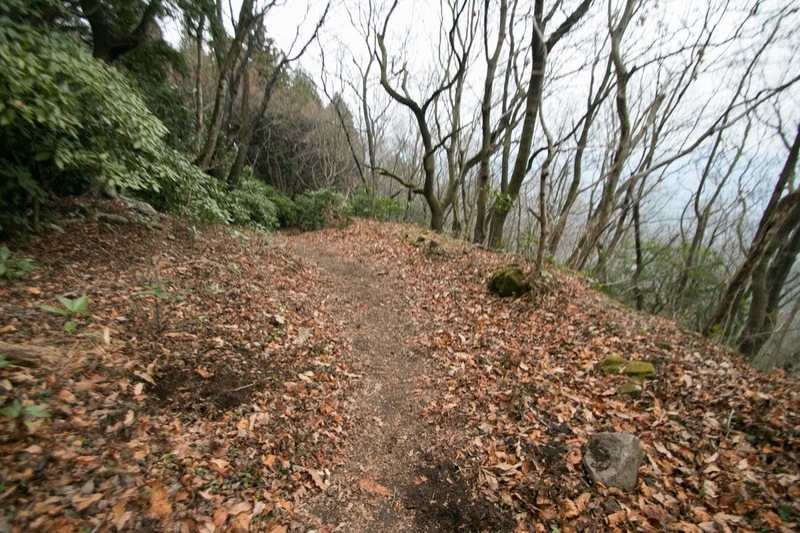 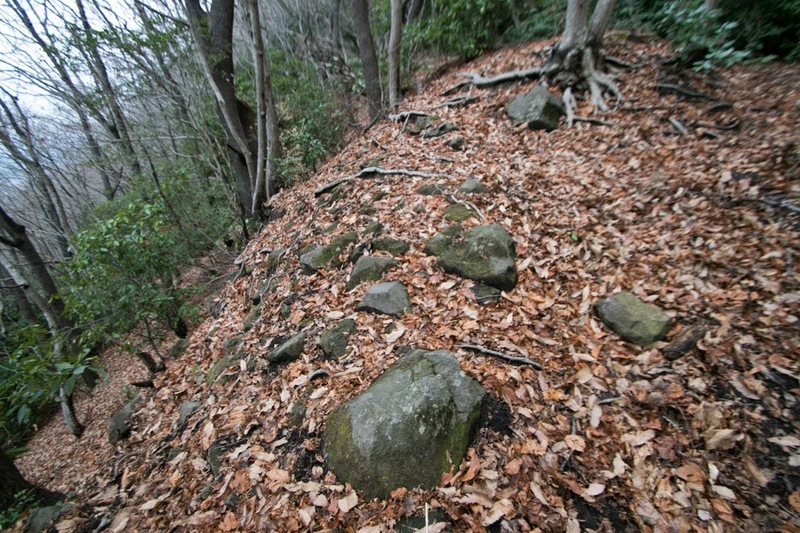 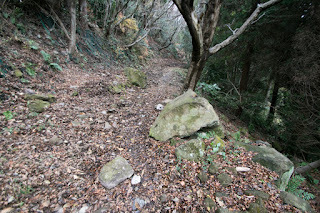 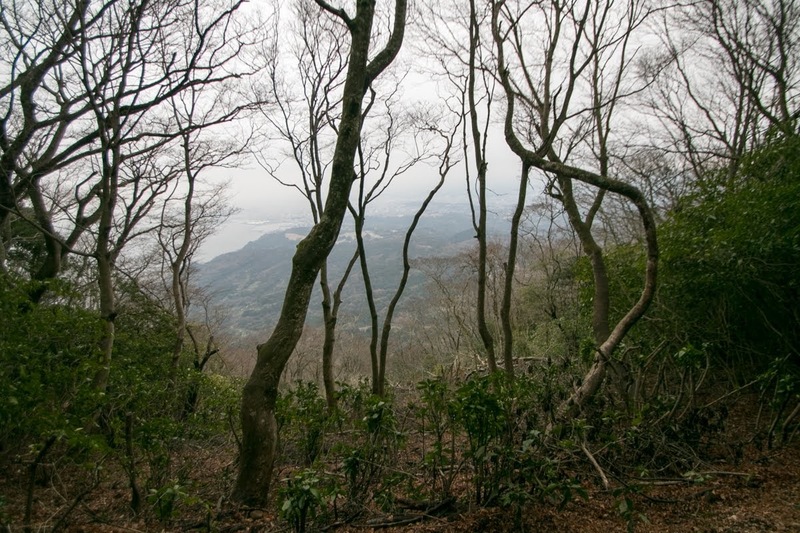 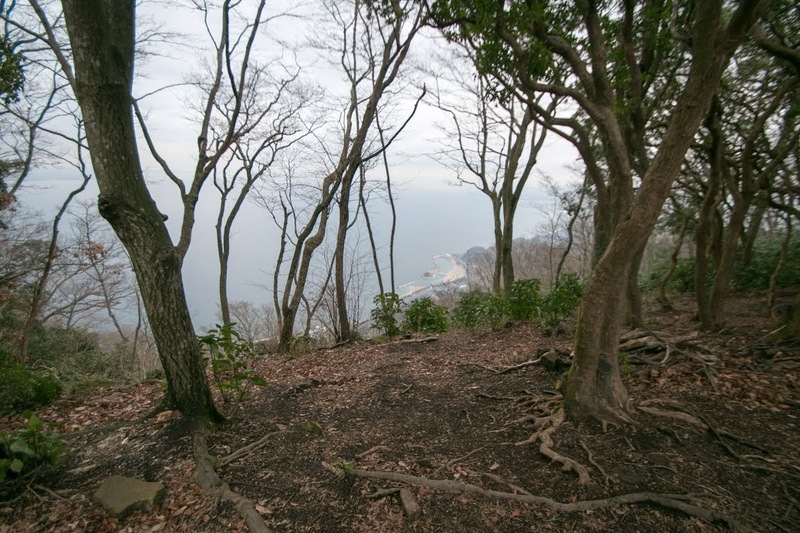 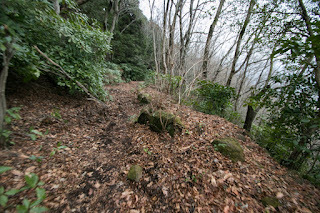 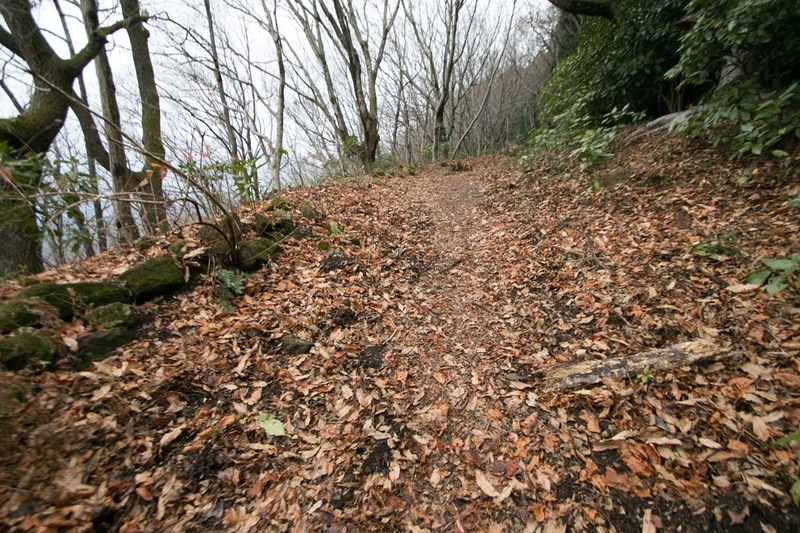 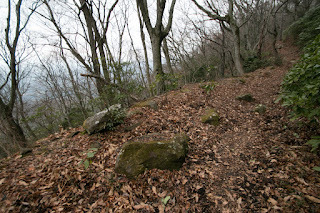 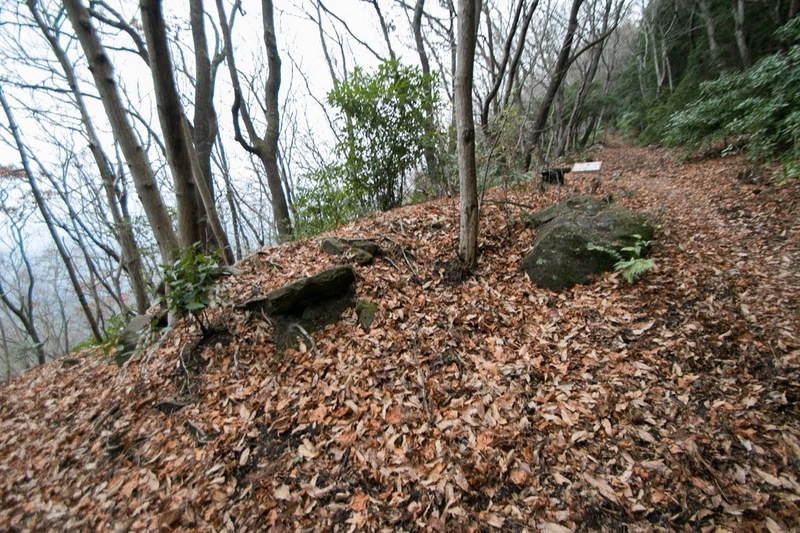 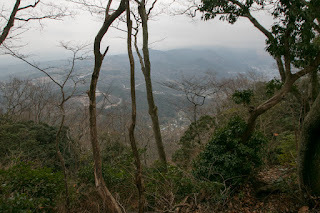 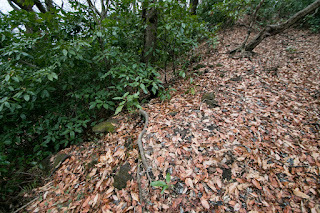 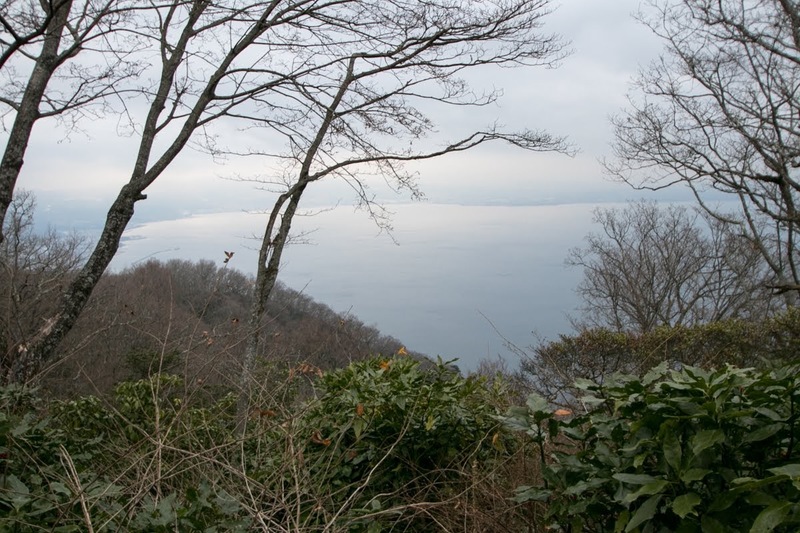 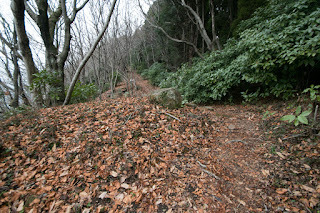 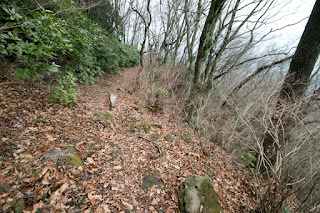 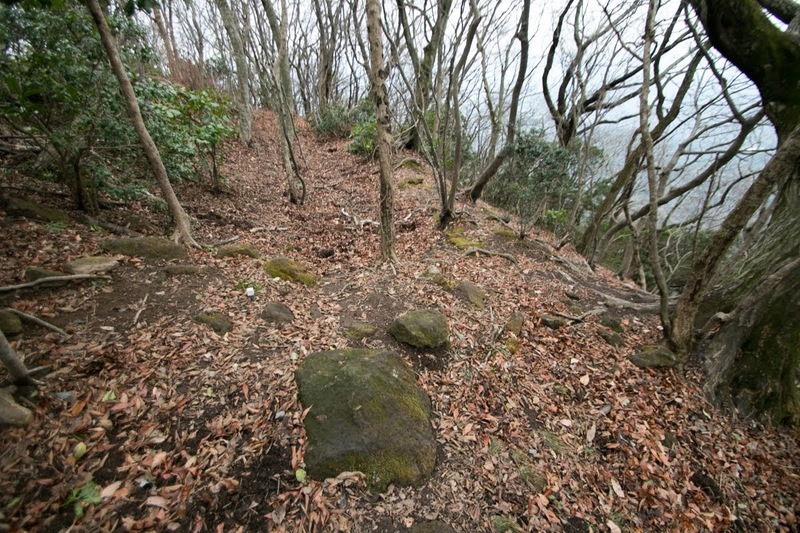 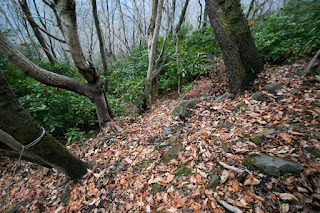 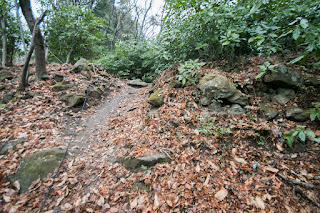 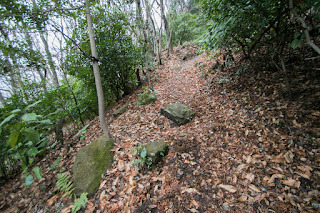 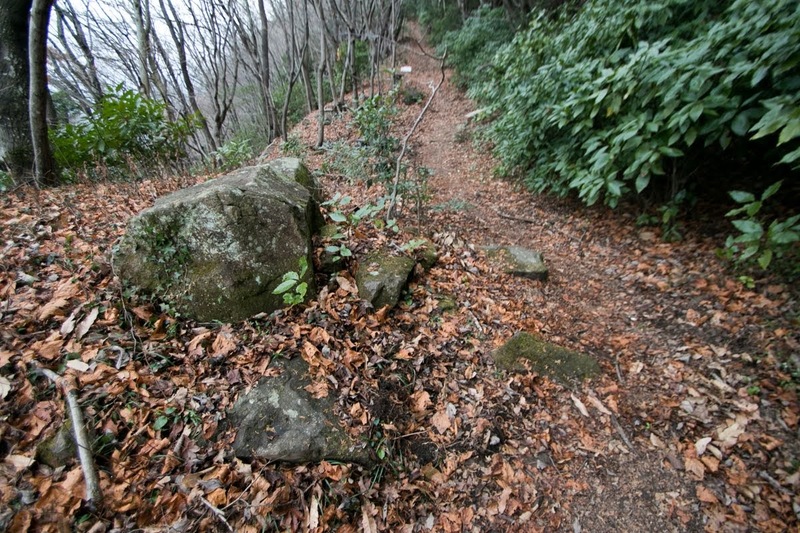 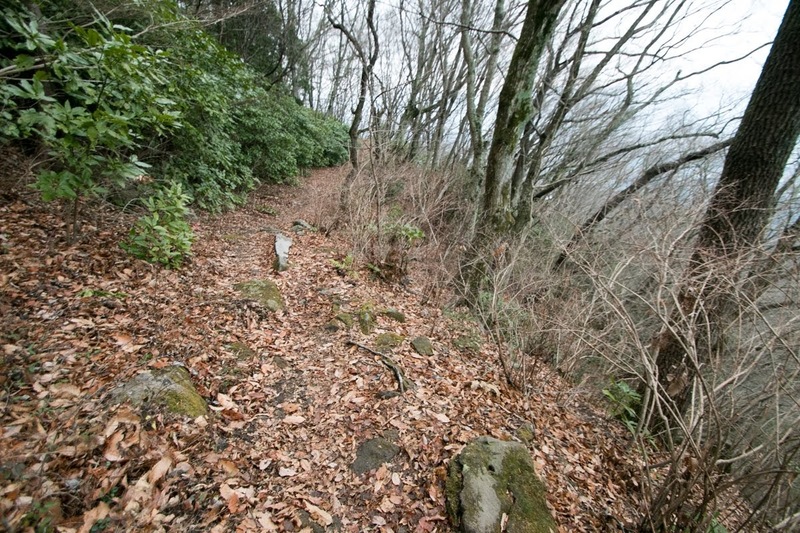 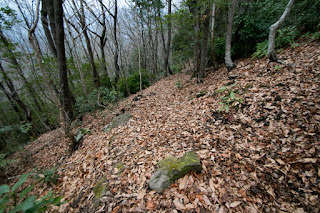 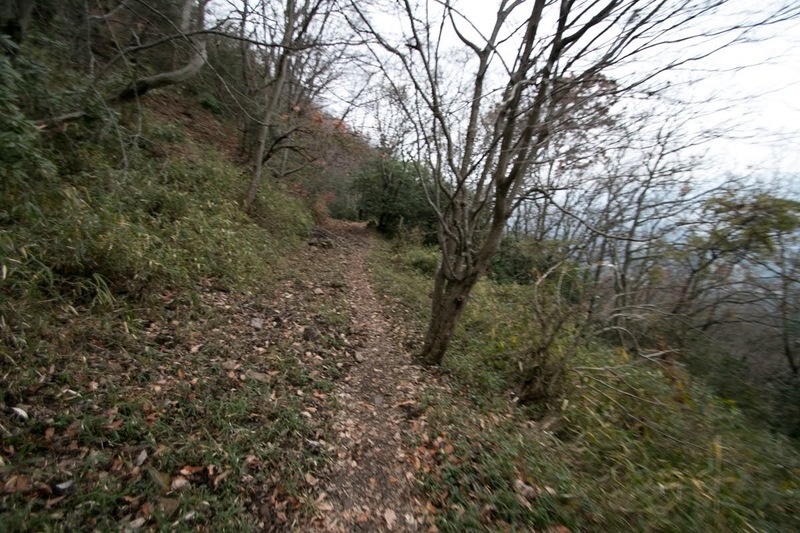 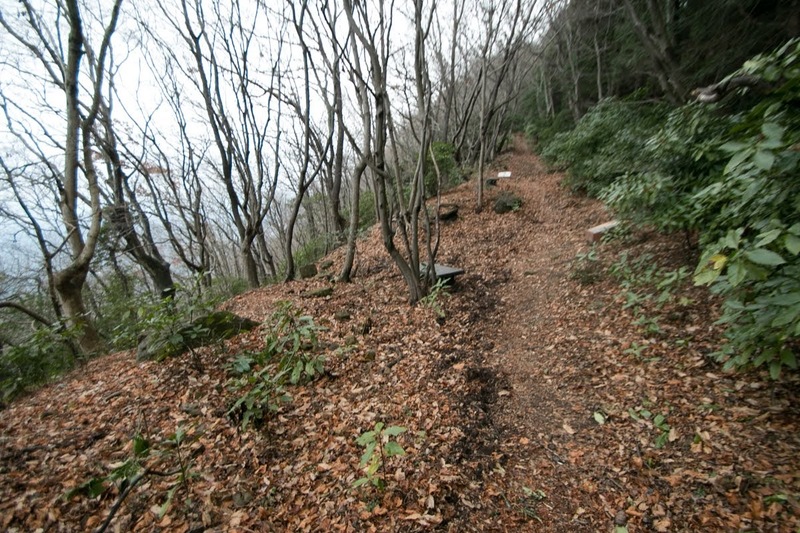 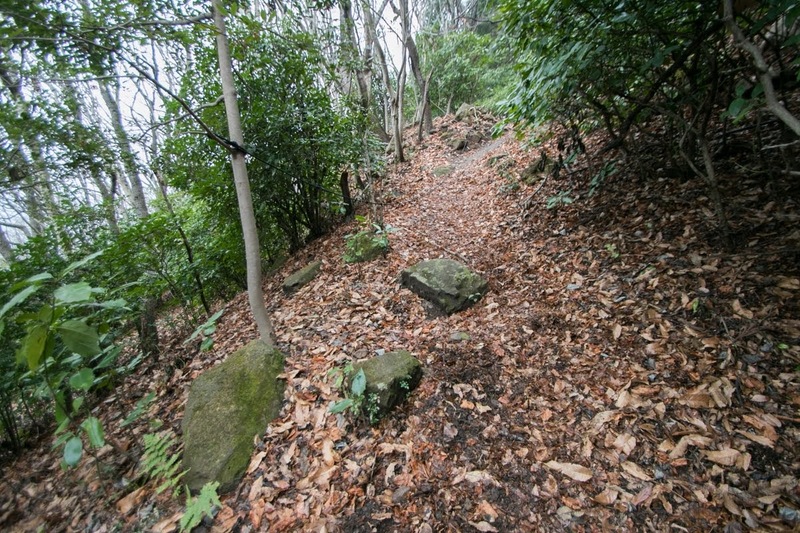 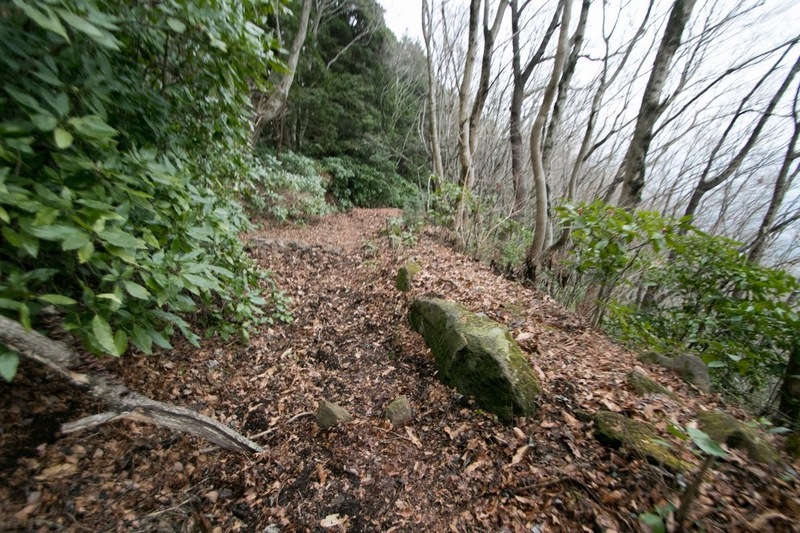 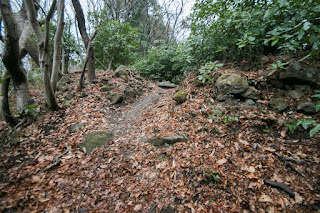 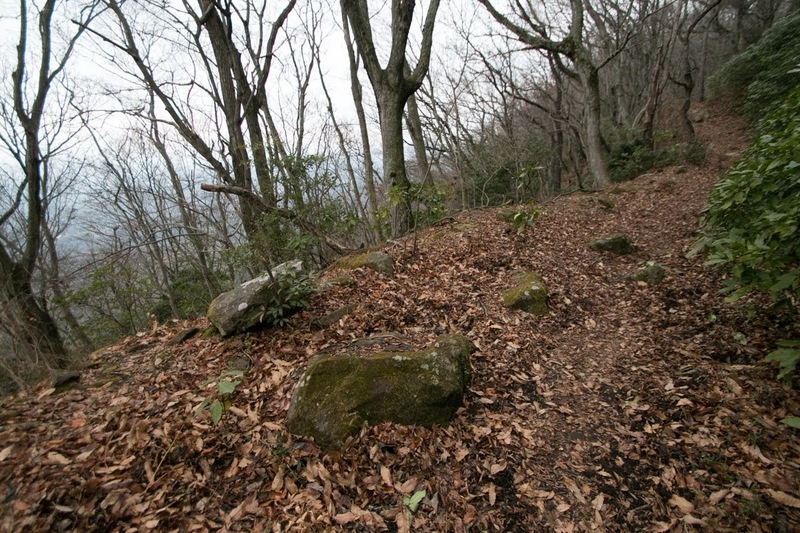 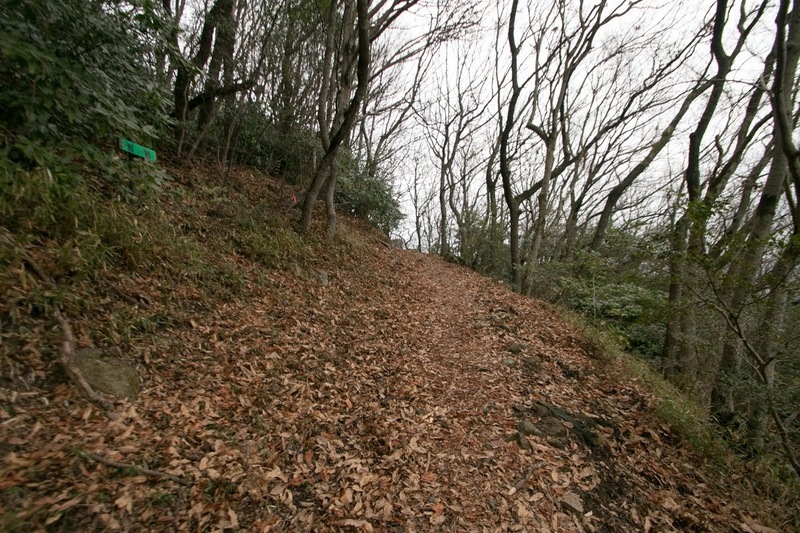 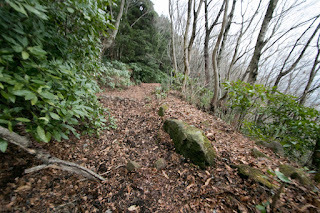 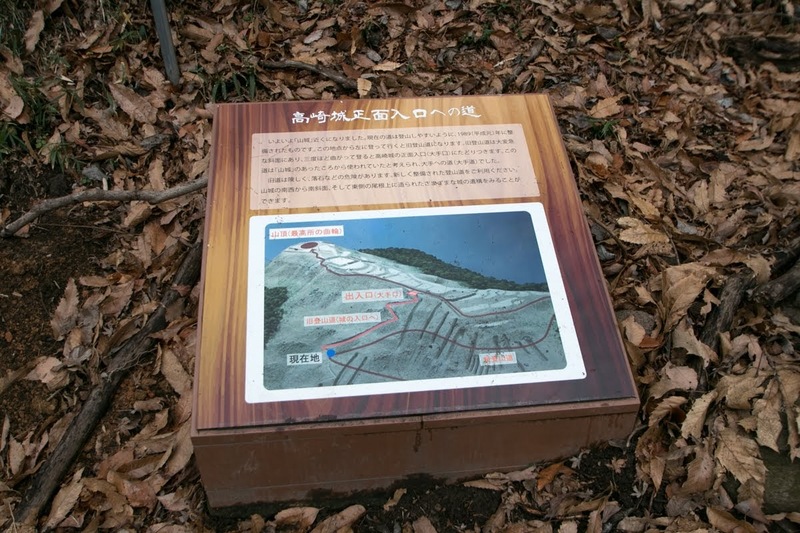 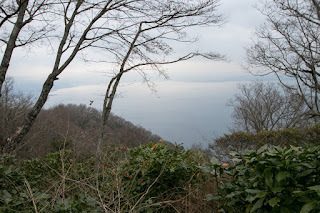 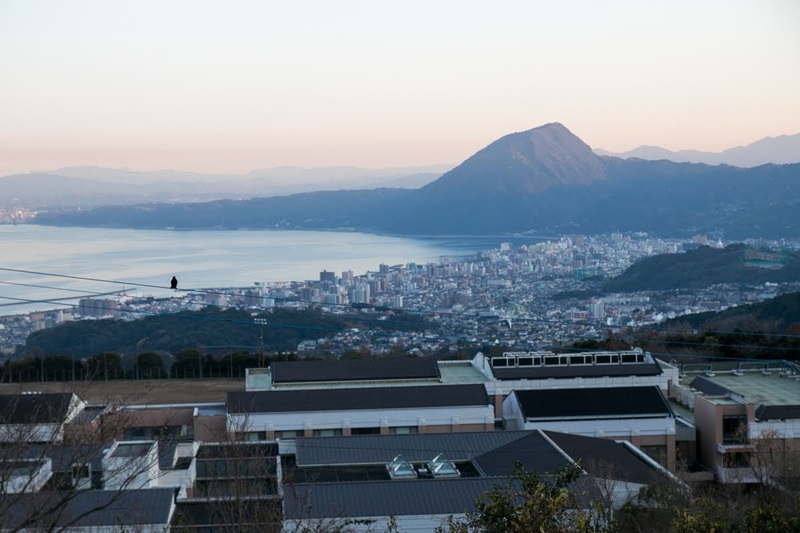 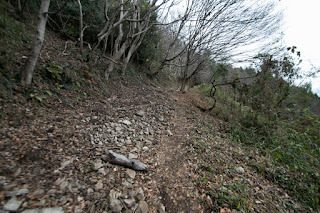 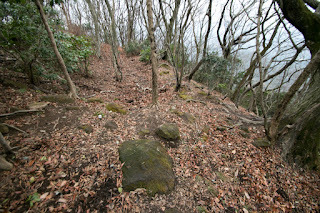 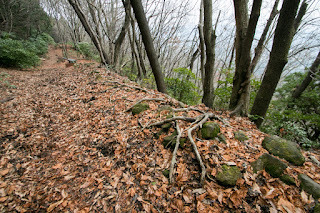 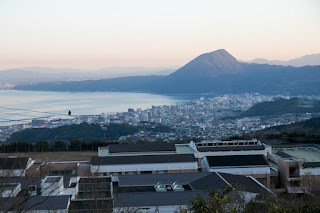 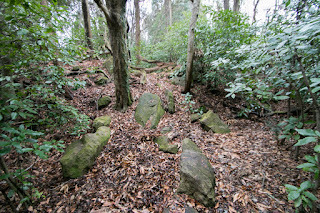 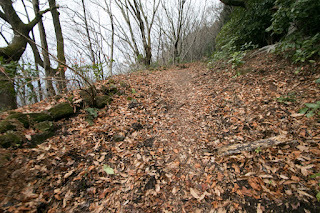 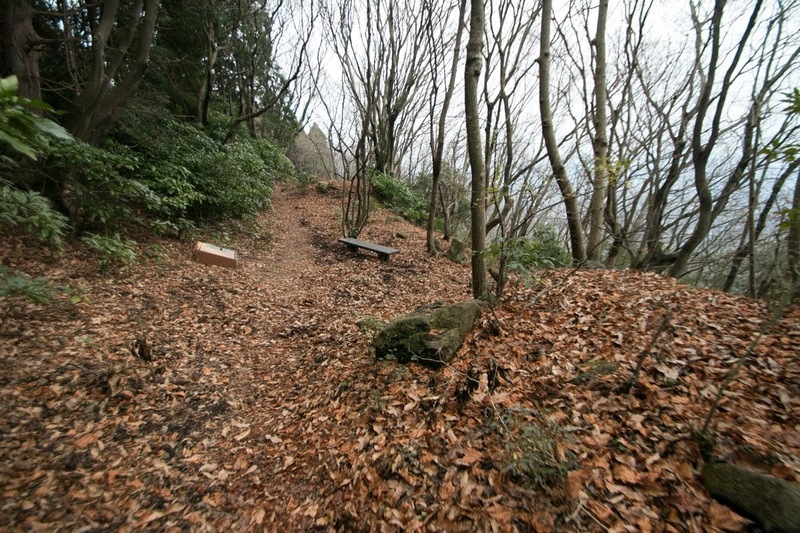 Takasaki-yama mountain was an important place to divide north coast and south coast of Beppu bay, also the north half and south half of Bungo province (Oita prefecture). 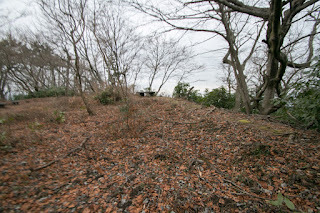 It is said that Takasaki castle was at first built by Oga clan, a traditional local lord held Oita area at the end of Heian era. 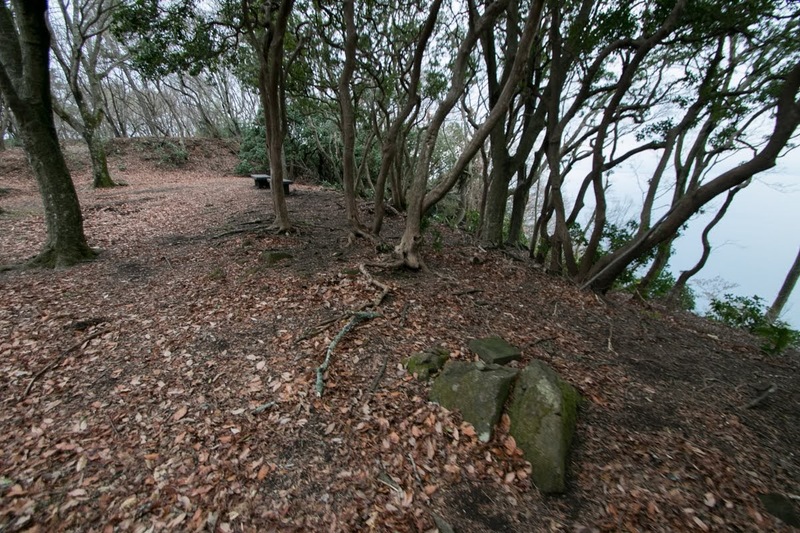 At the establishment of Kamakura Shogunate Oga clan contributed to the Shogunate, but Yoritomo Minamoto (1147-1199), the founder of Shogunate, appointed his close retainer Yoshinao Otomo (1172-1223) as the governor of Bungo province. 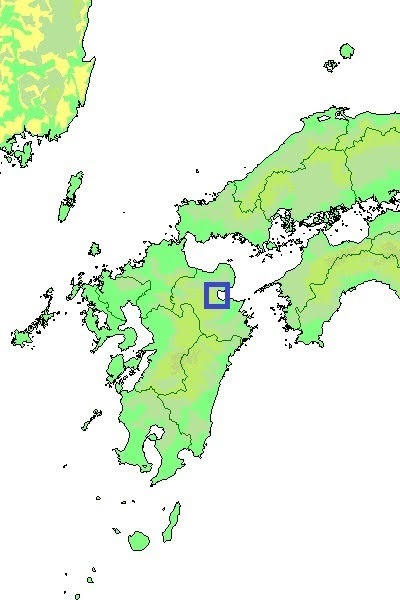 In the latter half of 13th century, Yoriyasu Otomo (1222-1300), the grandson of Yoshinao, was appointed as the commander of defense army for foreign invasion to Kyushu island, then entered Bungo province. 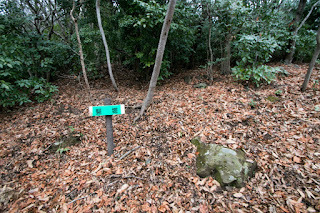 Yoriyasu activated at the defensive battle, and established the governance of Otomo clan at the province rejecting Oga clan. 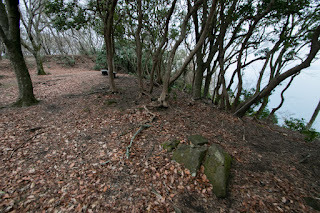 At the fall of Kamakura Shogunate in 1333, Otomo clan ruined the representative of Shogunate at Kyushu island and belonged to anti-Shogunate army. 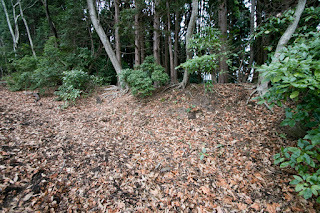 Later when Muromachi Shogunate built by Takauji Ashikaga (1305-1358) and South Court lead by Emperor Godaigo (1288-1339) became conflict, Otomo clan belonged to Shogunate side. 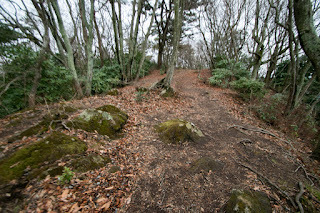 In 1353, the South Court army lead by Prince Kaneyoshi (1329-1383) grew their power under the support of Kikuchi clan and Aso clan of Higo province (Kumamoto prefecture) then marched into Bungo province. 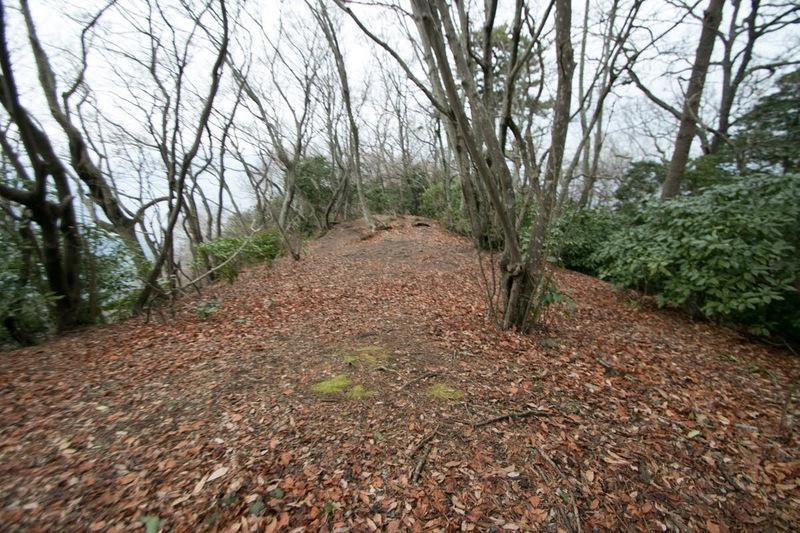 As Otomo clan did not have secure castle, Ujitoki Otomo (?-1388), the leader of Otomo clan, once surrendered to South Court army. Ujitoki Otomo secretly built a secure castle at Takasakiyama mountain then returned to Muromachi Shogunate. 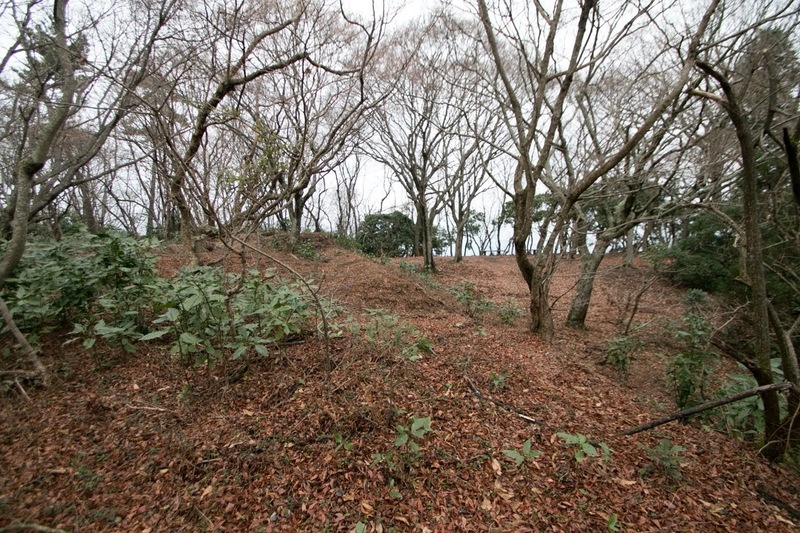 In 1358 furious South Court army intruded into Bungo province, but Otomo army well stood against overwhelming South Court army at Takasakiyama castle. 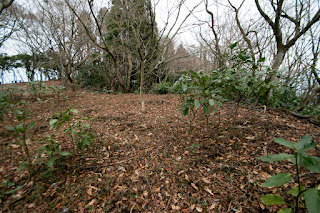 At this time Shiga clan which was the branch family of Otomo clan and important retainer attacked South Court army from backside. 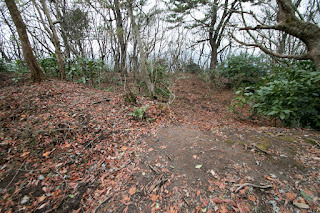 Confused South Court army retreated after the chase of Otomo army, and first attack of South Court army failed. 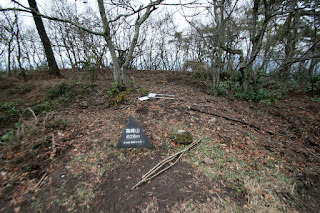 Strangely Shiga clan supported Otomo clan at the invasion of Shimazu army over 200 year later. 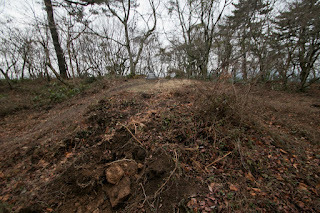 Next year South Court army attacked Takasakiyama castle again, but could not fall it again. 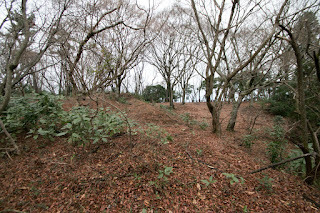 But in 1359, Muromachi Shogunate army including Otomo army and South Court army fought at Chikugo-gawa river, then South Court army broke Shogunate army and captured Dazaifu city, the vice capital of Japan. 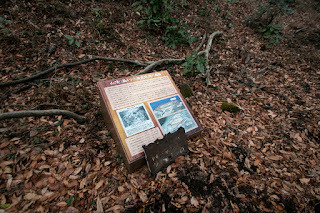 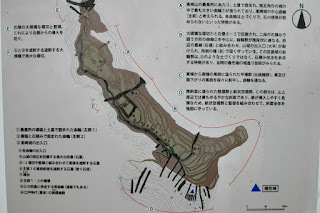 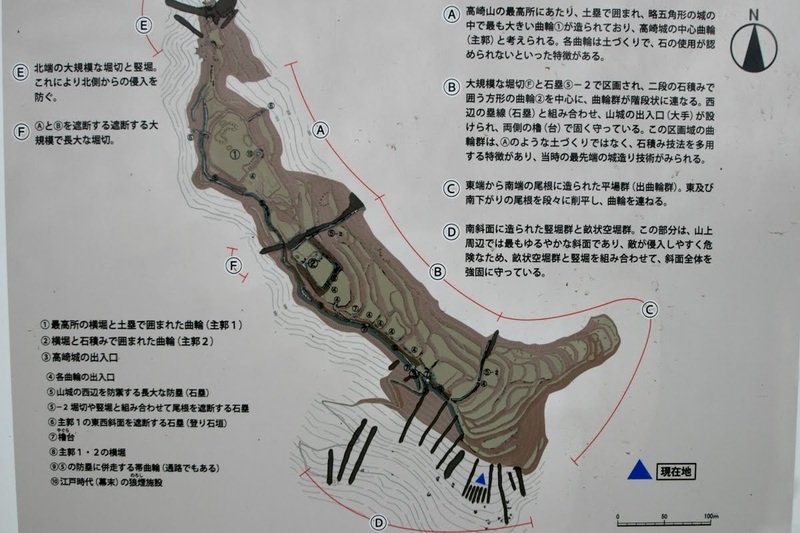 Most part of Kyushu island was seized by South Court army at that time. Looking at this situation, Otomo clan surrendered to the South Court again. 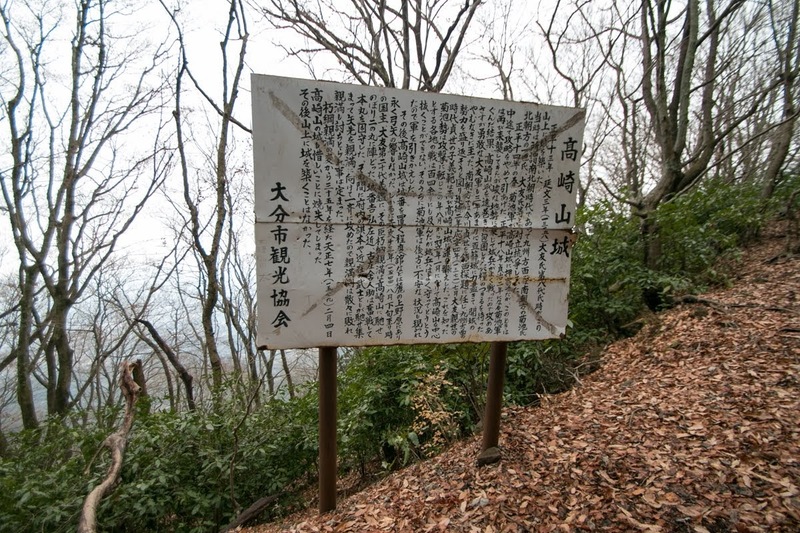 But around 1370, Muromachi Shogunate appointed Sadayo Imagawa (1329-1420) who was a talented lord as a commander of Kyushu area. 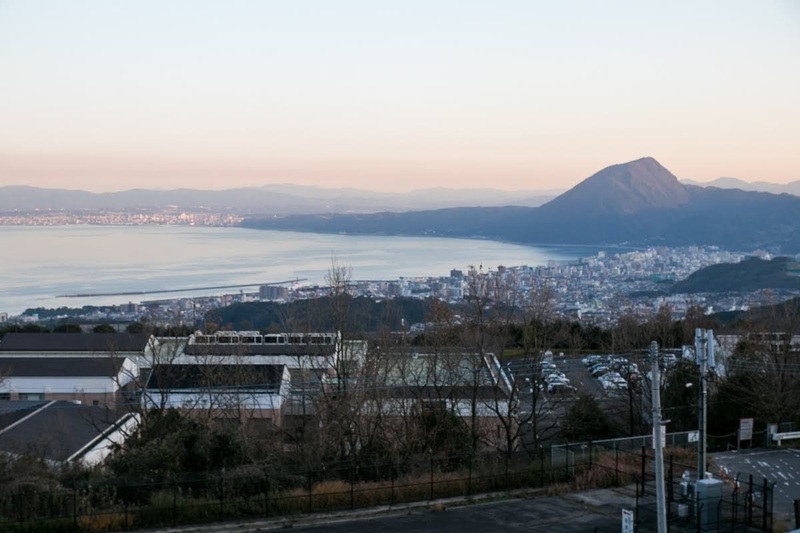 Sadayo sent his son to Takasaki castle from sea, and Sadayo and his younger brother attacked from north part of Kyushu island. 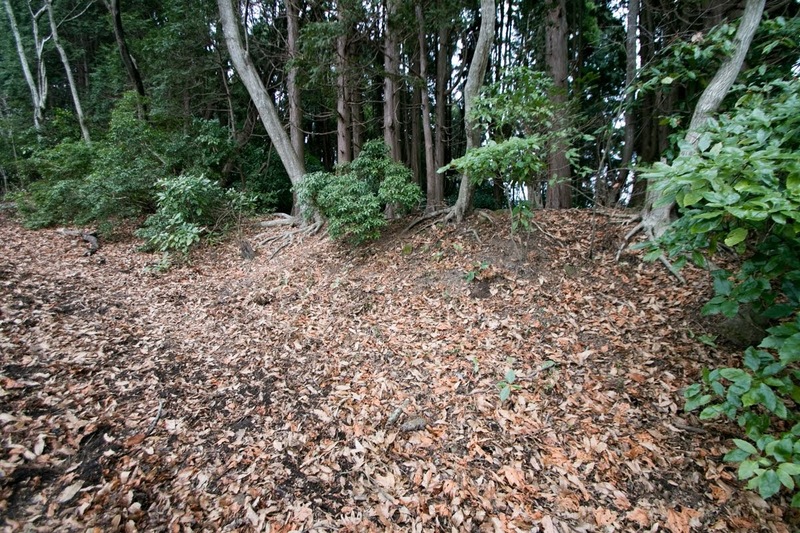 Looking at this situation, South Court army lead by Takemitsu Kikuchi (1319-1373) made total attack to Takasaki castle, to secure the backward. 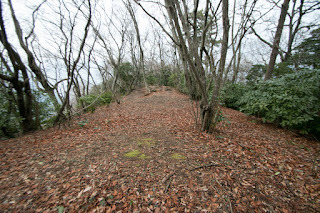 It is recorded that there were 100 battles during half year, but Otomo army securely held the castle. 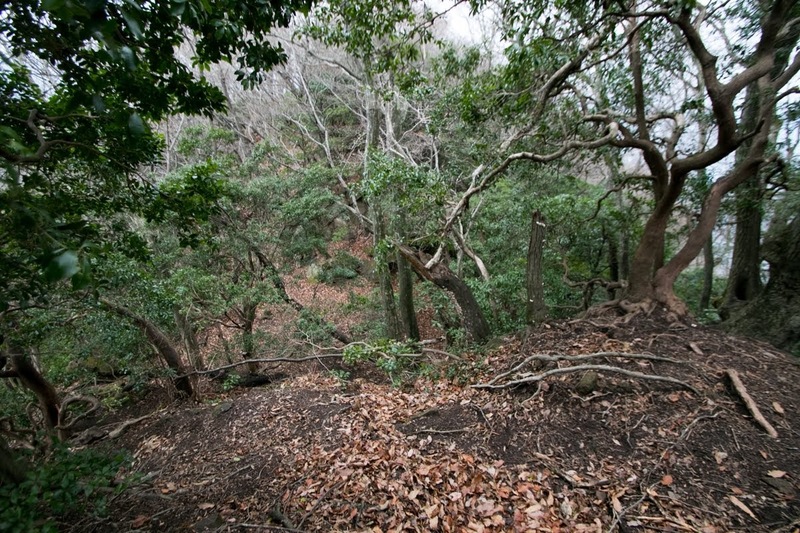 Among that the main army of Sadayo Imagawa approached to Dazaifu city, then South Court army gave up the siege and left. Just after that South Court army left Dazaifu city facing the attack of Sadayo Imagawa, then the power of South Court and Muromachi Shogunate at Kyushu island totally reversed. 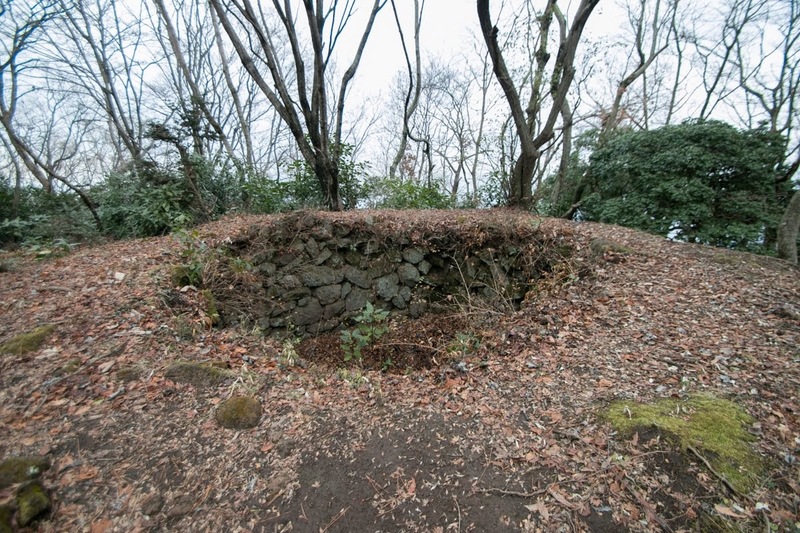 Otomo clan achieved the fame at Takasakiyama castle, and in spite of internal conflicts in 15th century it became the basis of expansion in 16th century. 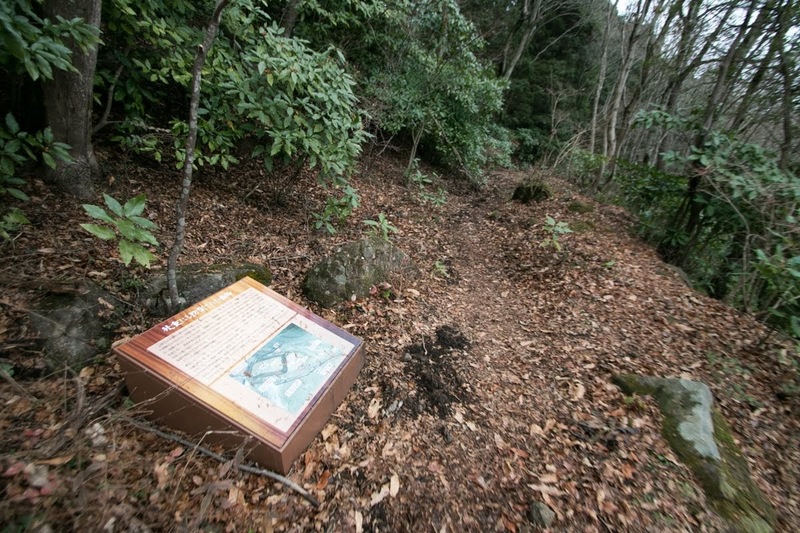 In the former half of 16th century, Otomo clan overcame its internal conflicts and the battle against Ouchi clan, the powerful warlord of Suo province (Yamaguchi prefecture), grew as a strong warlord. Funai town which was the main base of Otomo clan prospered at the mouth of Oita-gawa river, but only had a small hill at backside. 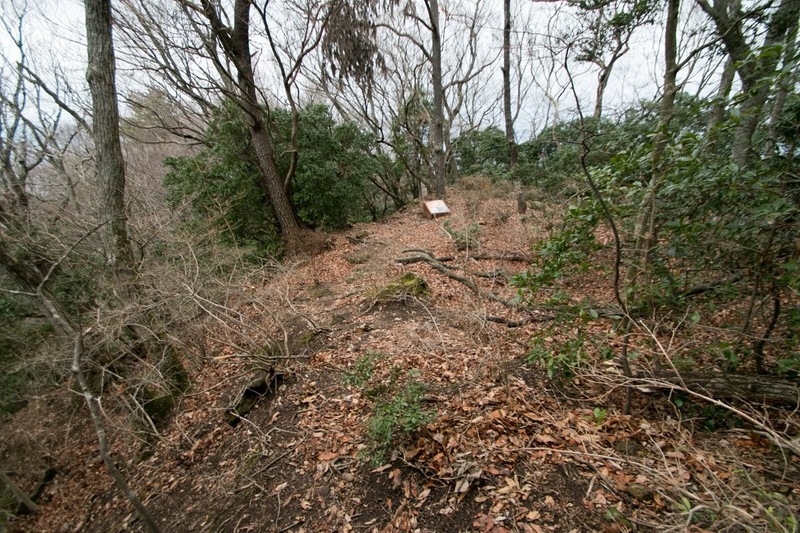 Because of this situation, Otomo clan expanded Takasaki castle as a evacuation place. 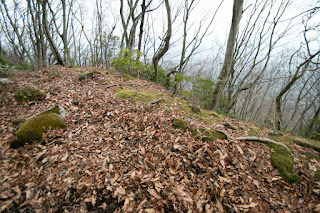 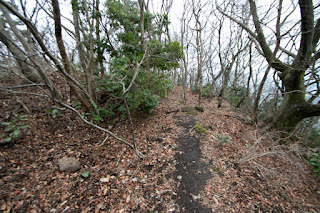 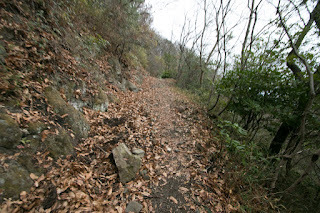 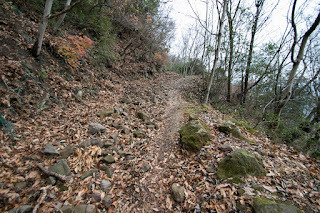 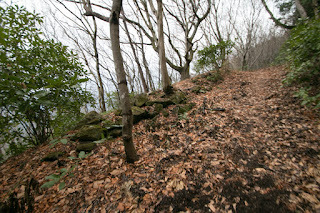 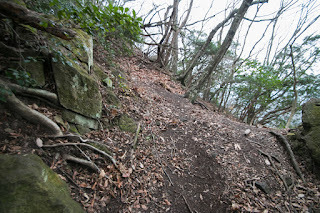 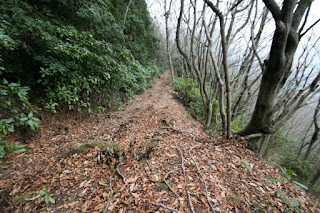 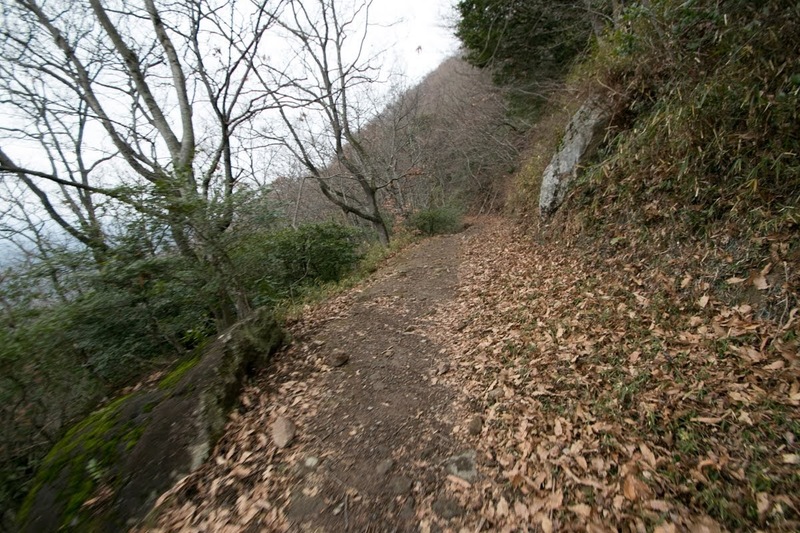 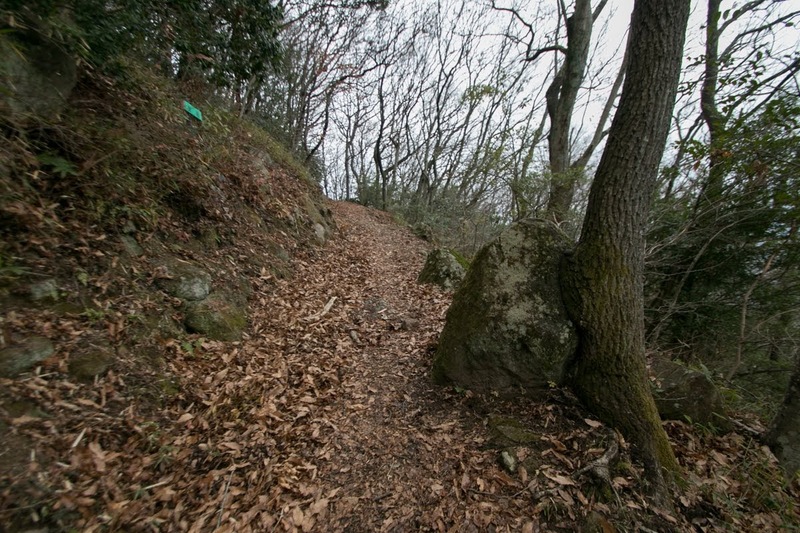 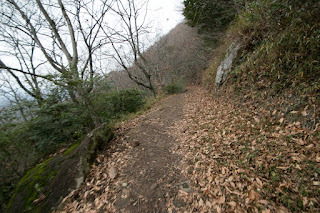 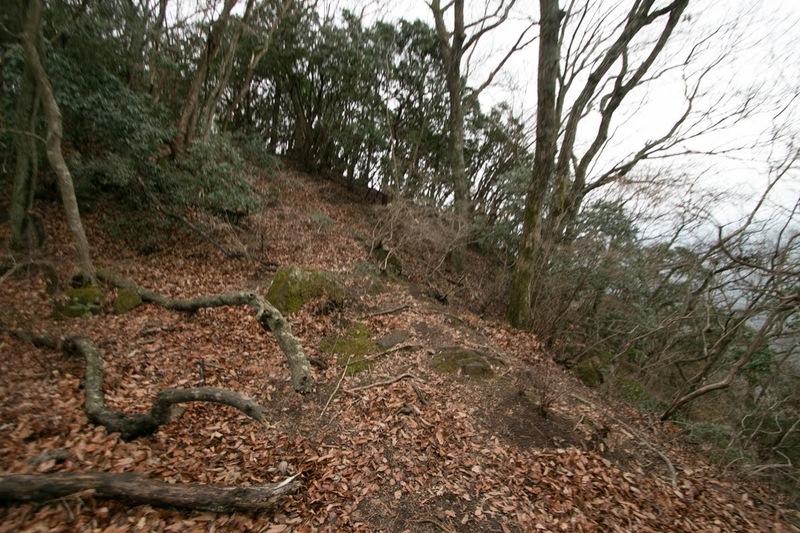 Sheer cliff of the mountain and good perspective was appropriate to retreat from Funai city temporally and order the counter attack in case of emergency. 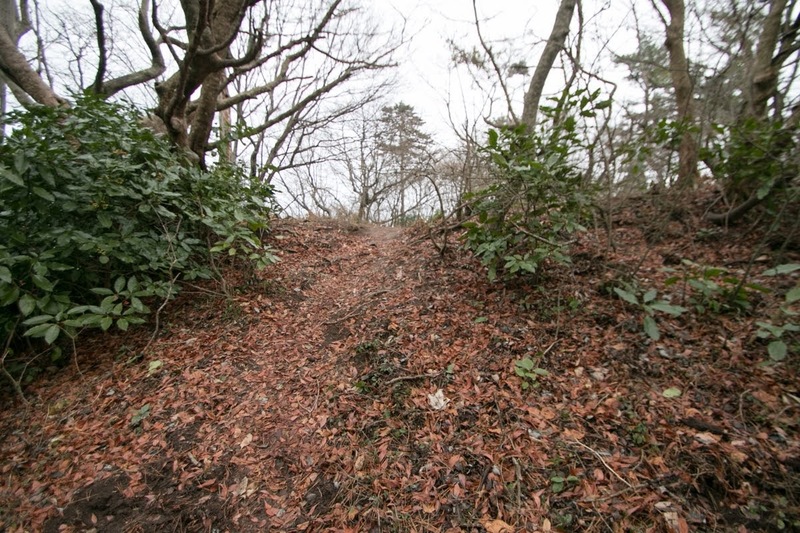 In 1518 Chikamitsu Kutani (?-1518), a retainer of Otomo clan rebelled at this castle but was later ruined. 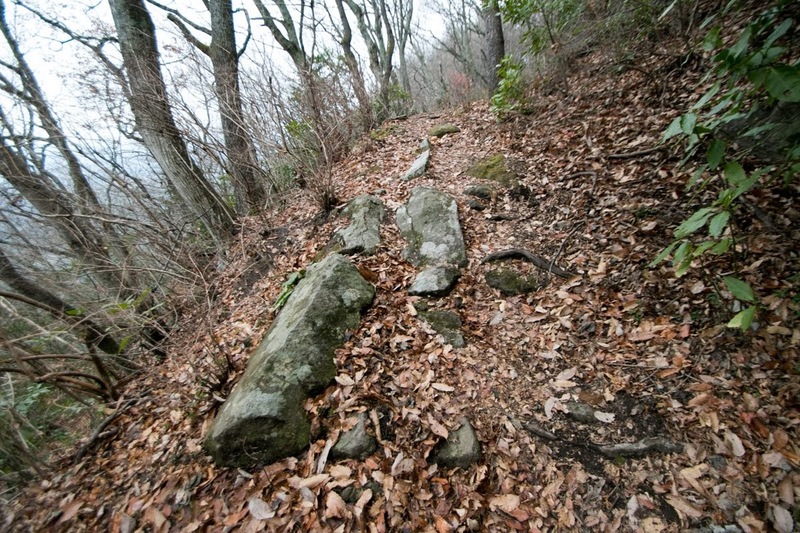 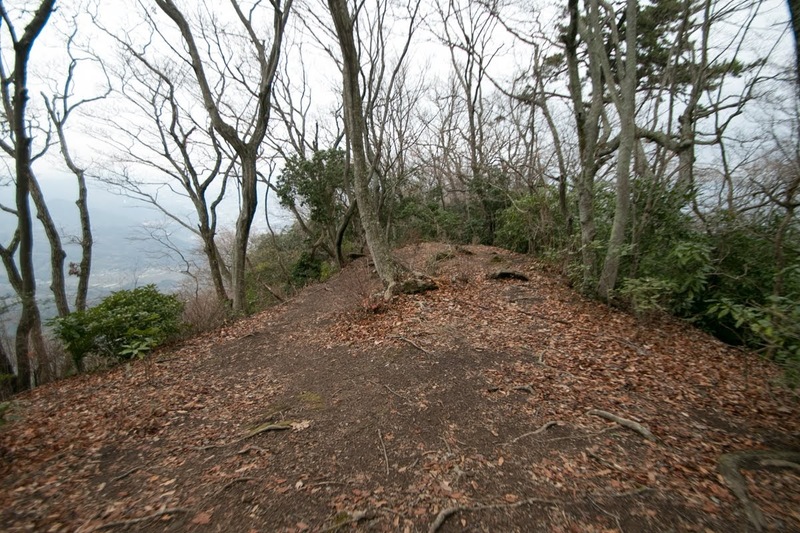 The core part of the castle spreads over gentle slope prolongs from the peak of the mountain toward southeast. 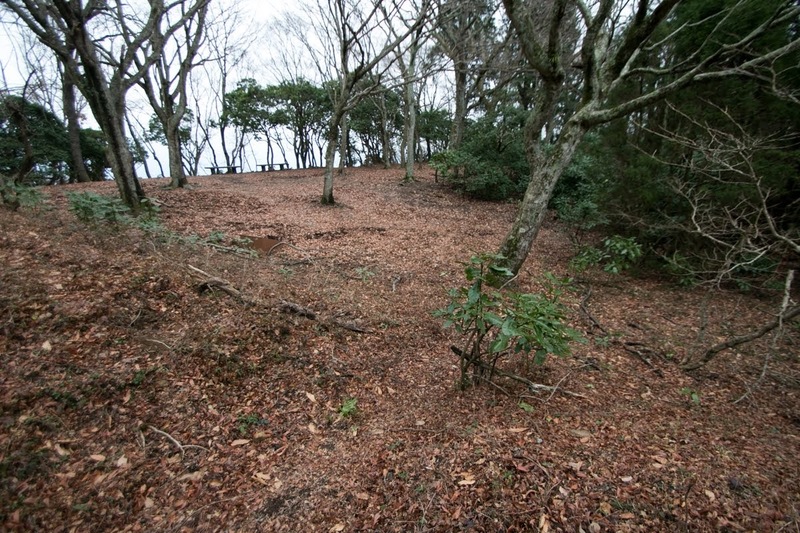 Central area of the castle is a square shaped area of about 80 meter long surrounded by clay wall. 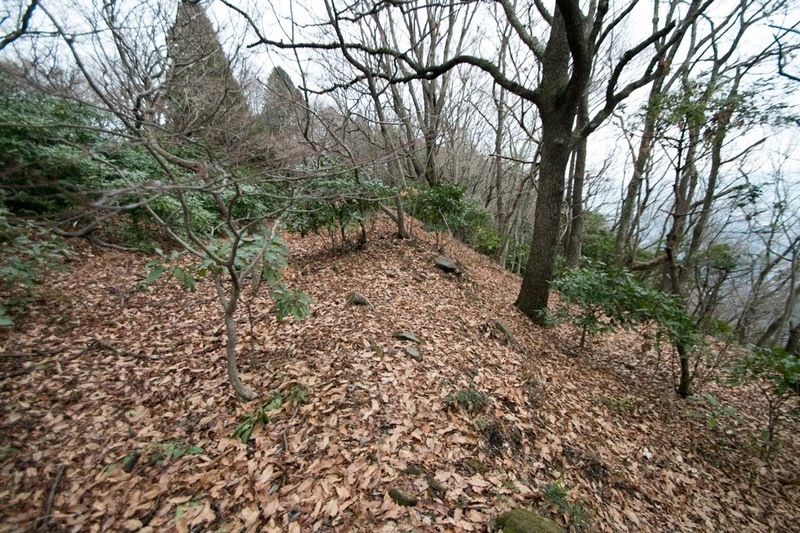 The shape of the area is resembles to the residence of medieval governor, and there might be a main building of the lord. 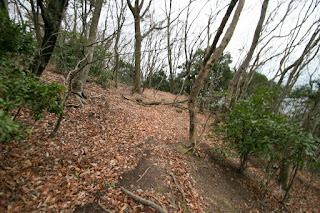 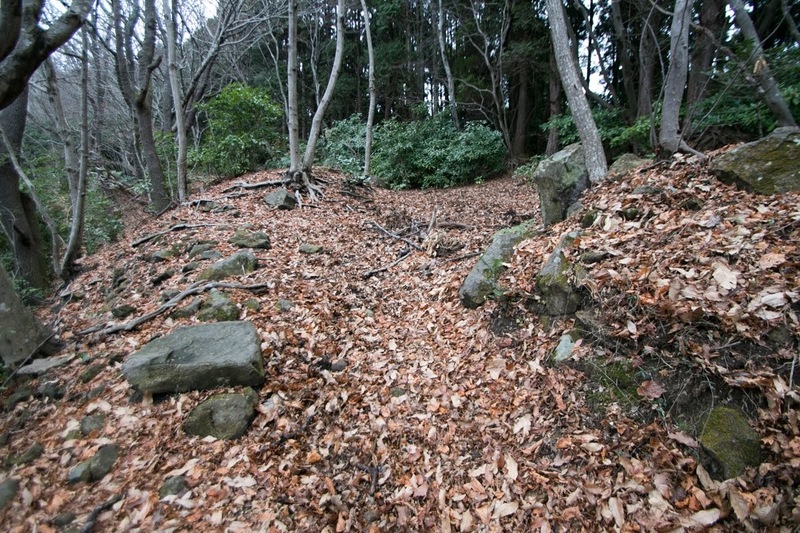 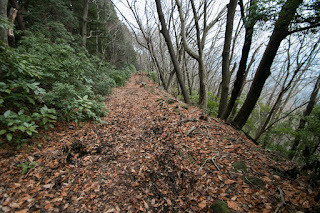 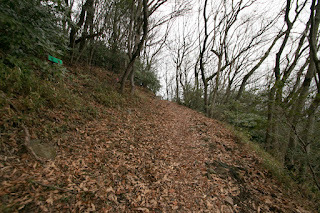 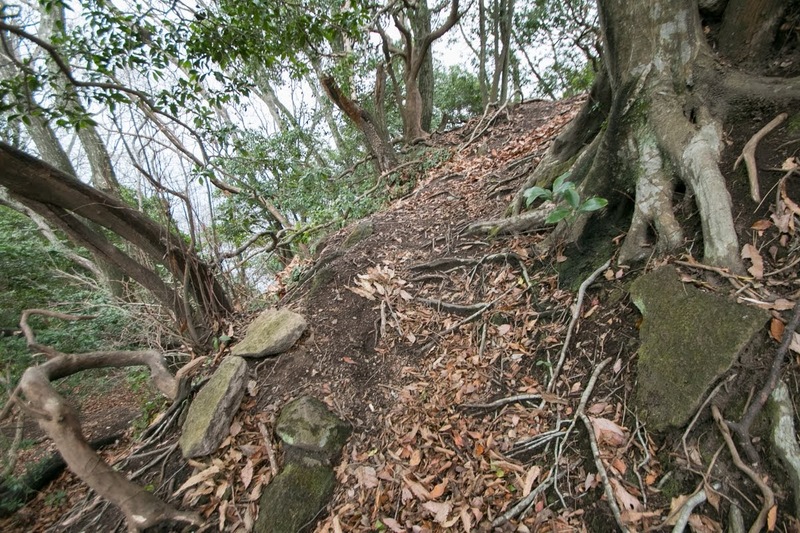 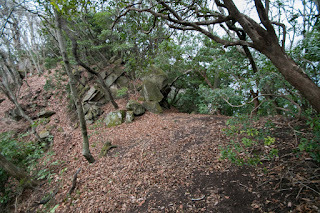 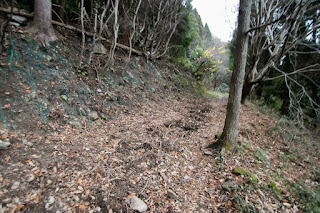 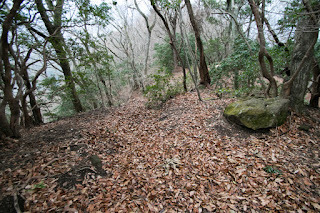 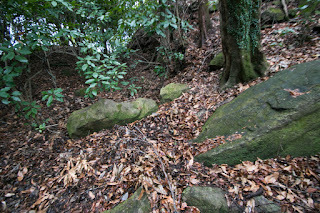 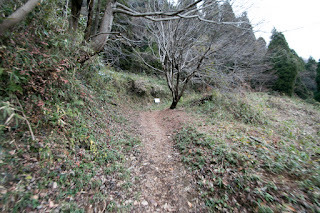 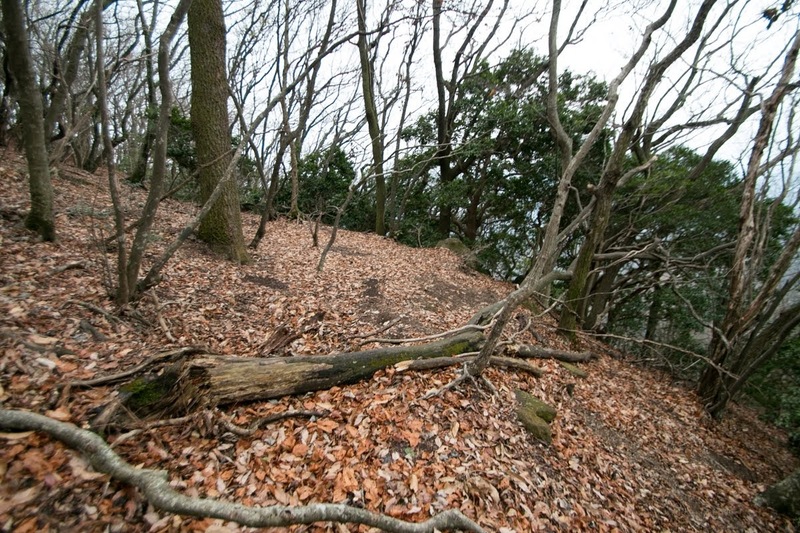 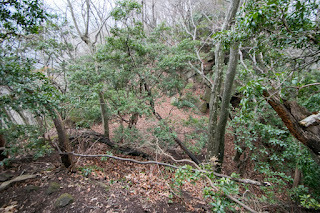 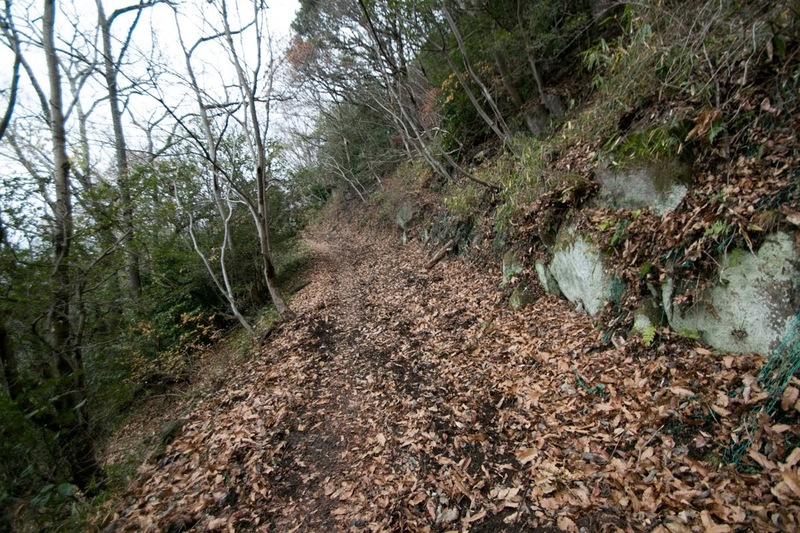 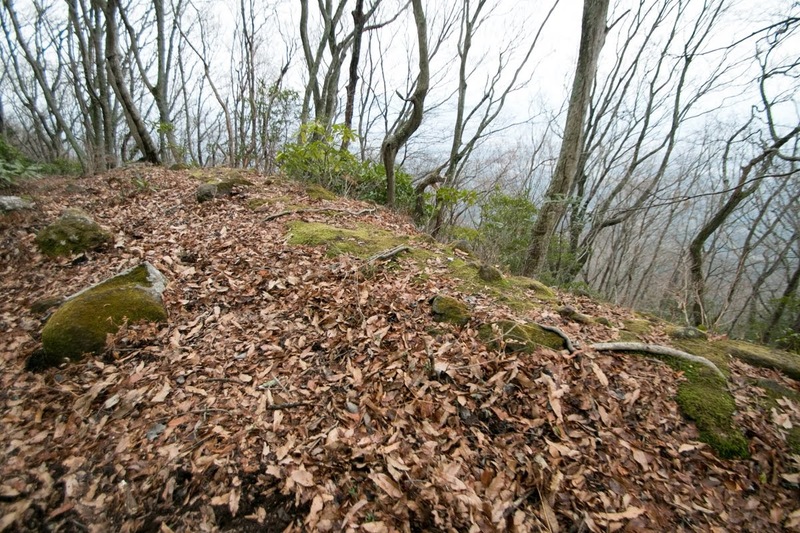 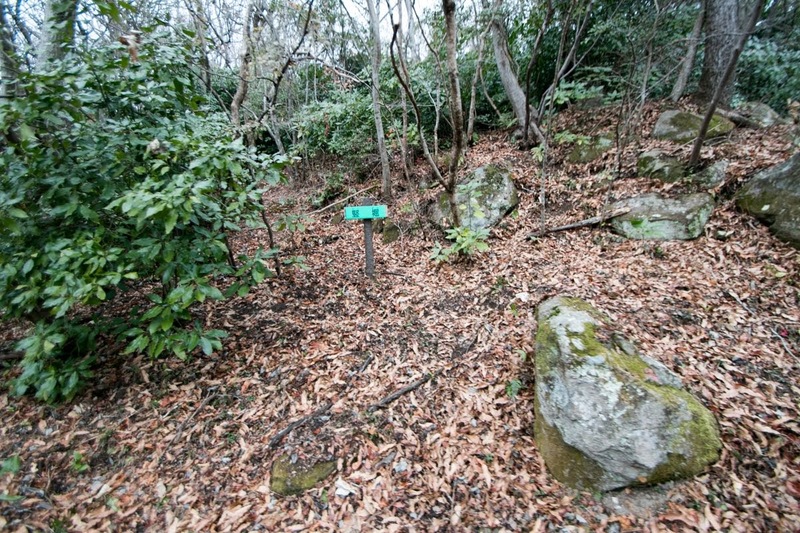 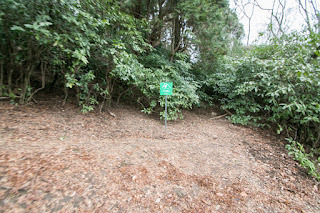 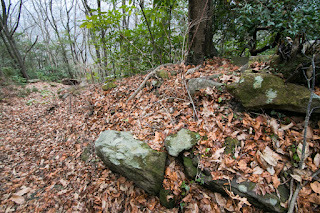 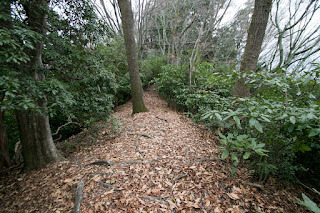 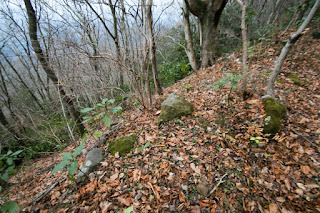 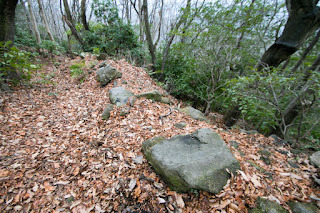 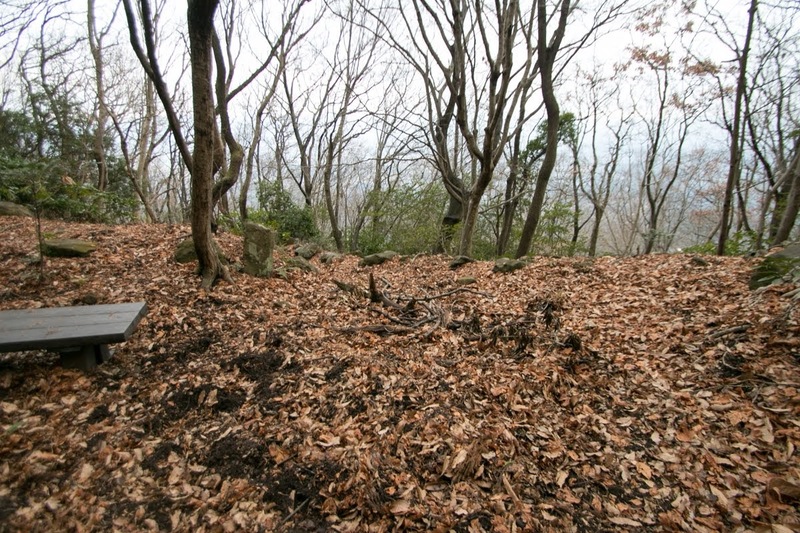 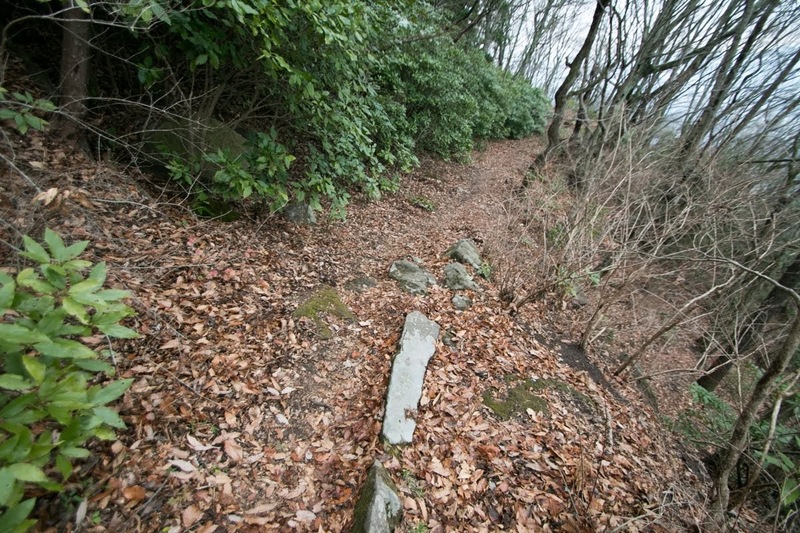 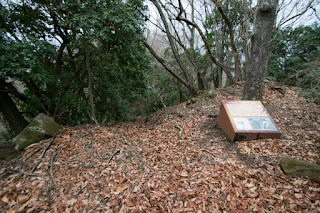 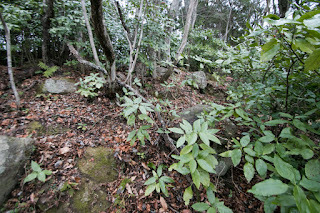 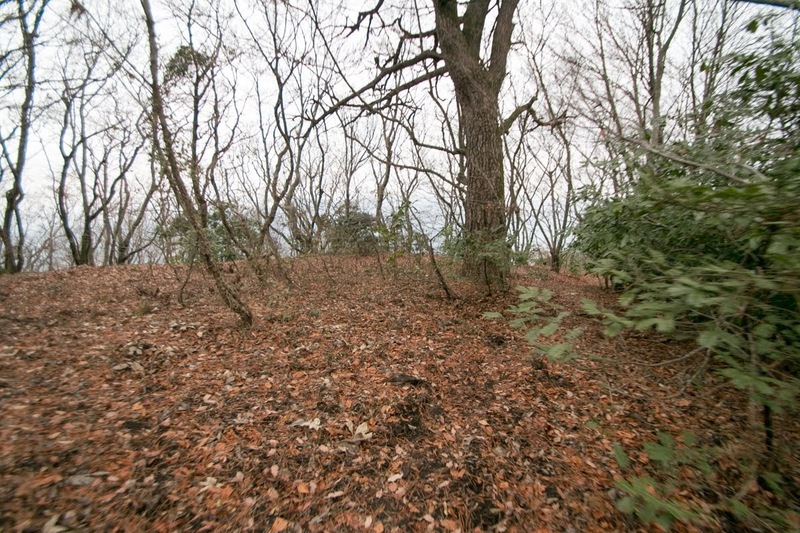 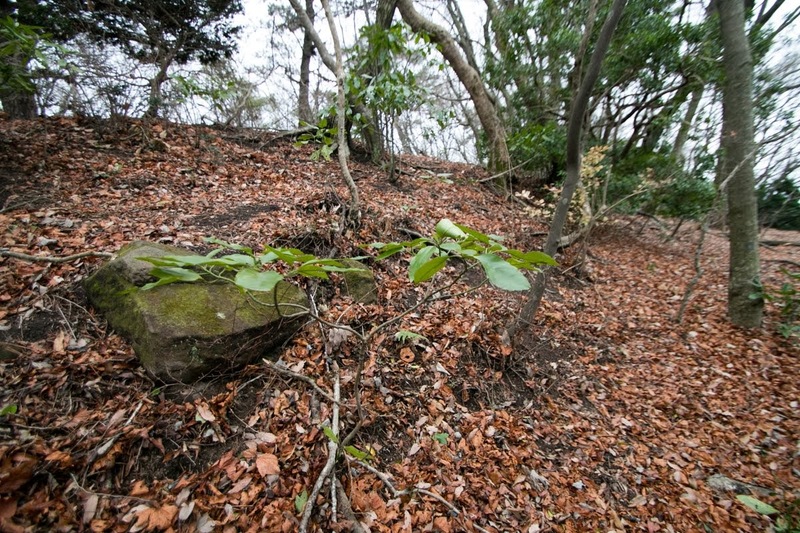 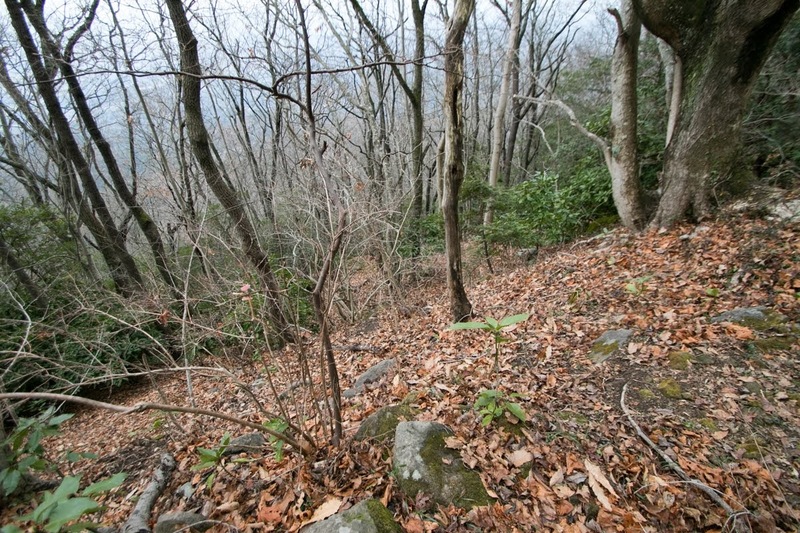 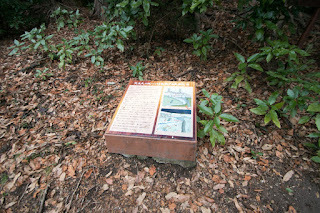 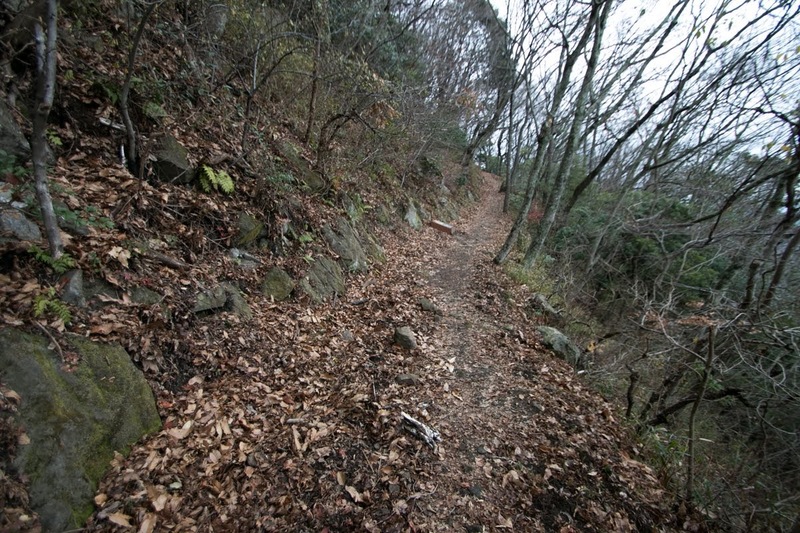 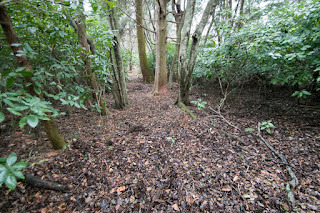 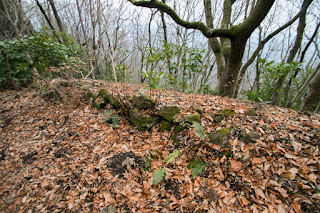 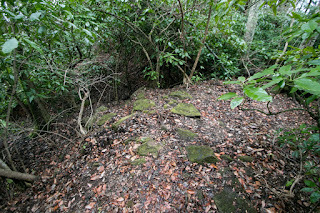 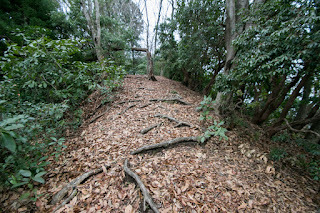 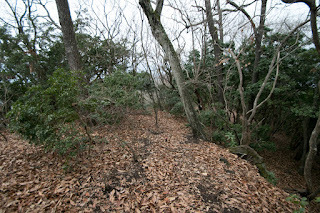 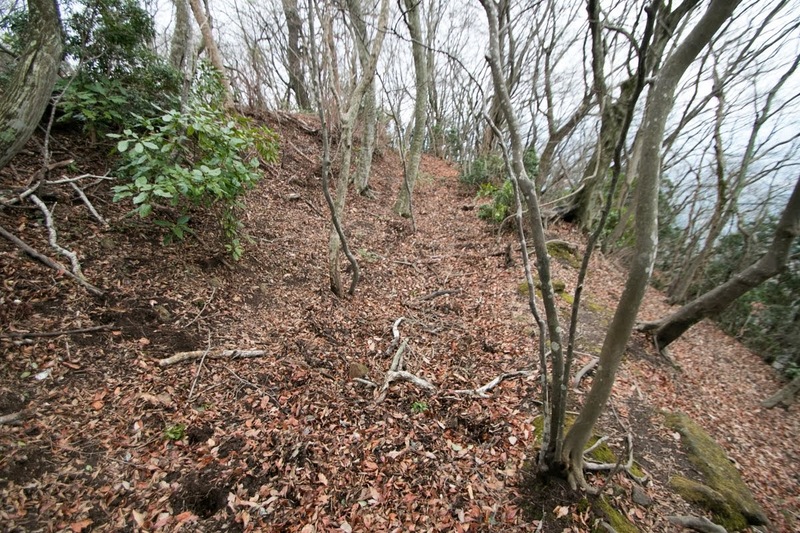 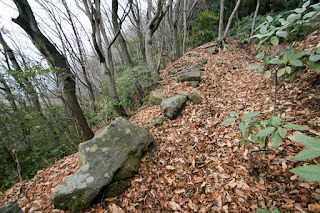 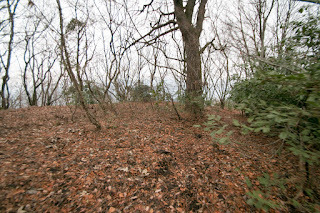 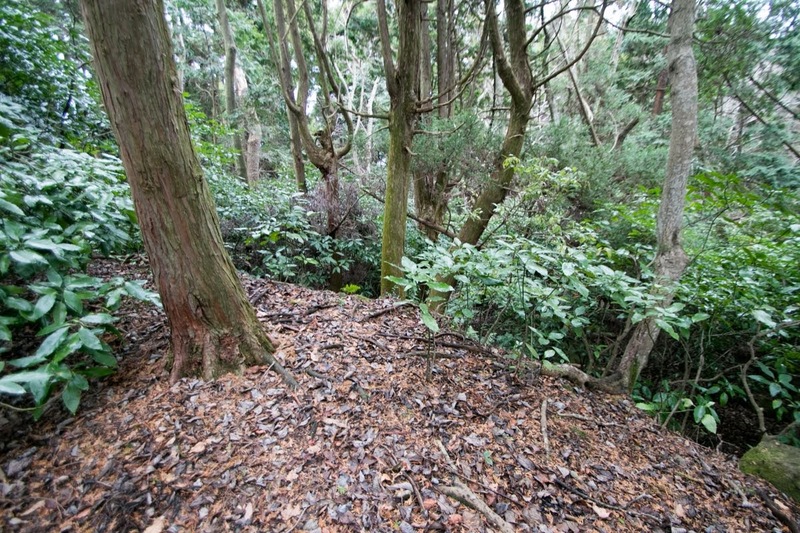 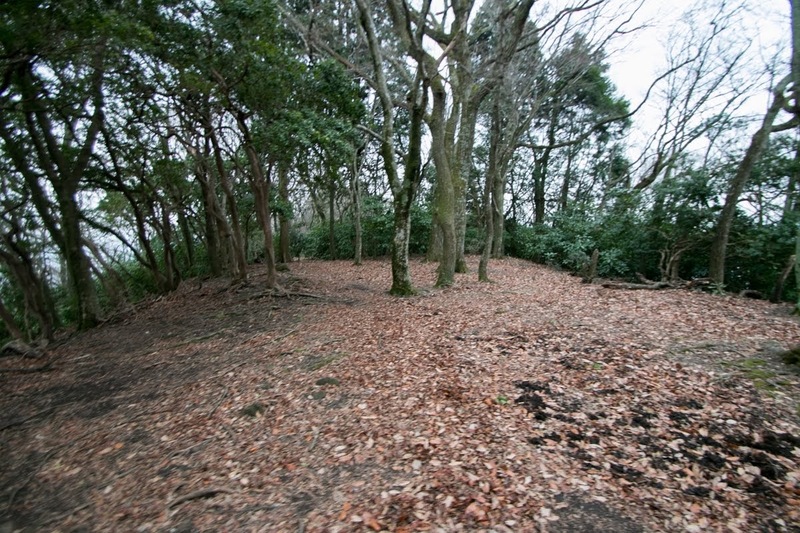 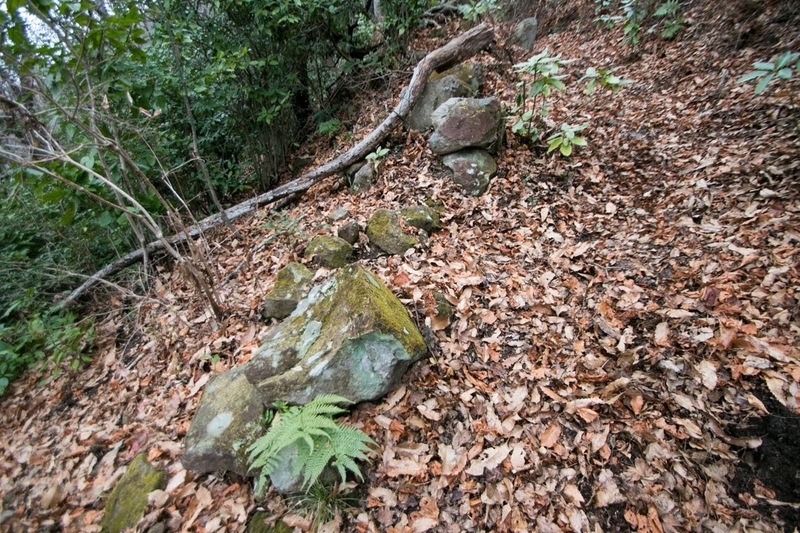 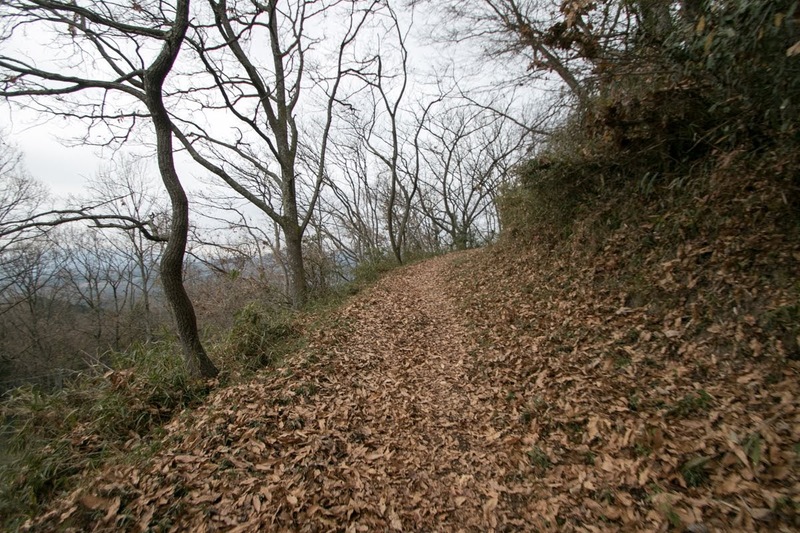 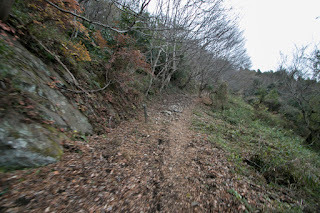 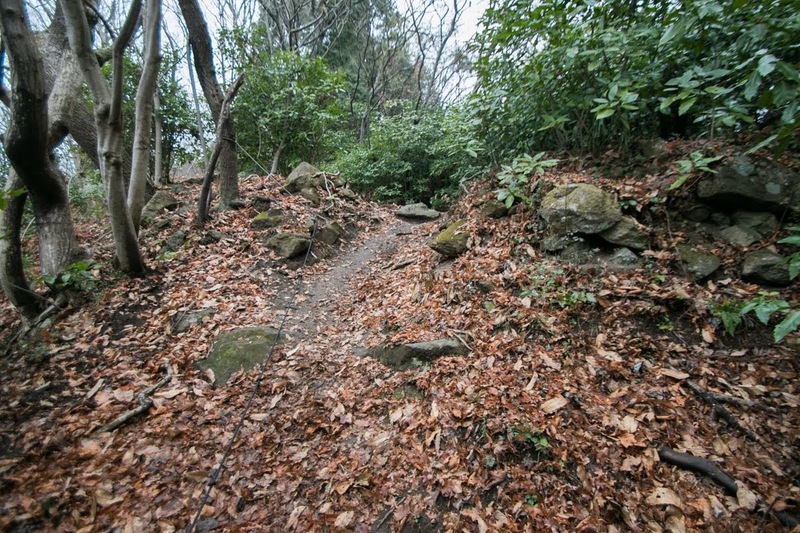 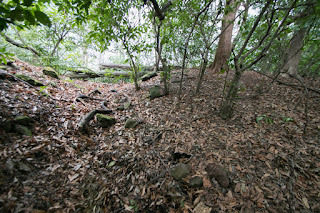 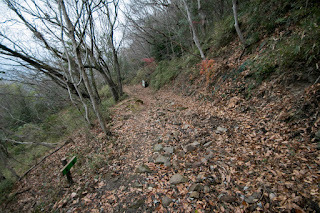 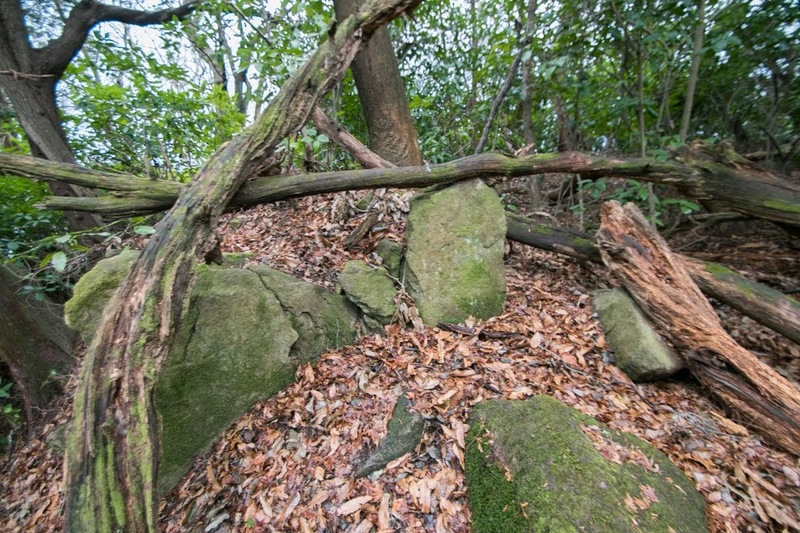 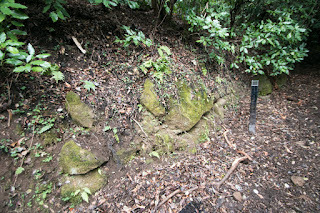 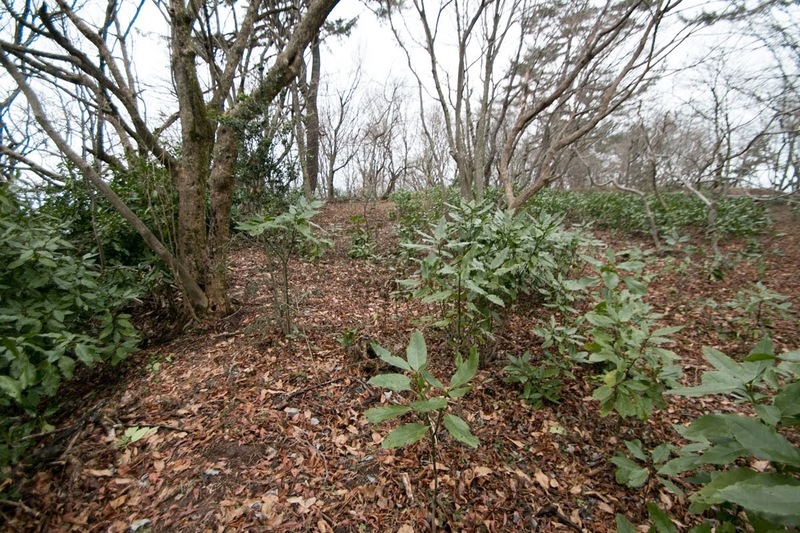 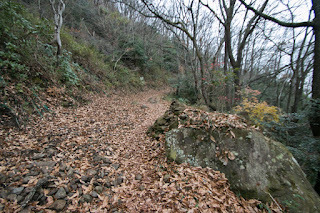 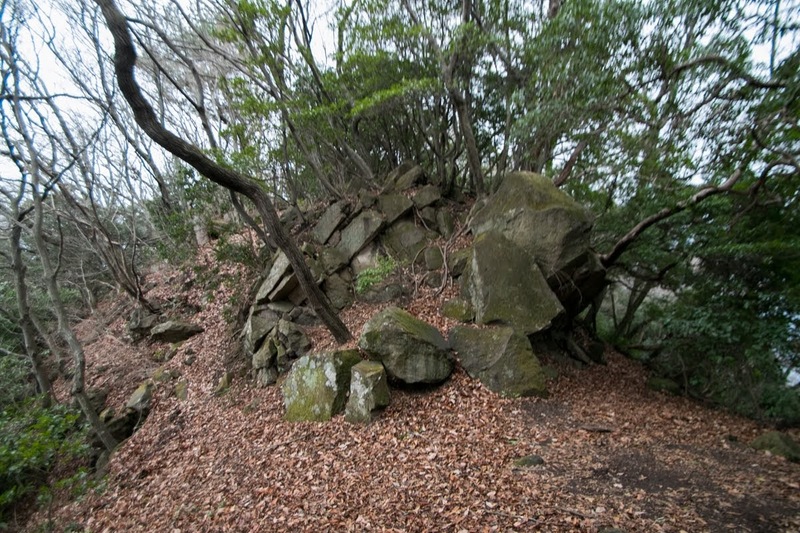 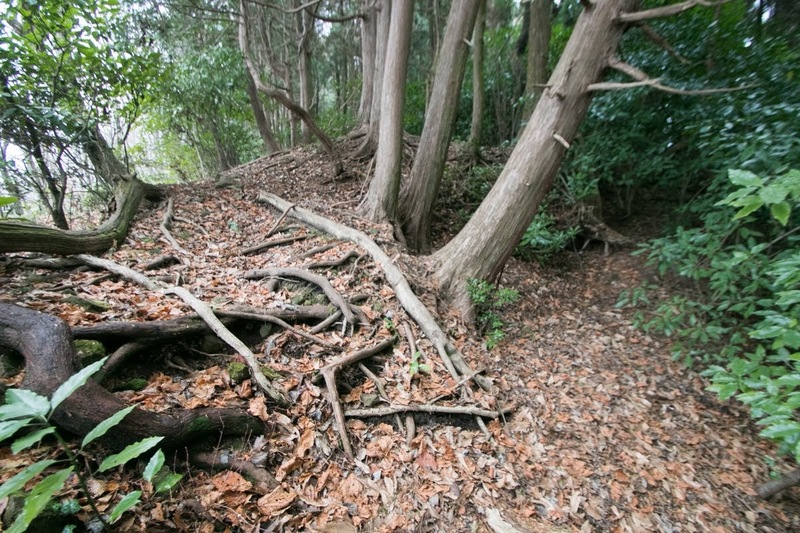 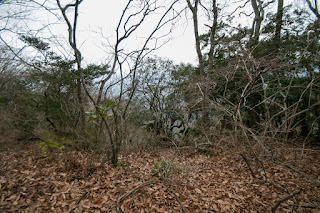 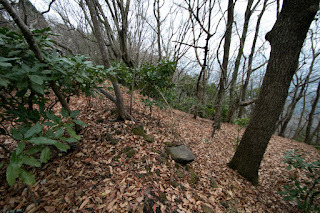 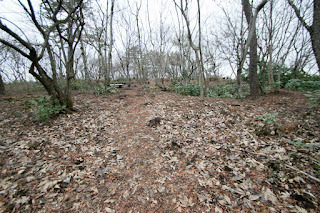 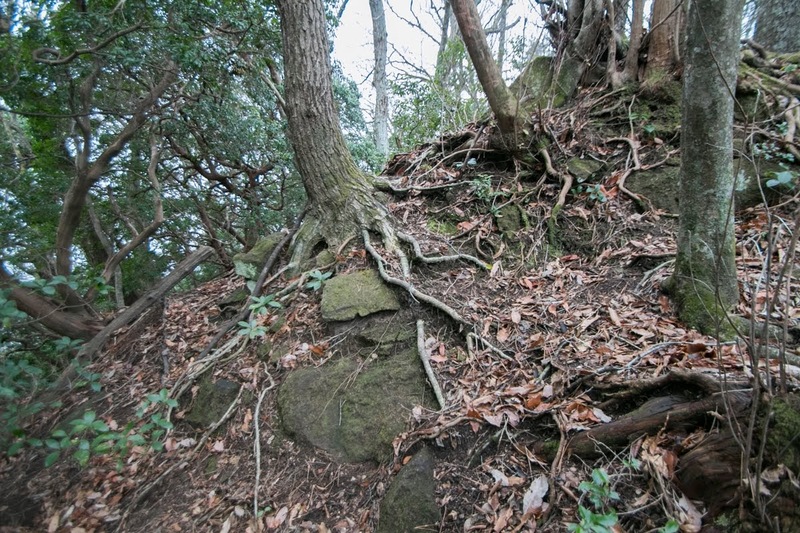 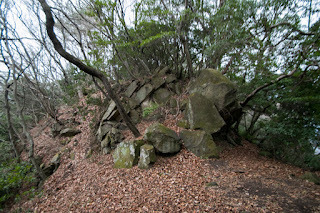 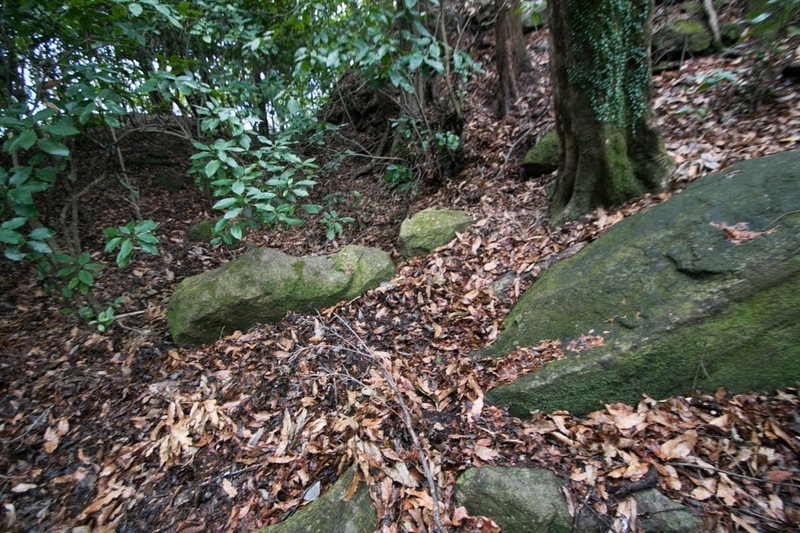 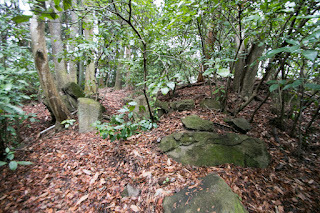 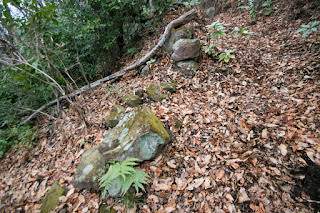 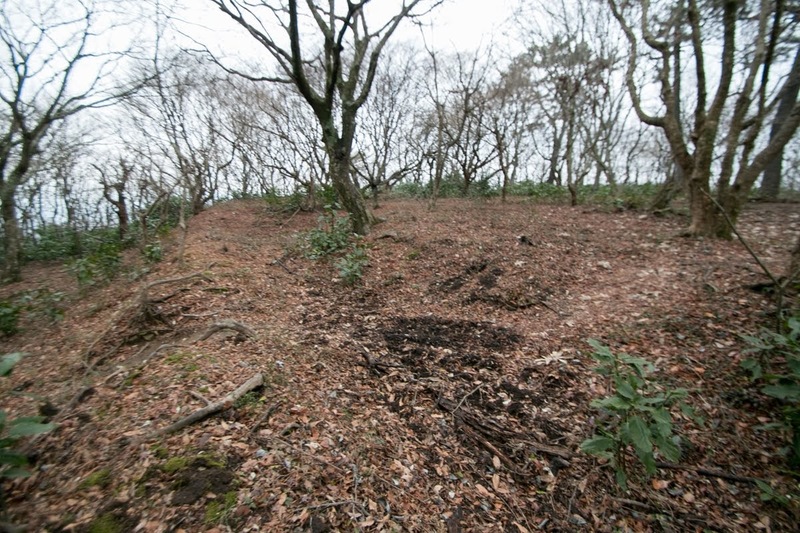 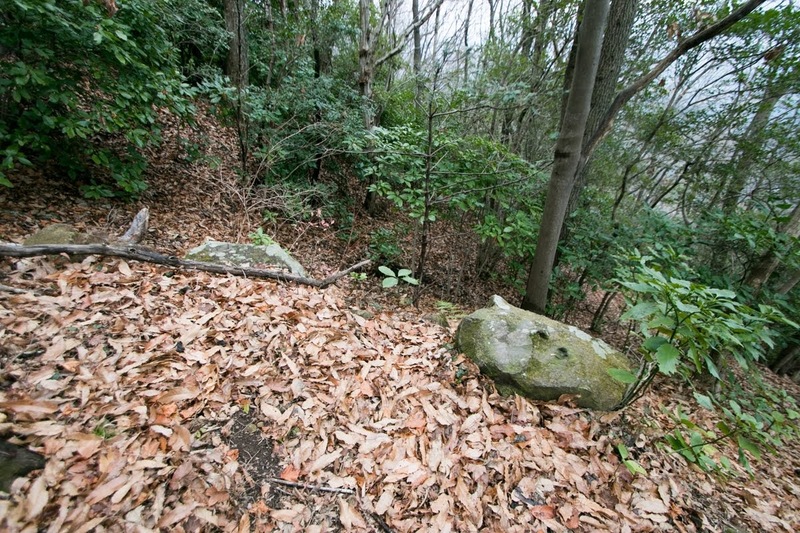 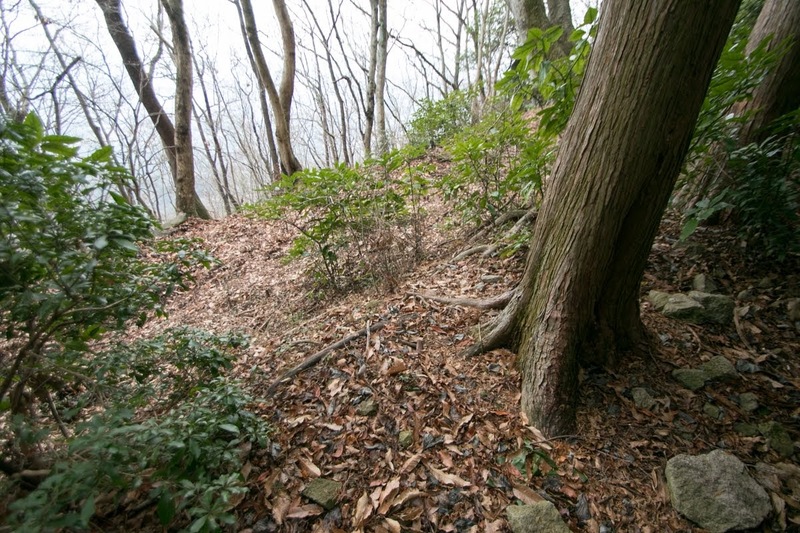 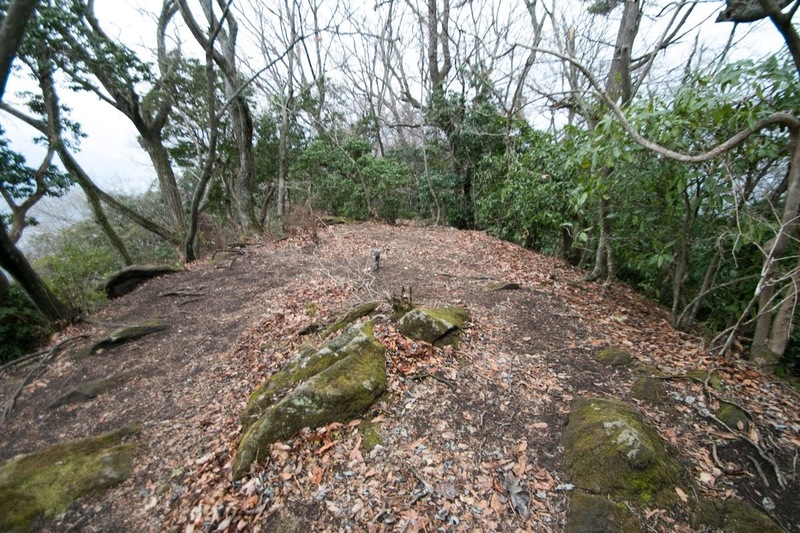 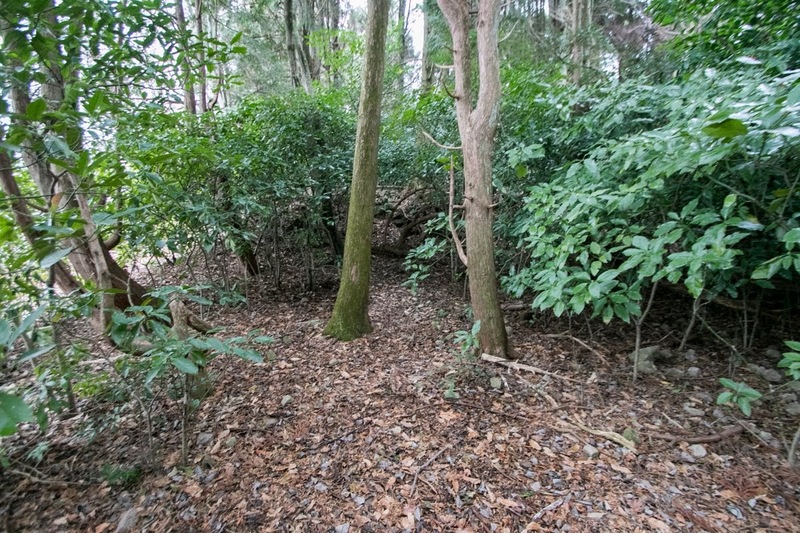 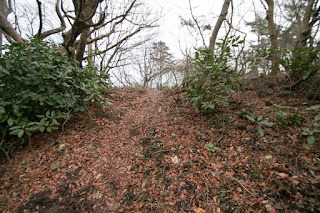 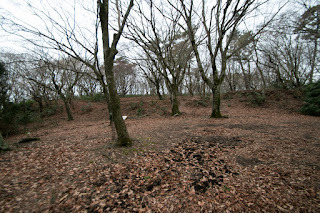 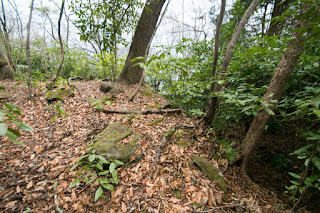 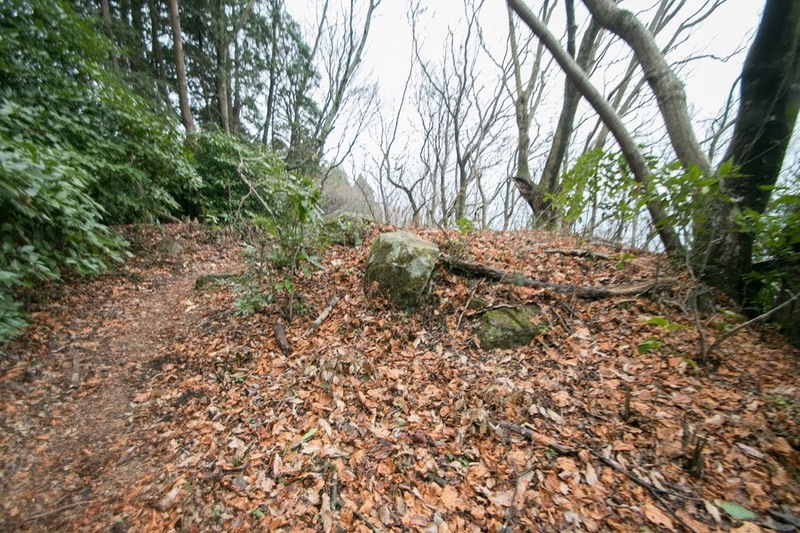 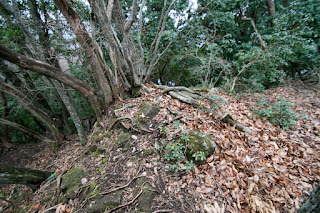 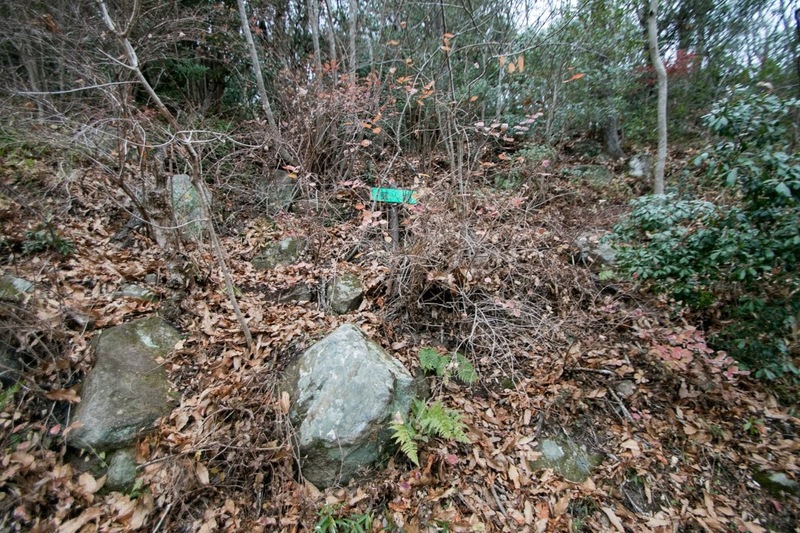 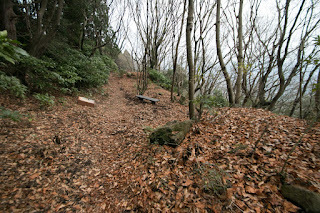 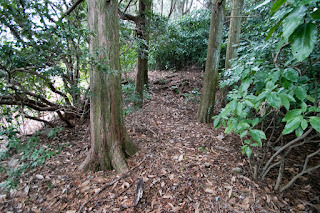 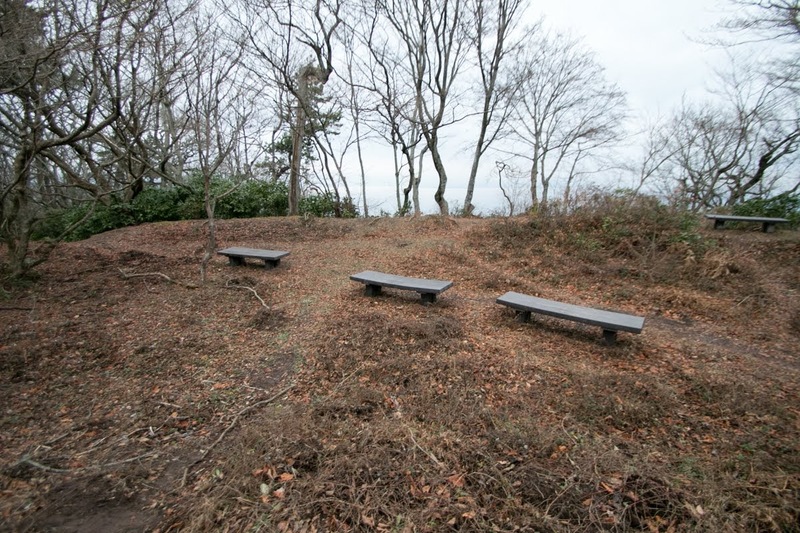 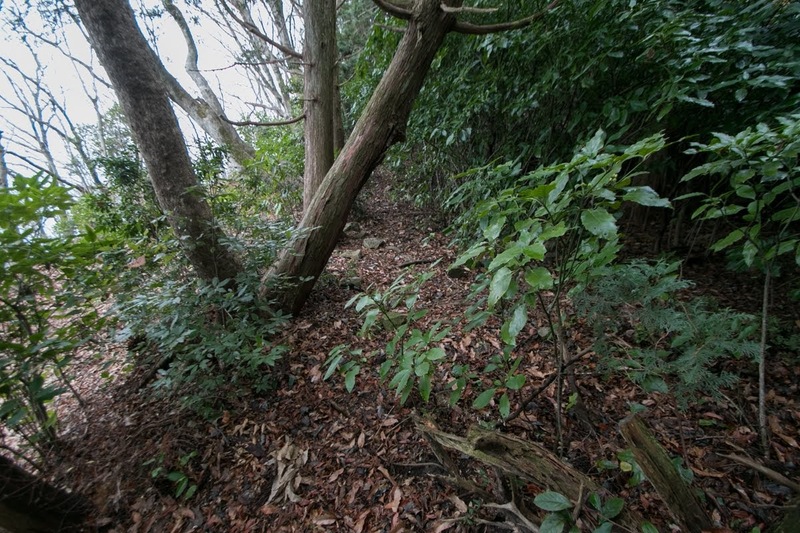 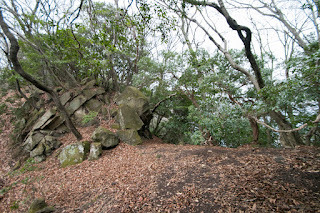 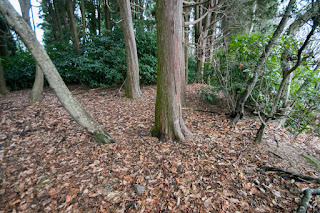 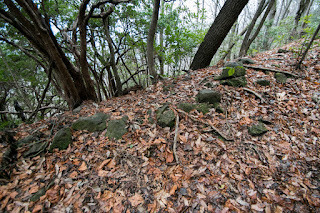 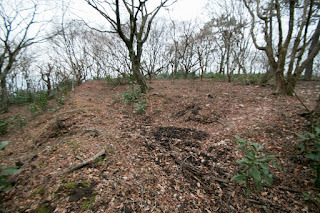 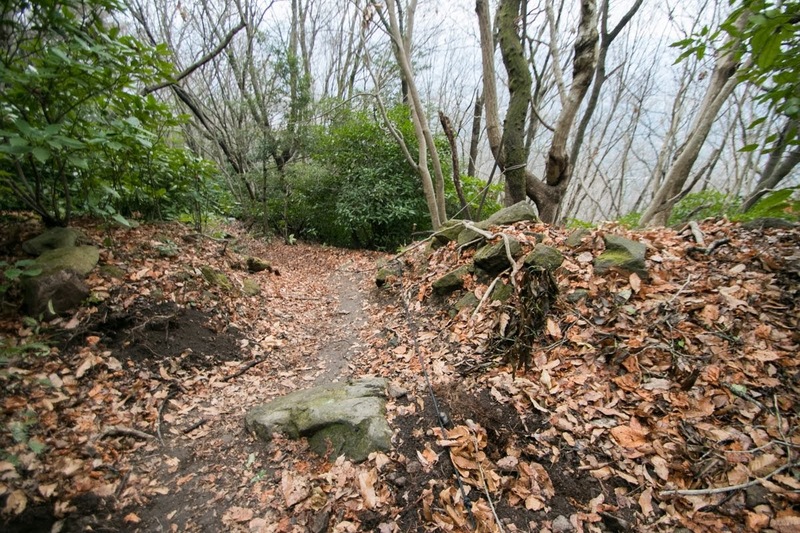 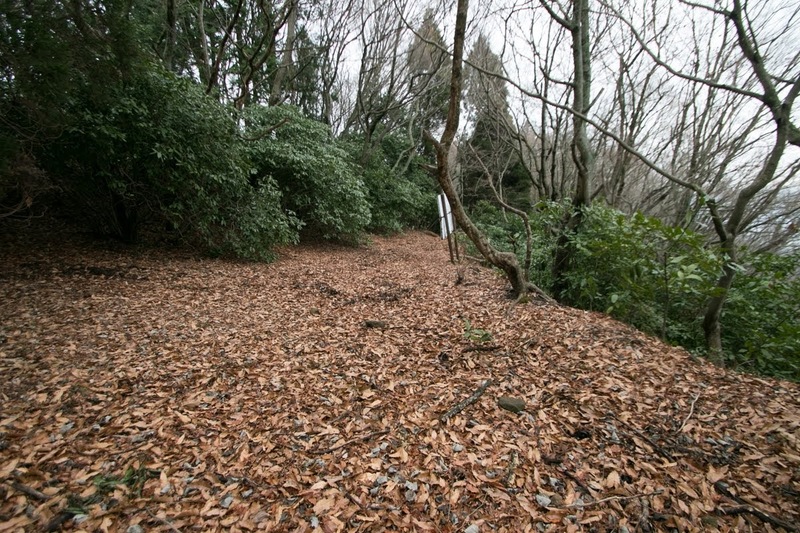 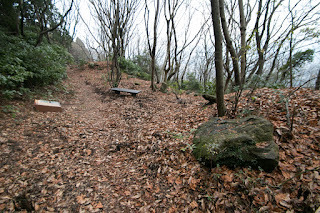 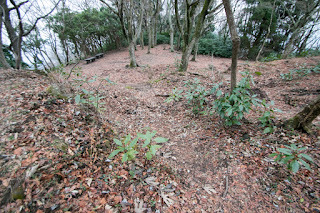 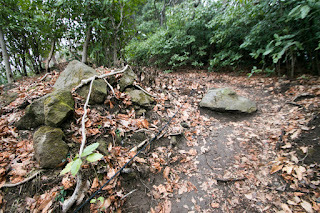 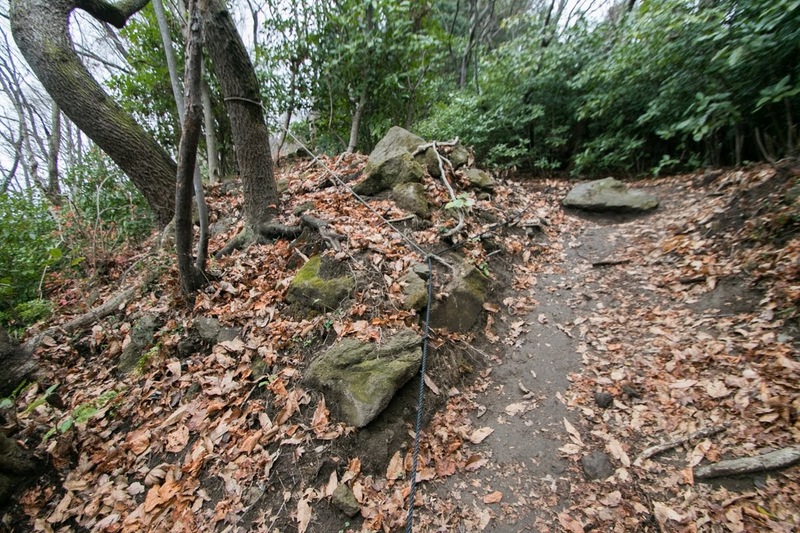 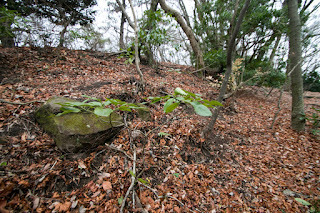 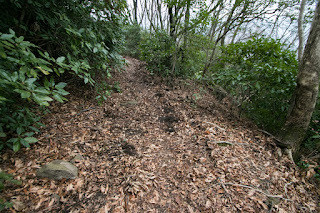 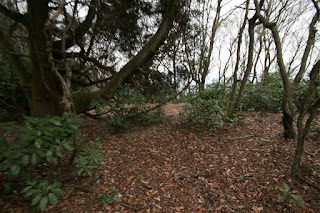 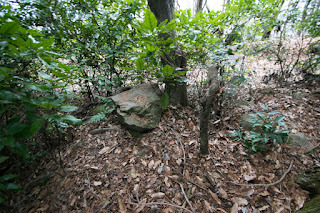 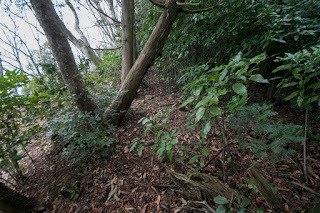 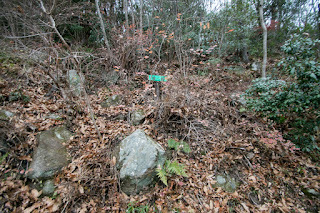 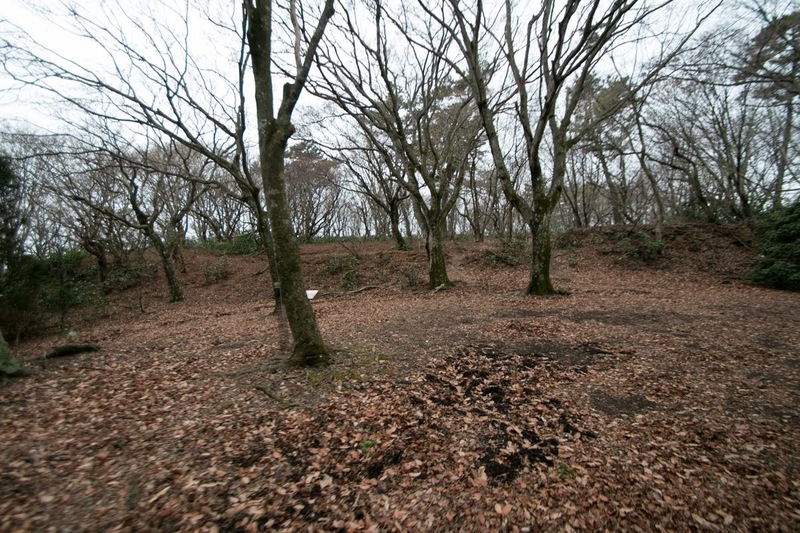 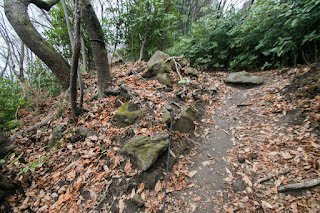 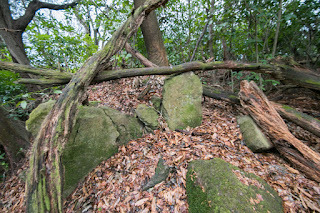 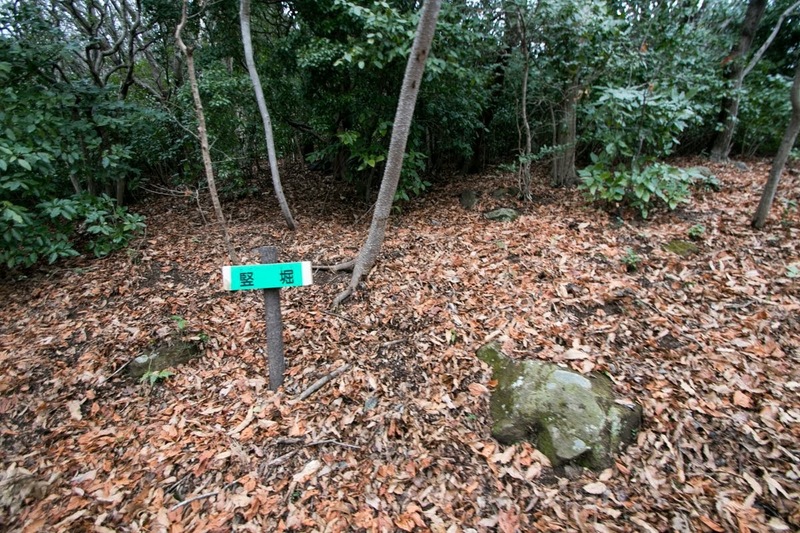 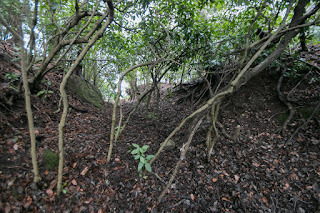 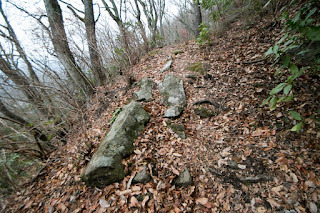 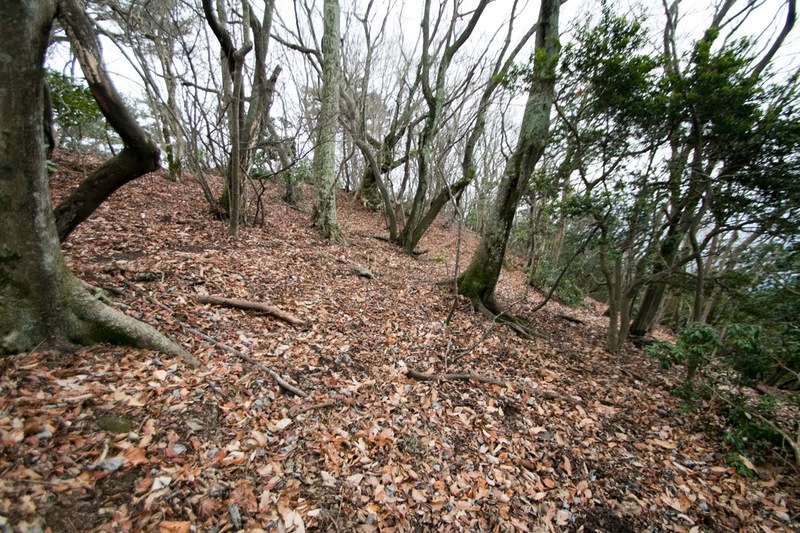 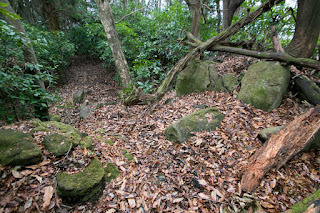 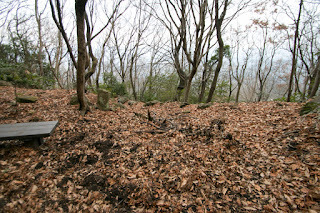 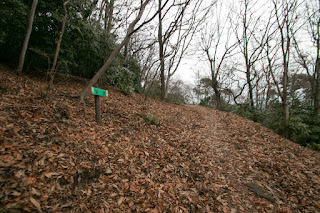 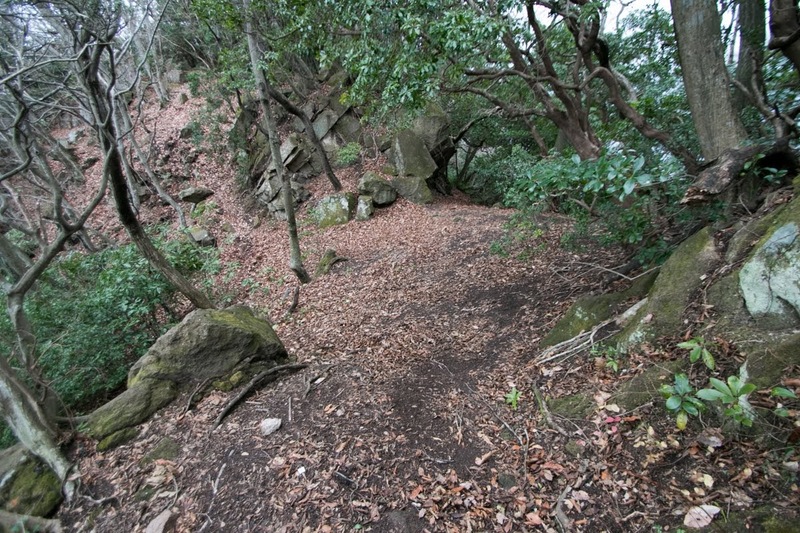 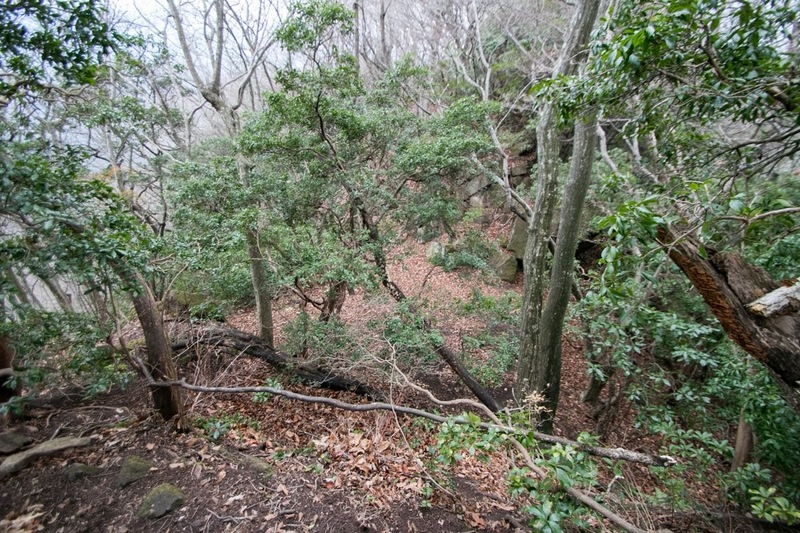 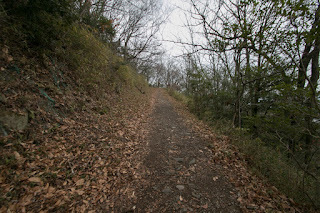 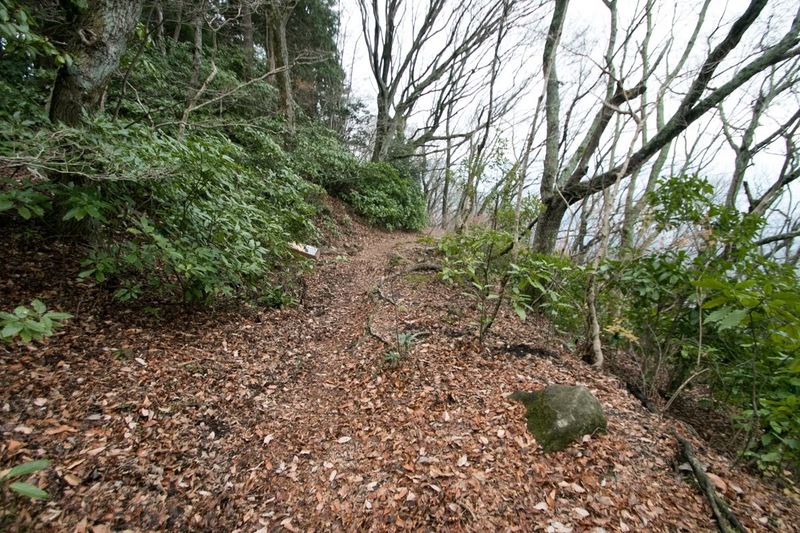 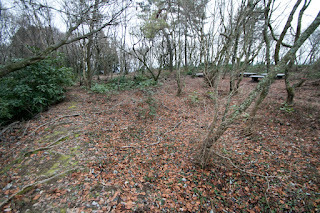 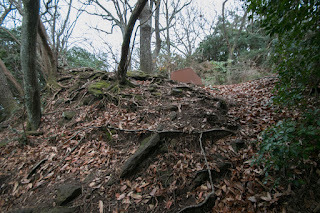 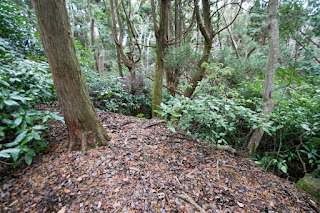 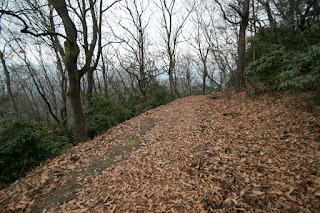 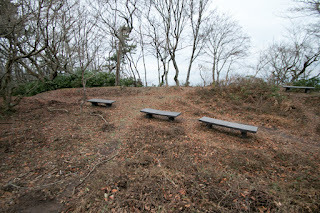 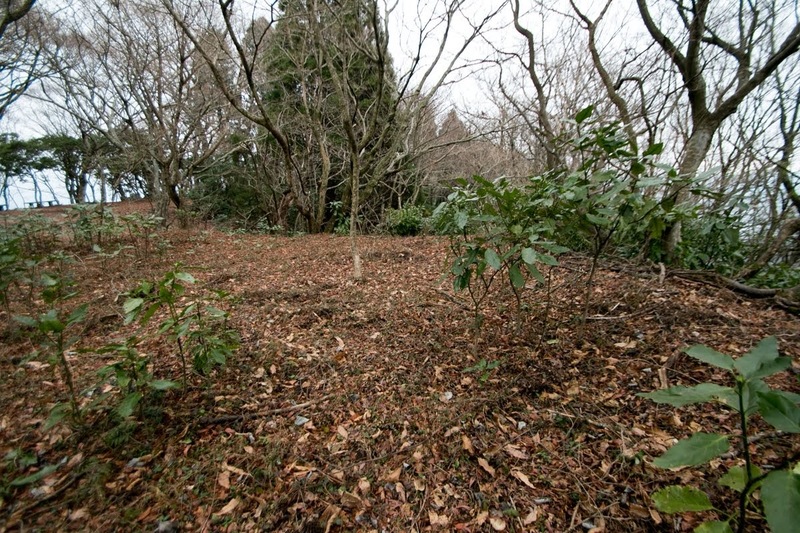 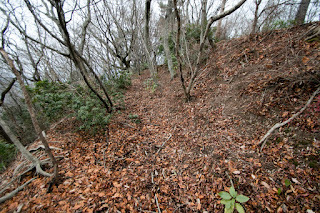 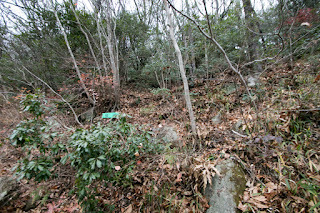 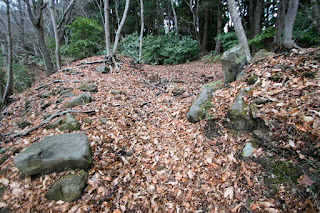 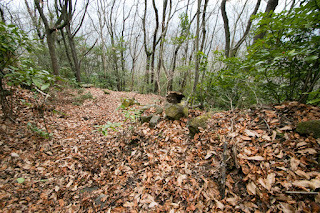 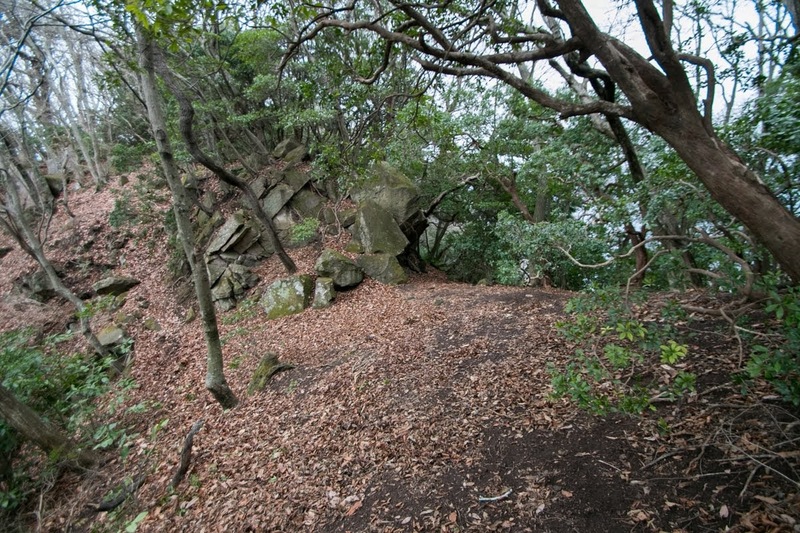 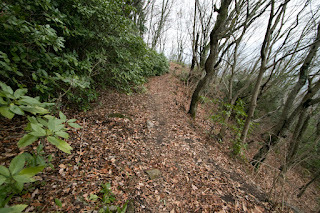 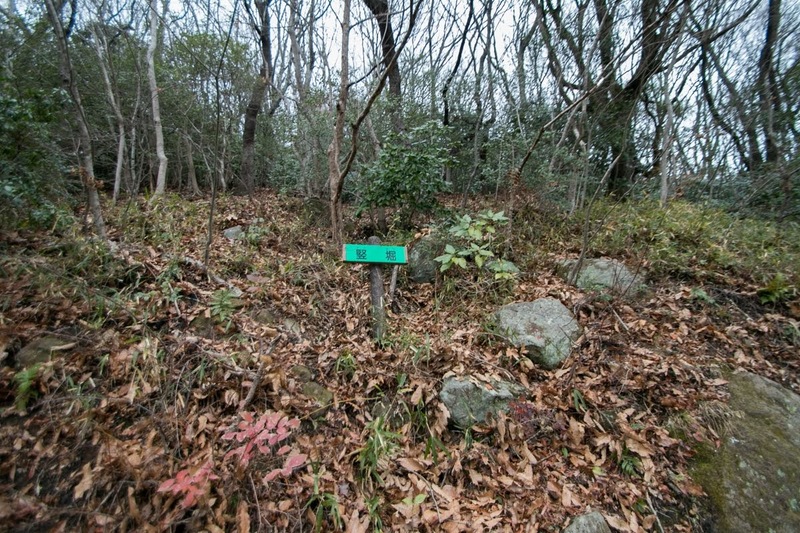 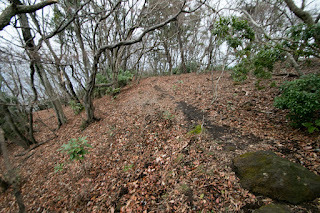 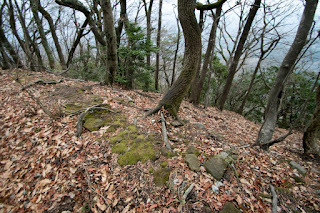 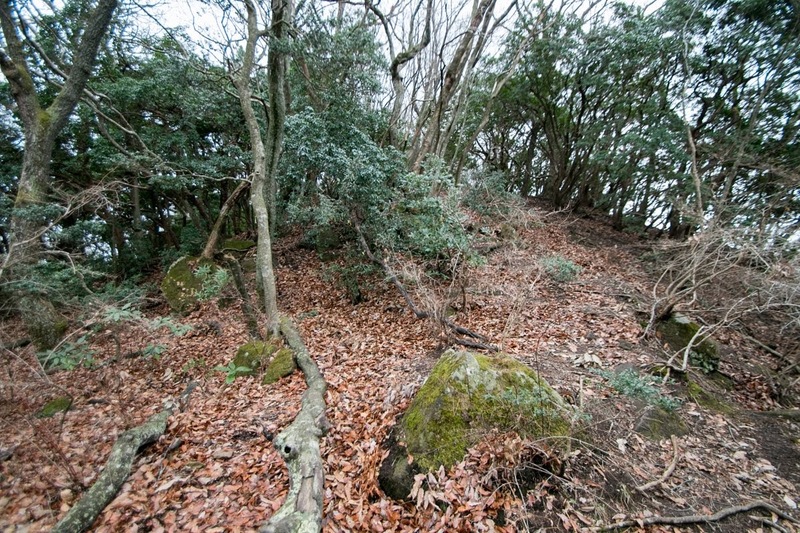 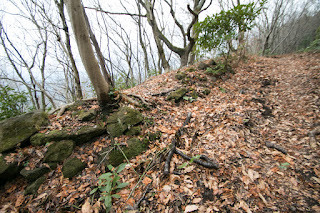 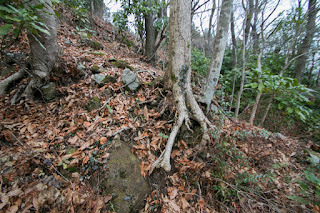 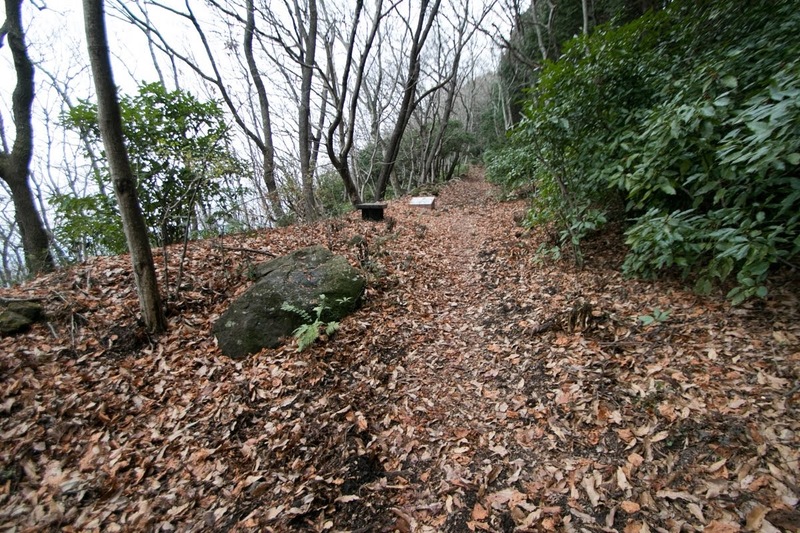 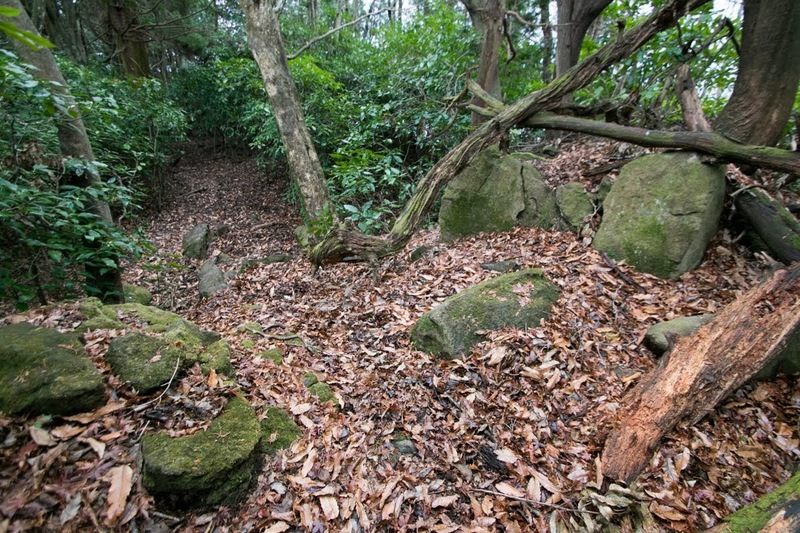 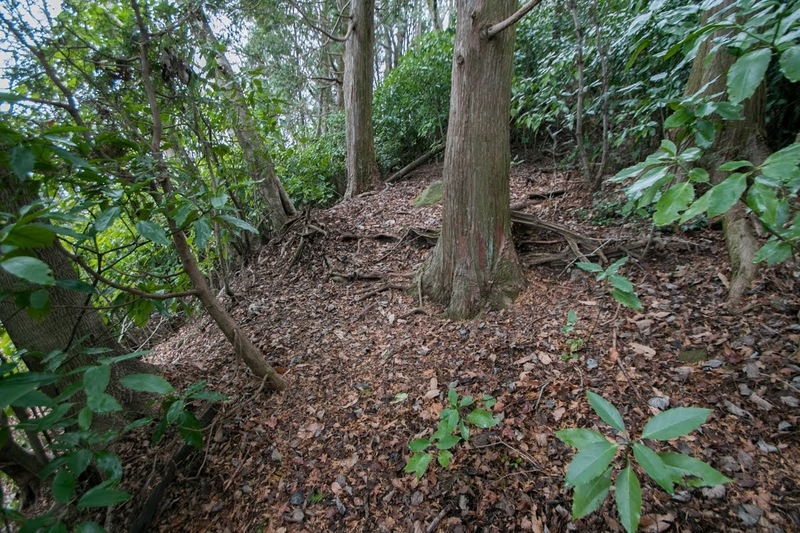 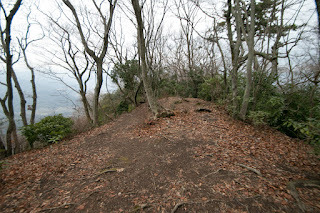 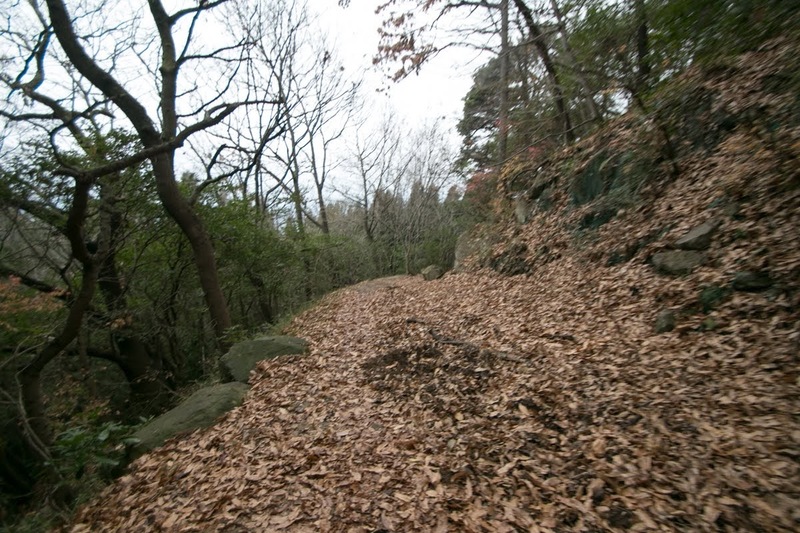 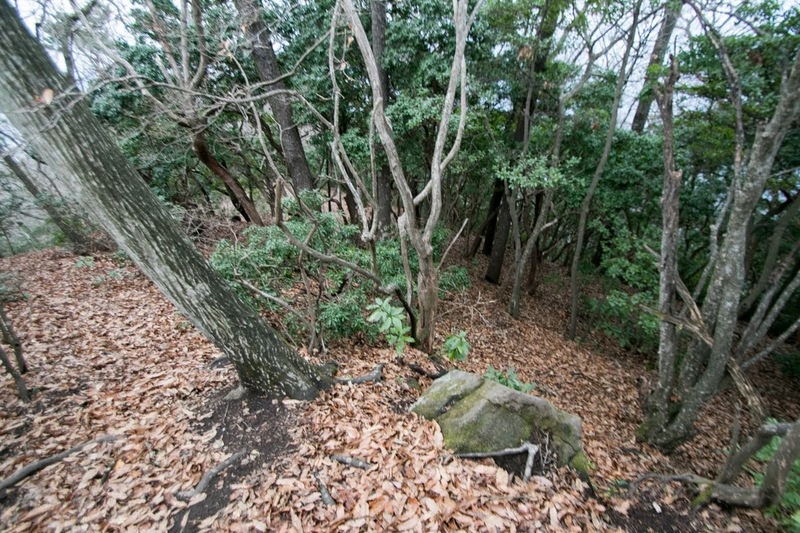 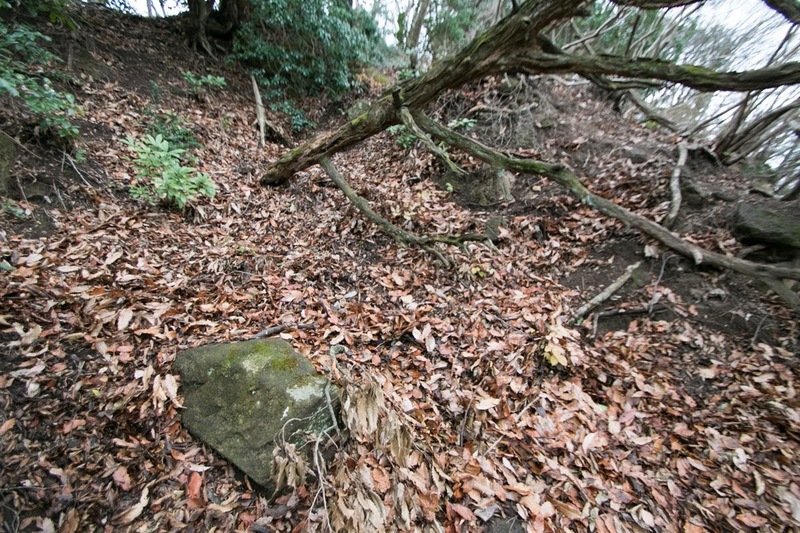 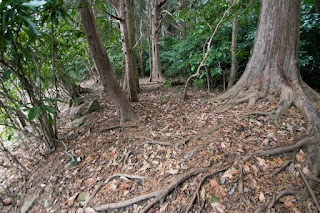 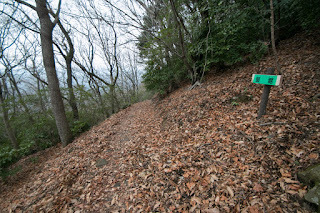 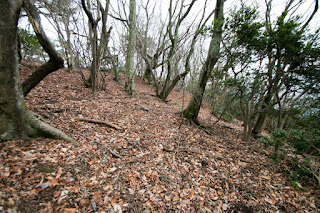 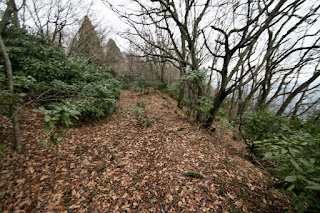 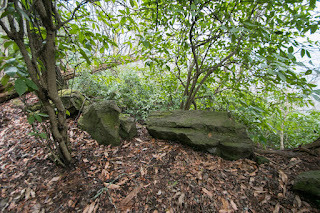 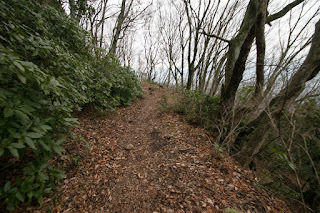 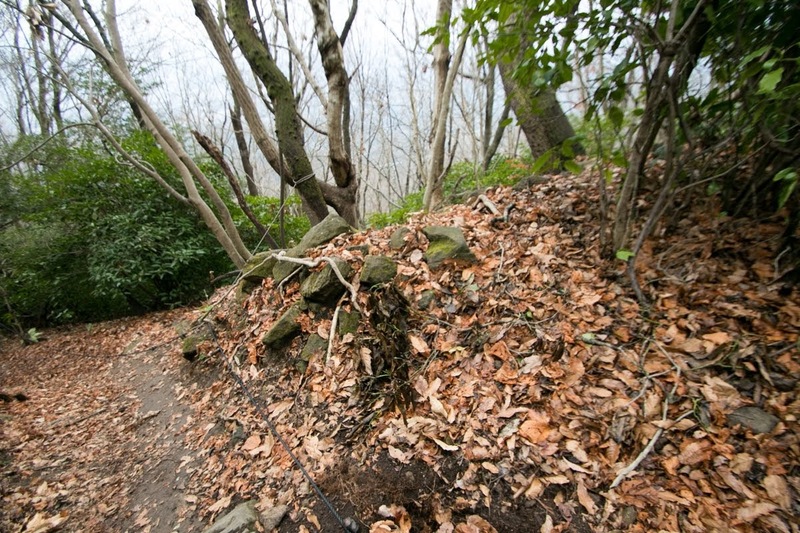 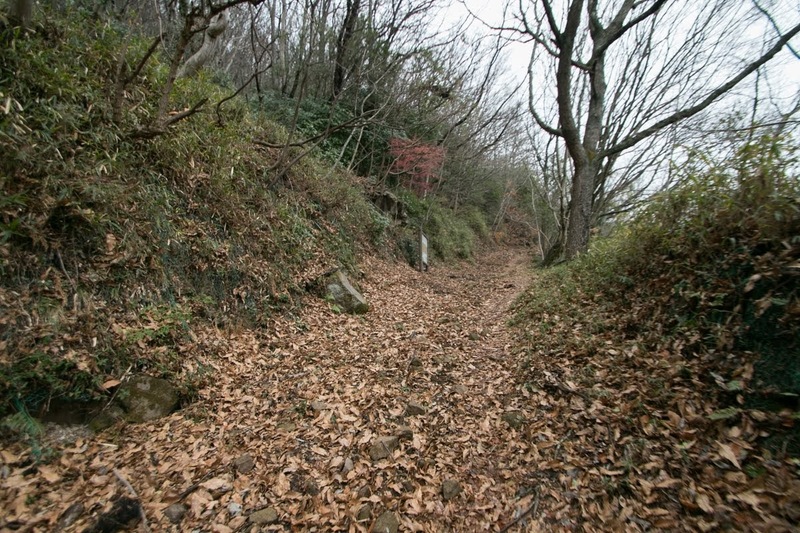 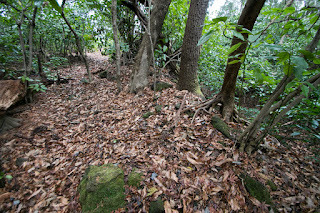 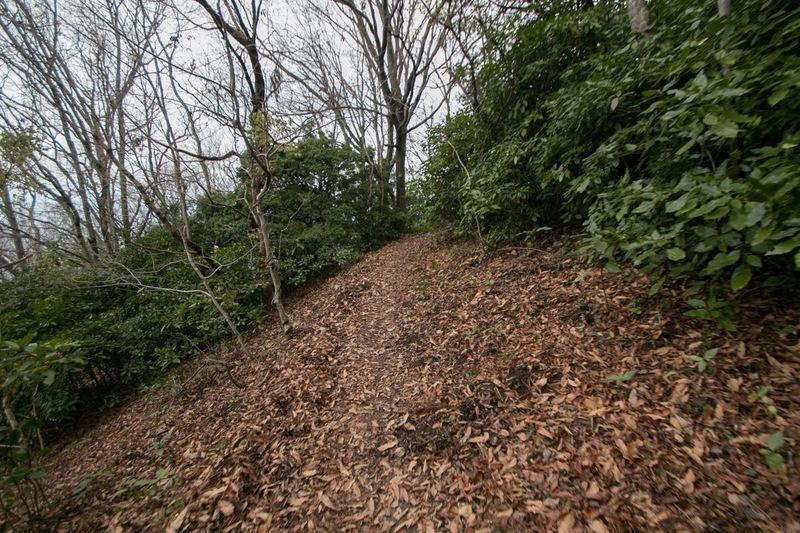 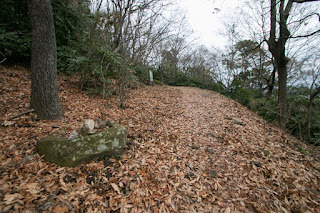 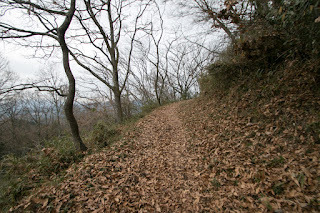 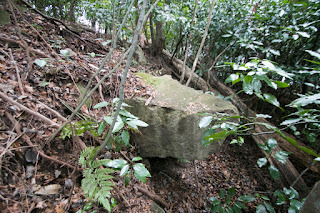 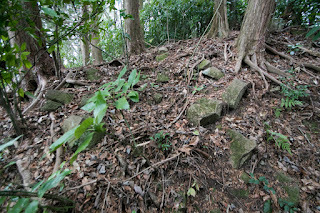 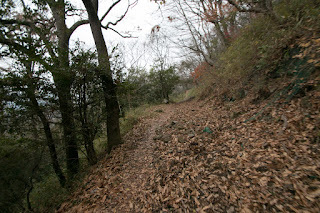 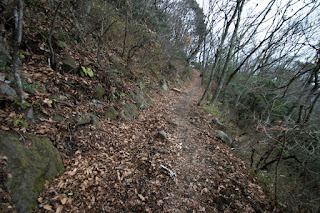 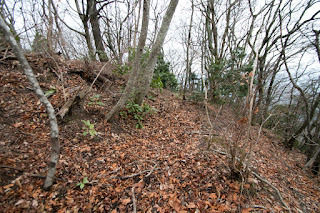 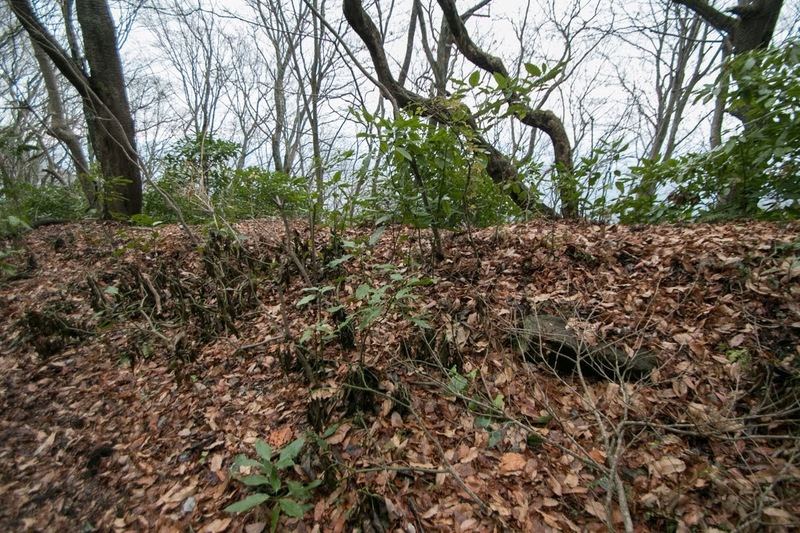 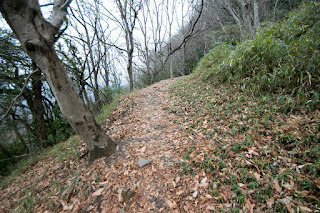 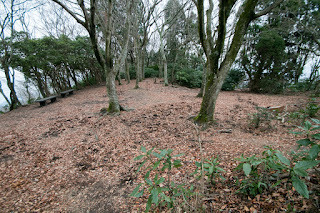 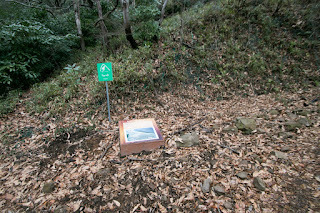 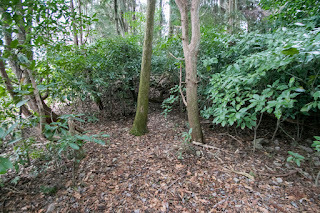 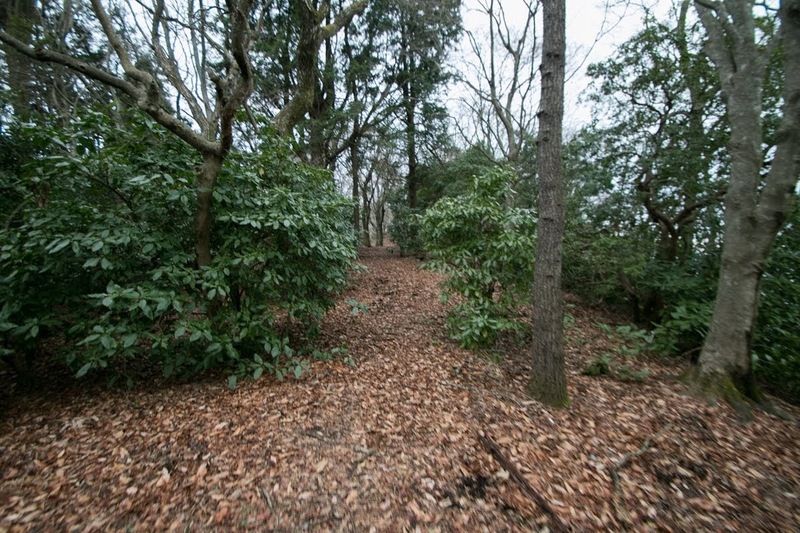 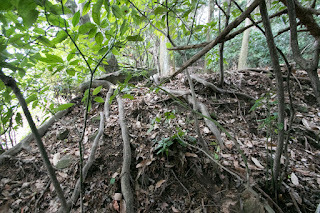 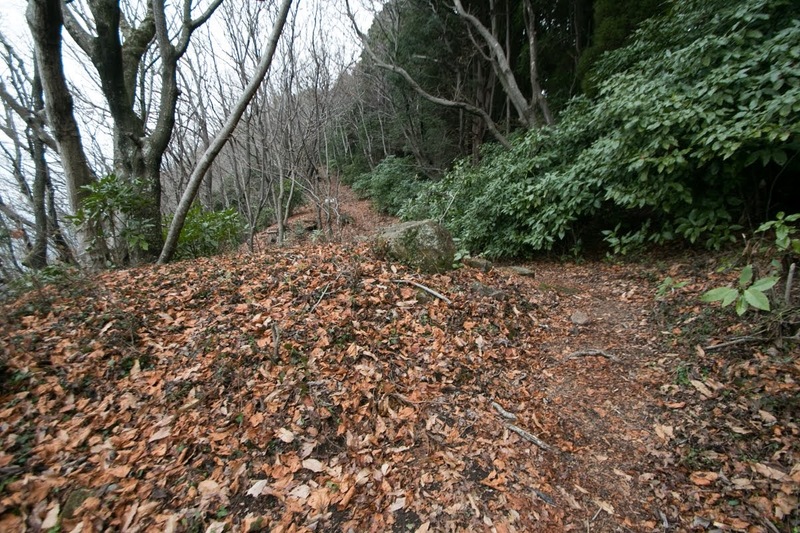 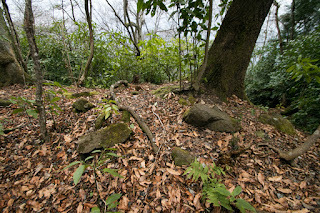 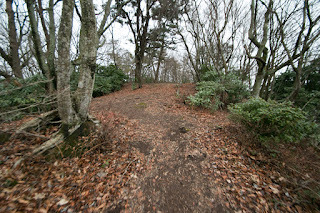 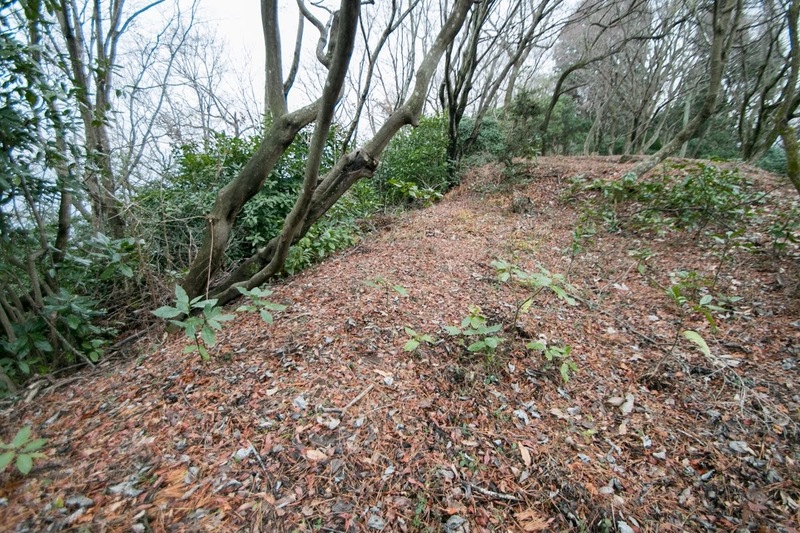 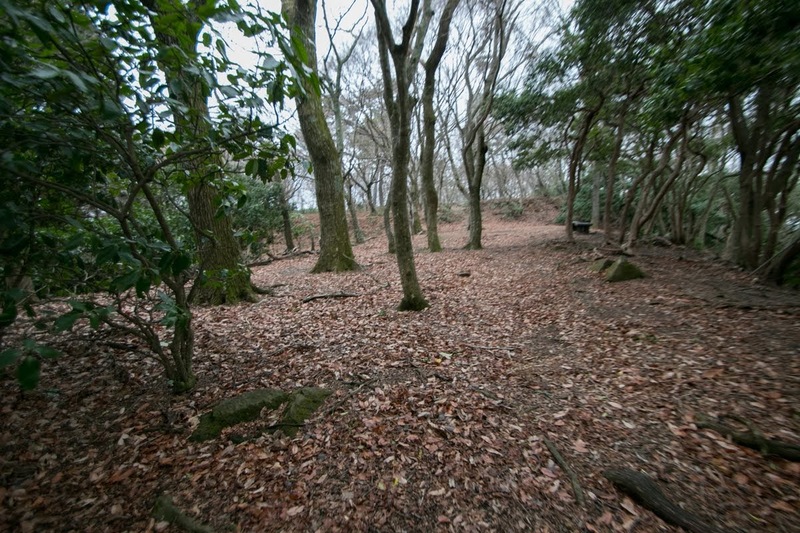 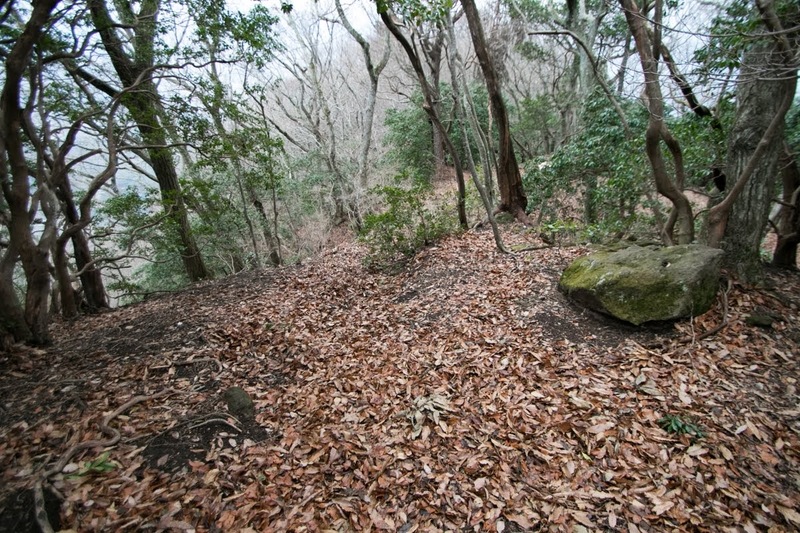 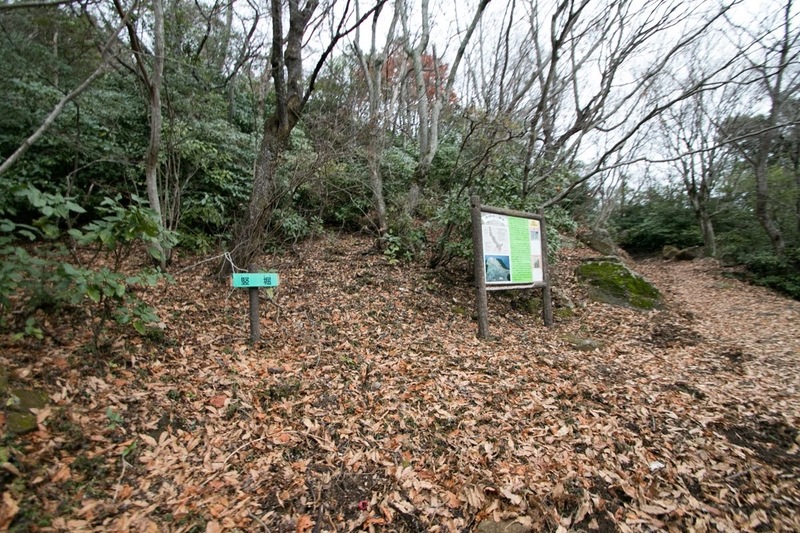 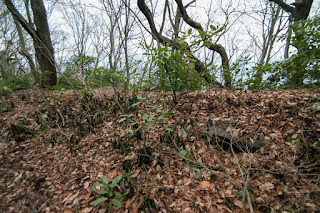 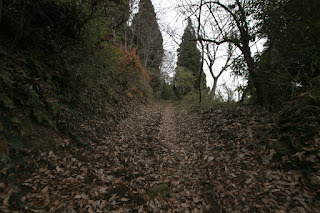 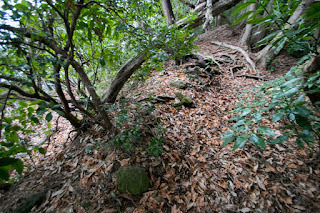 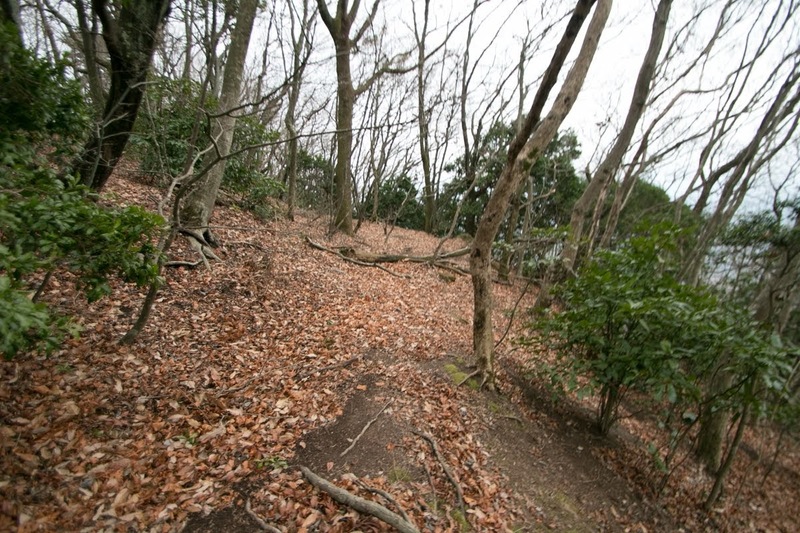 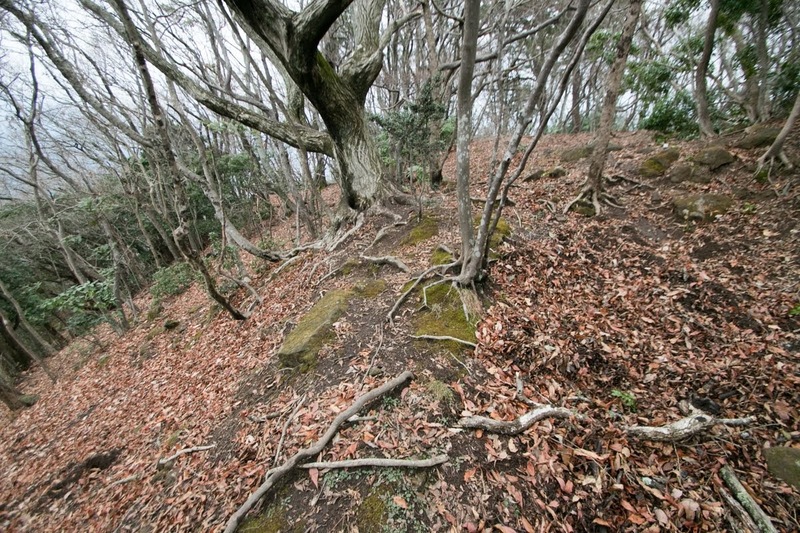 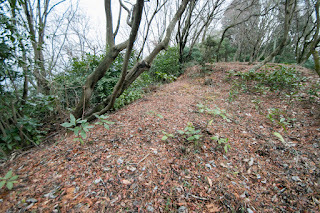 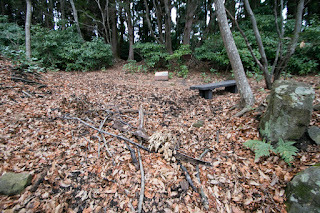 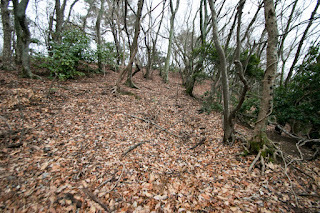 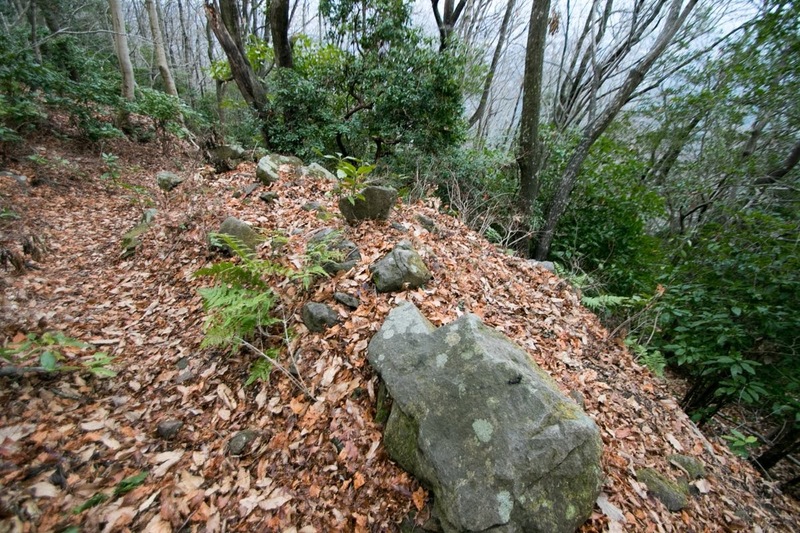 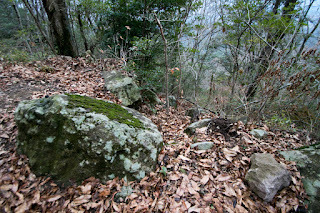 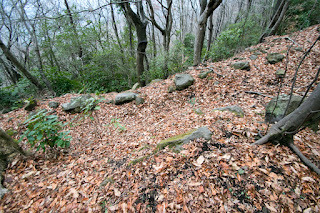 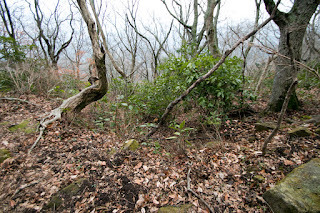 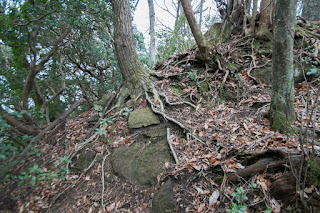 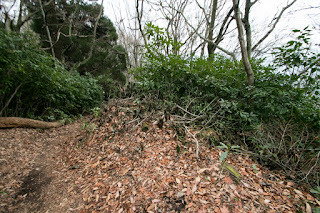 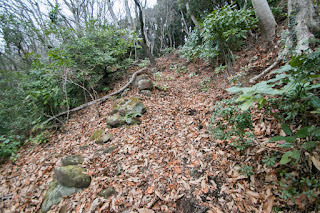 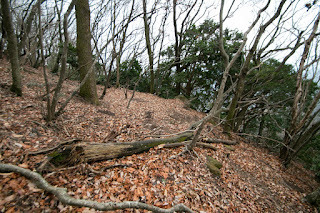 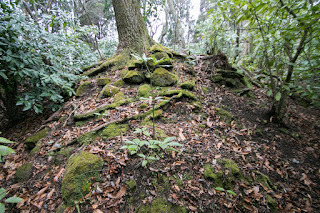 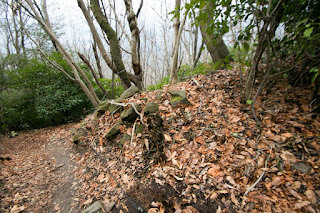 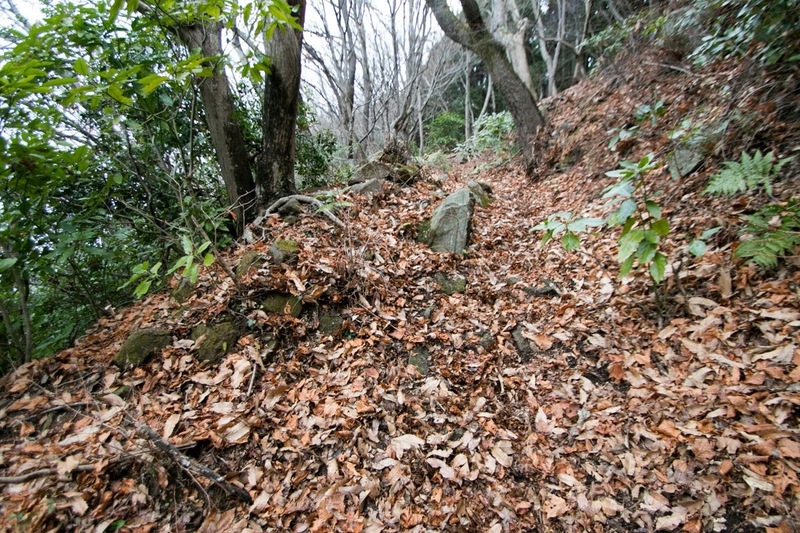 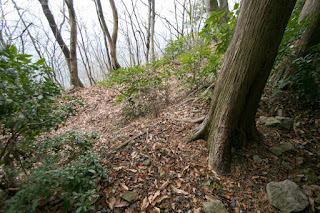 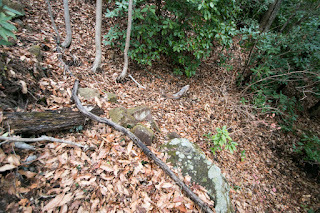 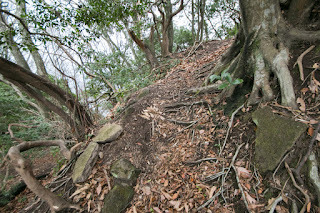 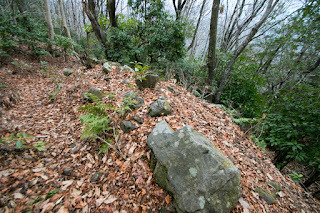 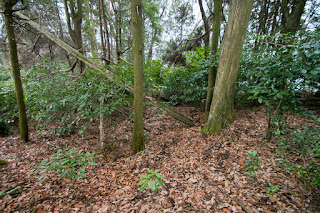 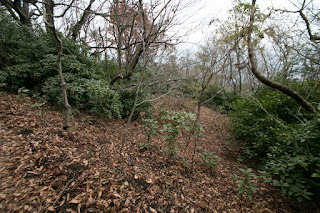 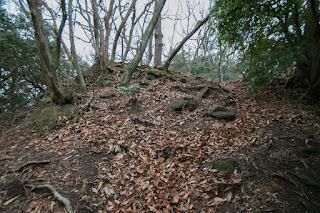 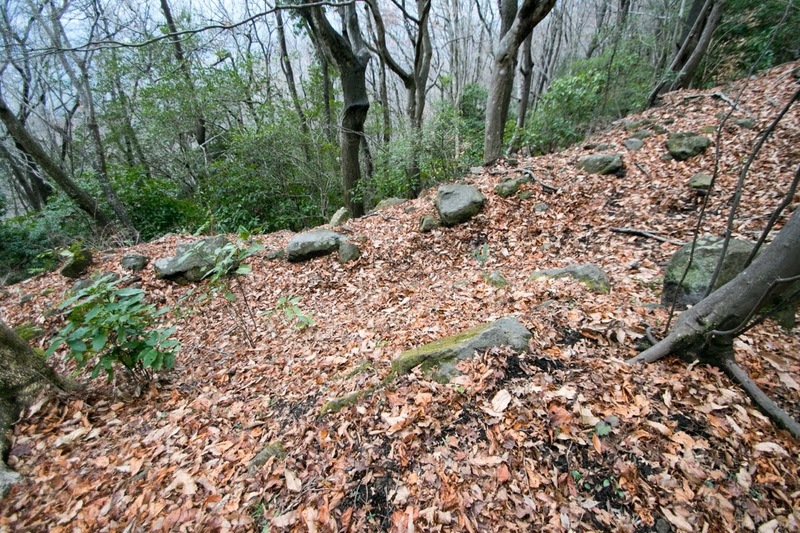 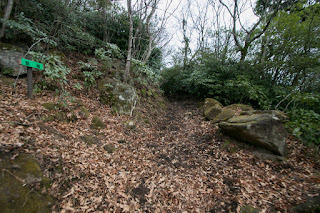 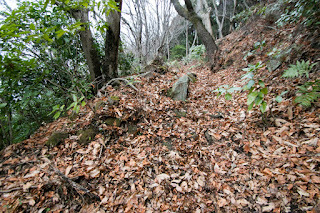 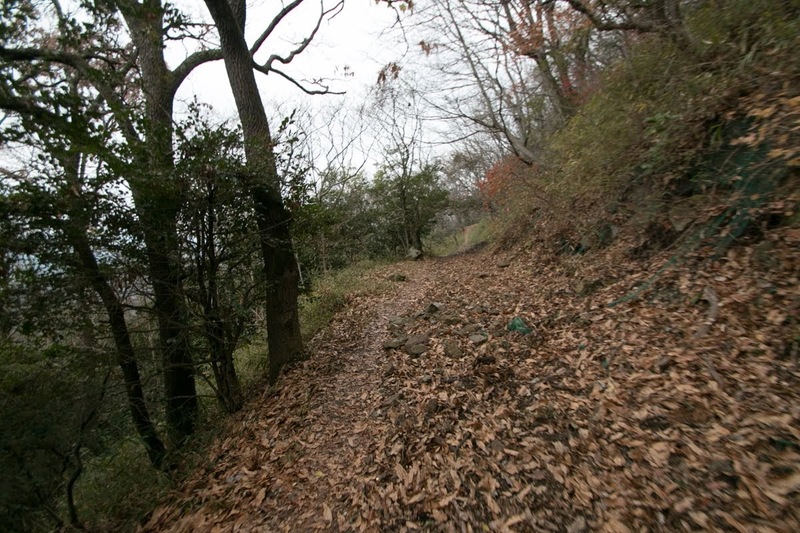 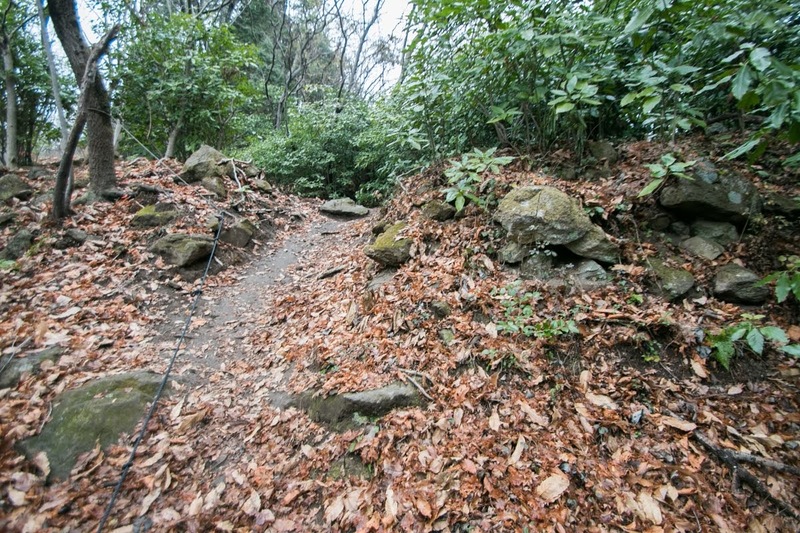 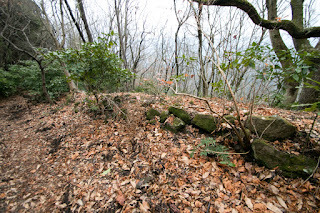 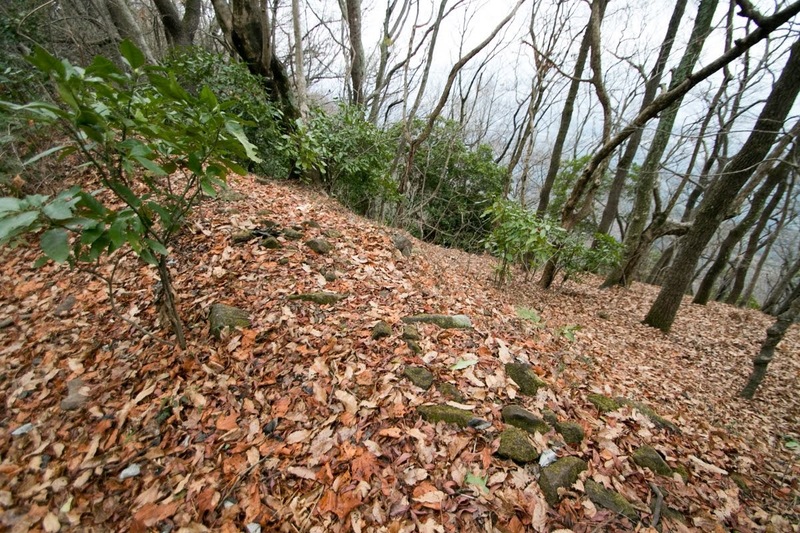 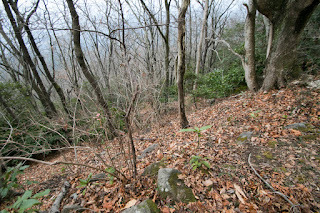 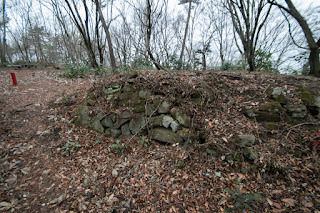 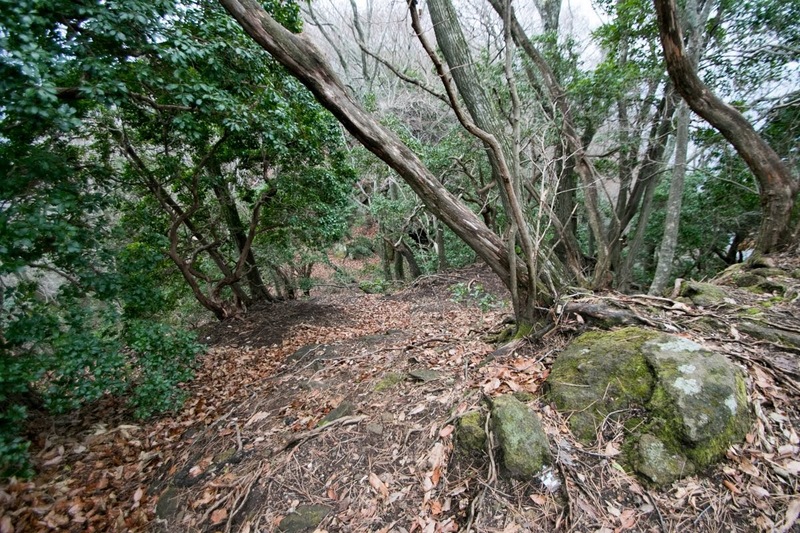 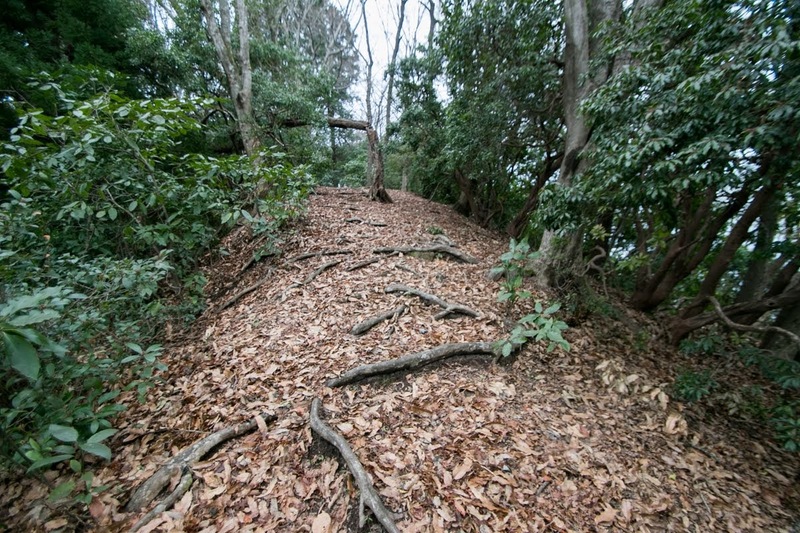 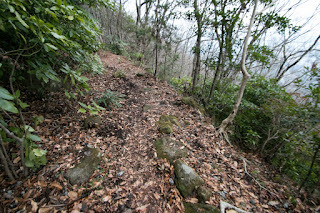 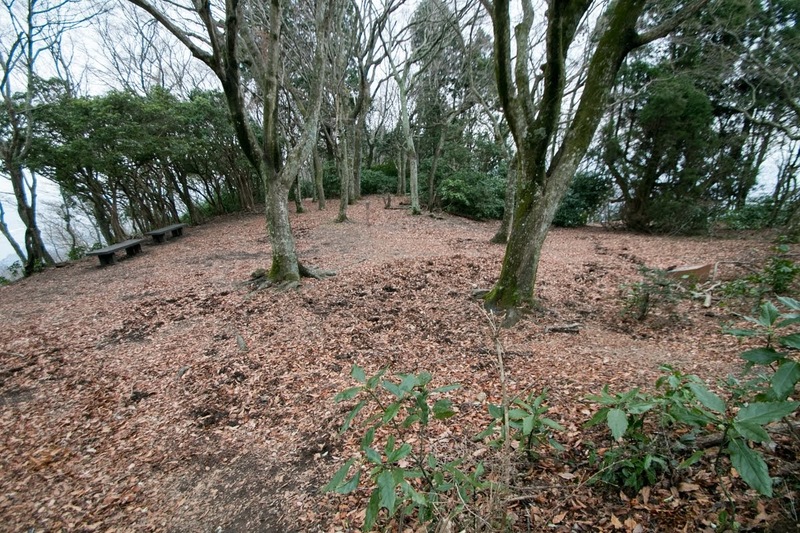 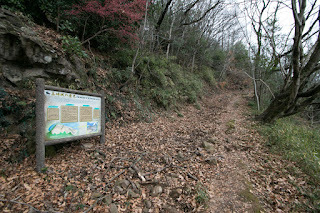 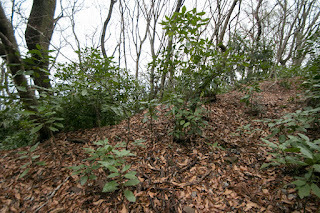 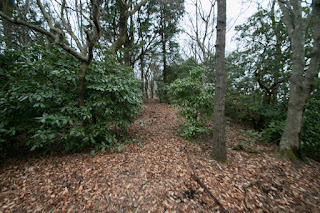 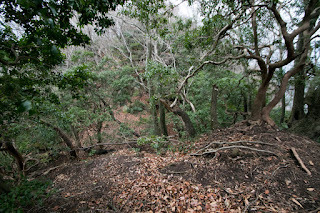 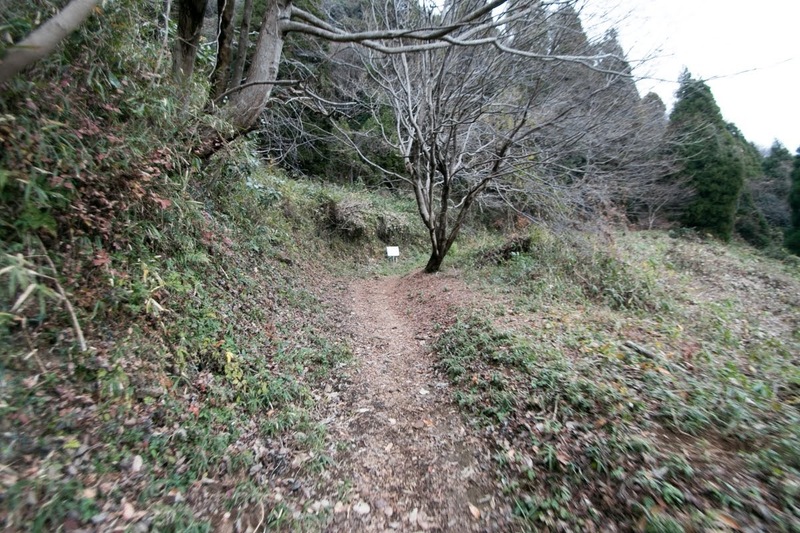 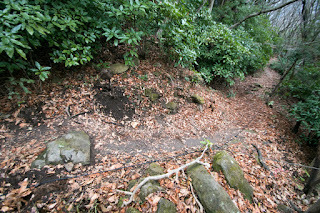 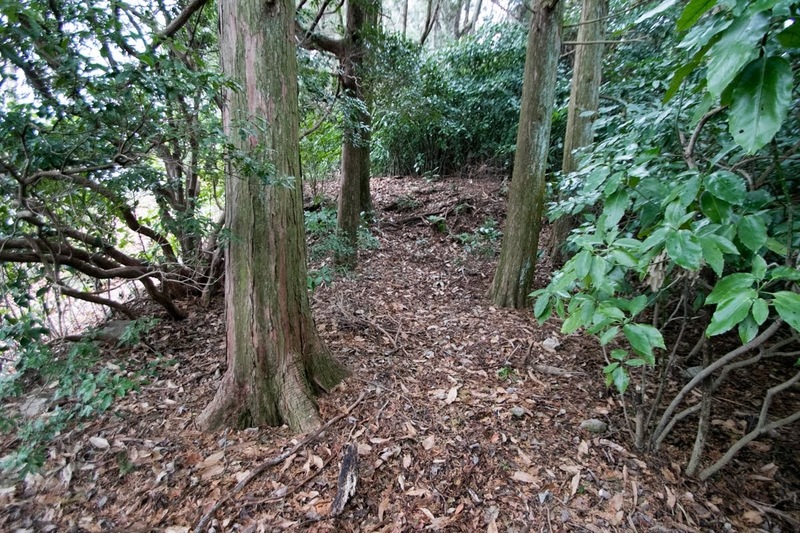 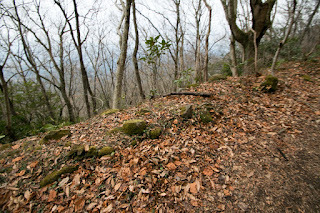 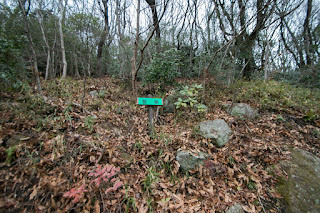 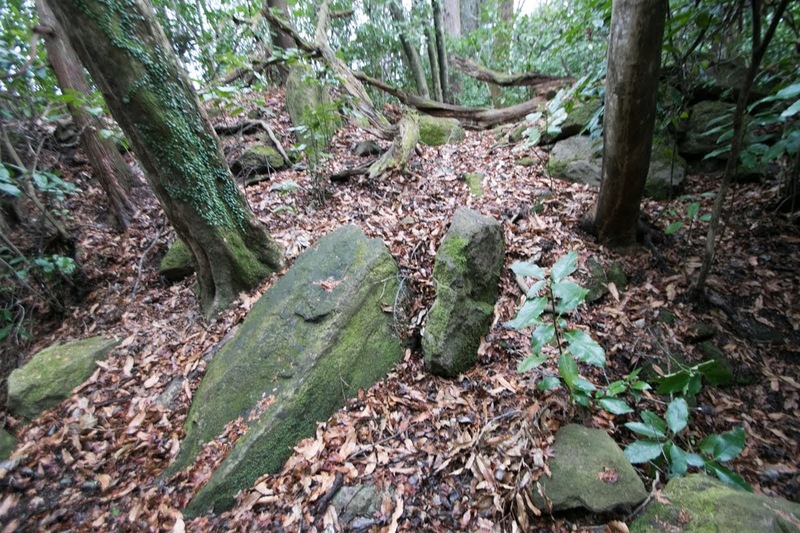 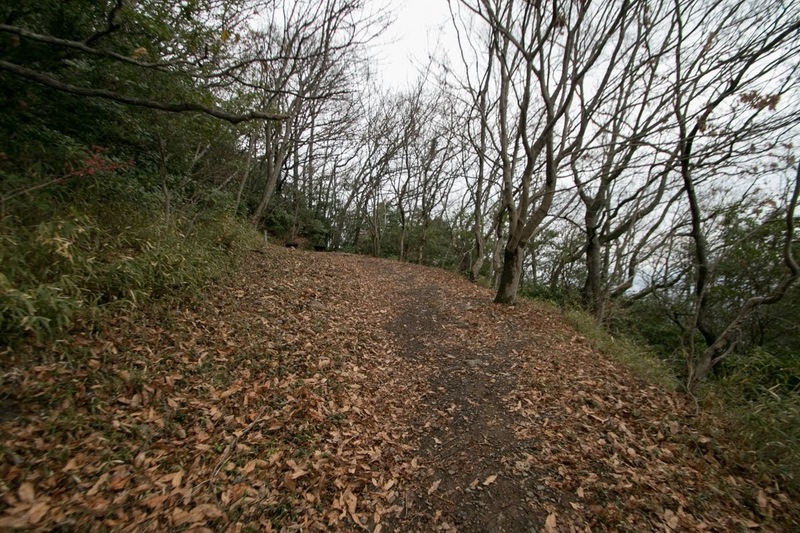 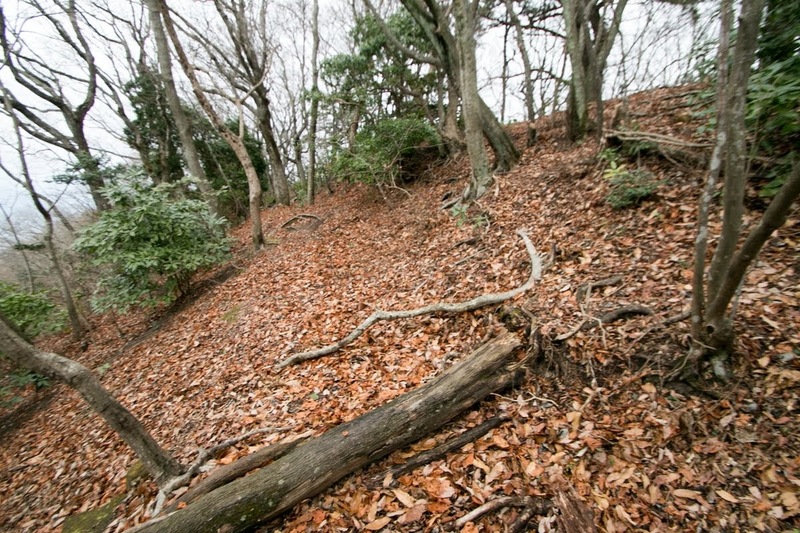 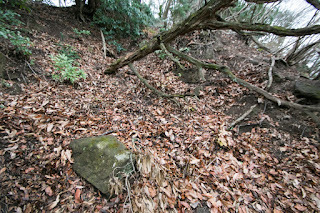 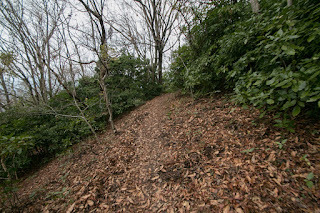 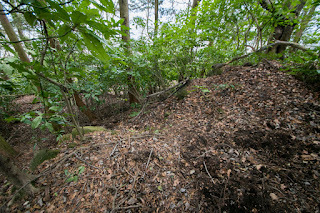 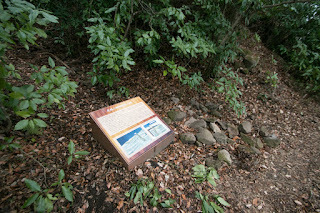 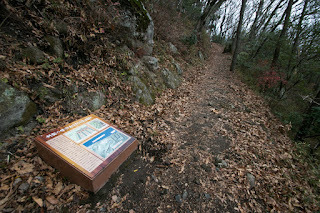 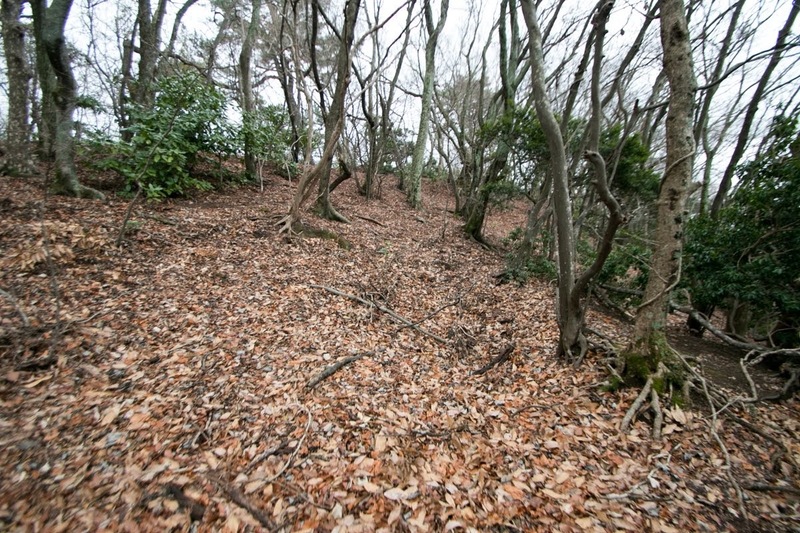 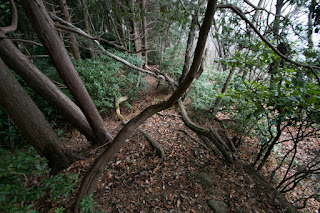 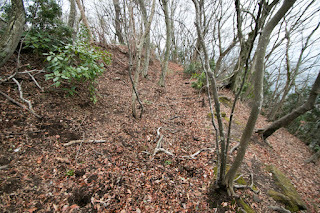 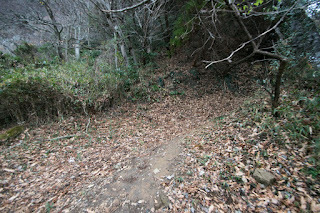 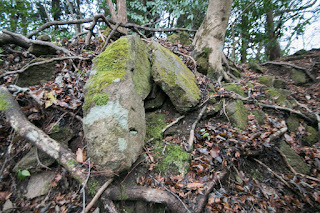 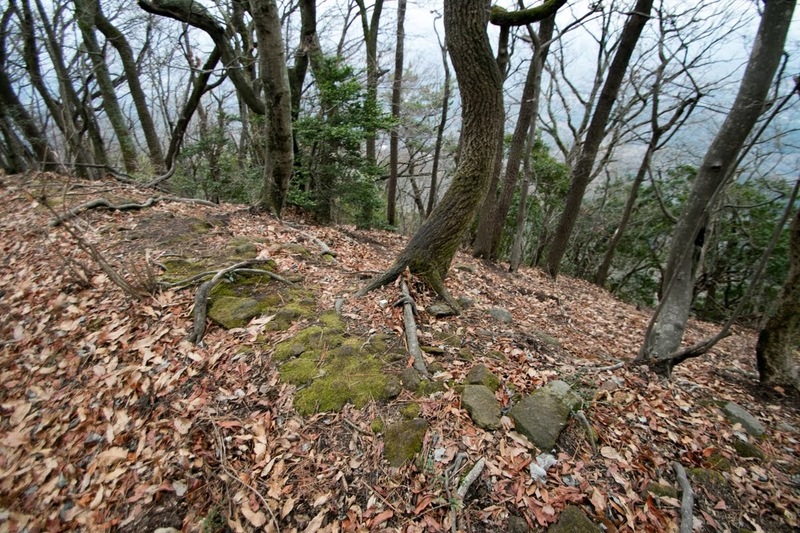 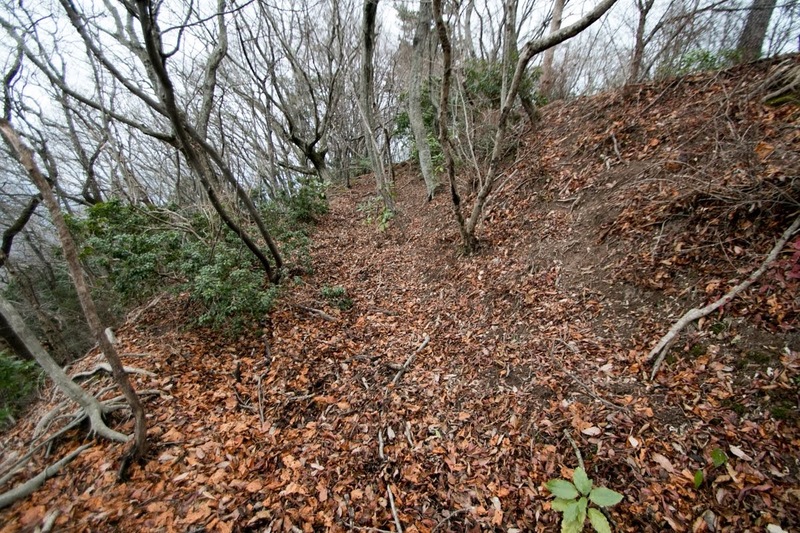 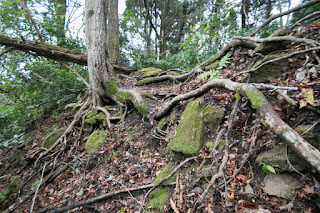 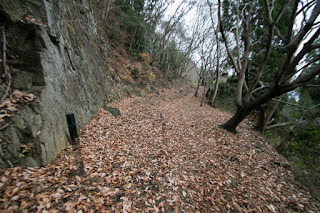 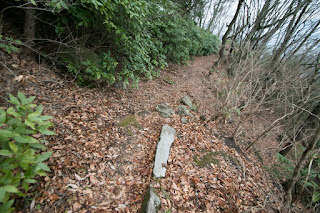 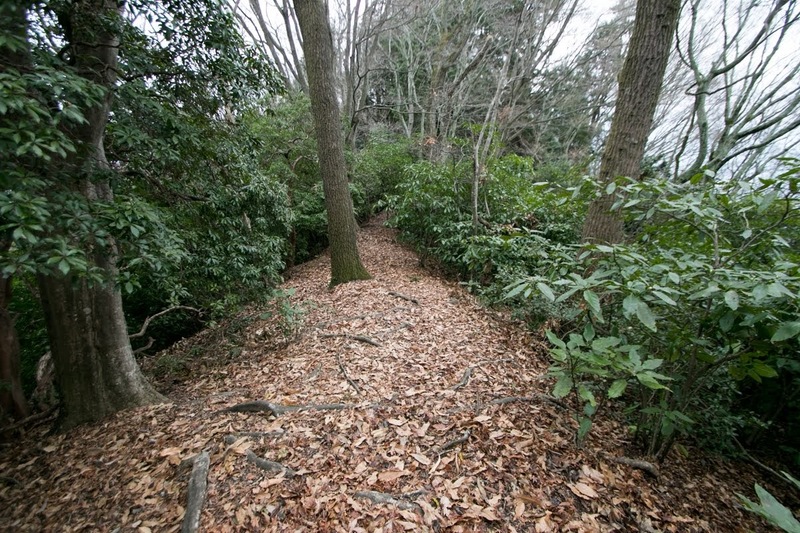 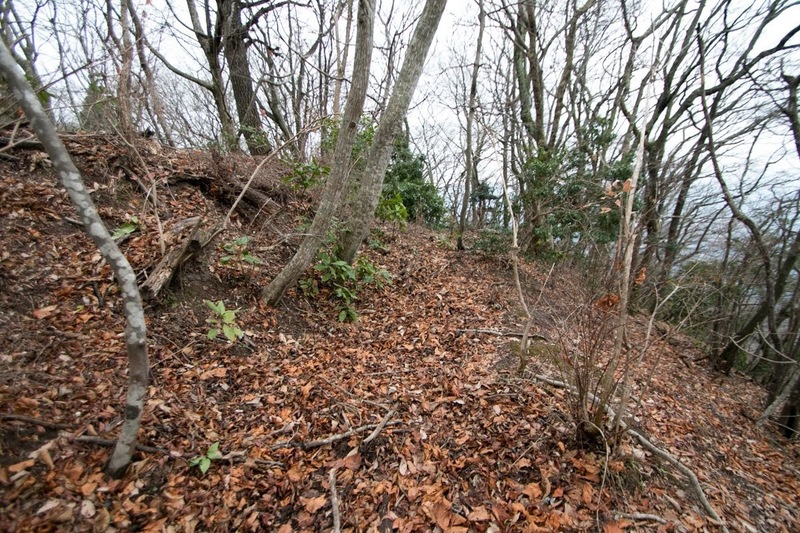 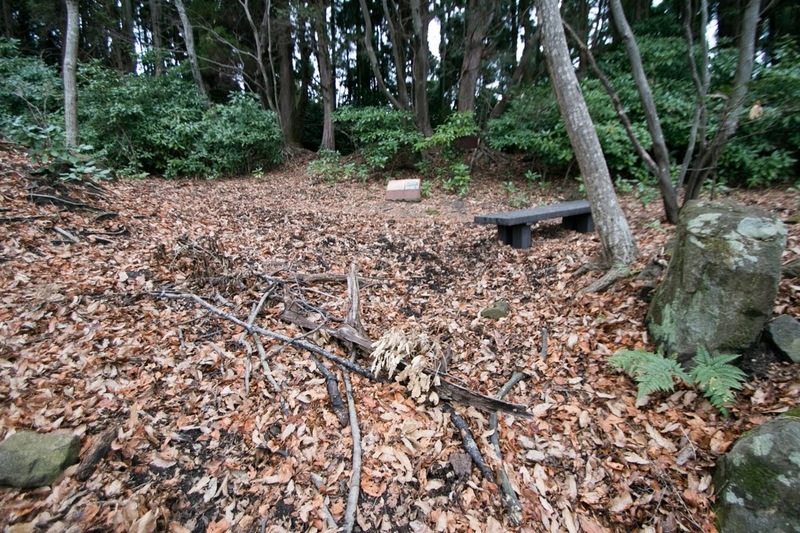 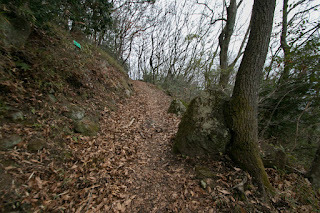 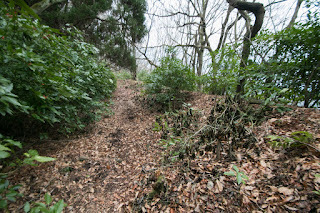 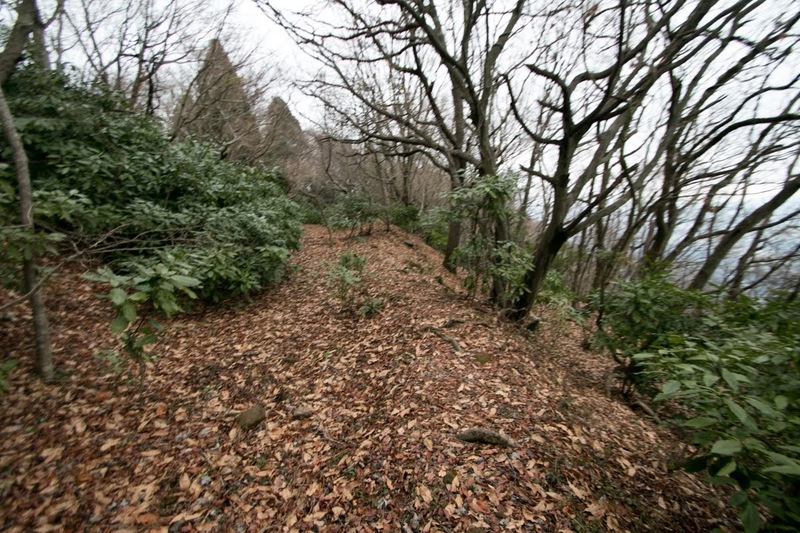 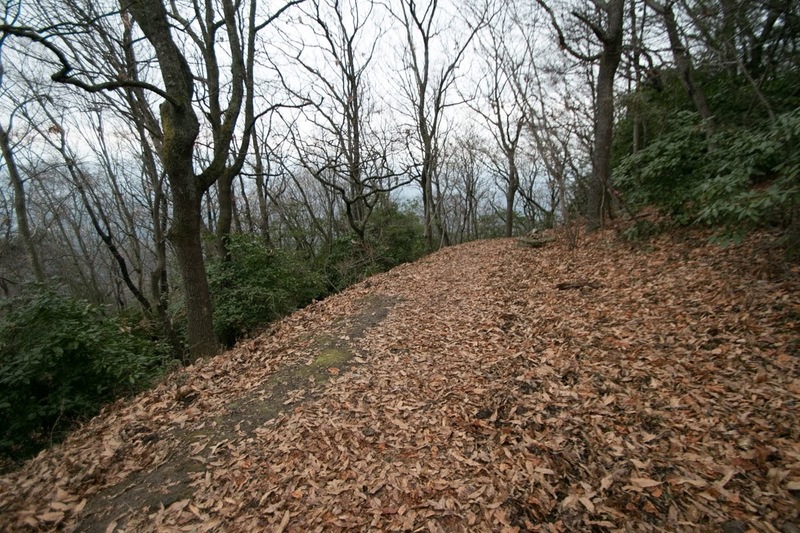 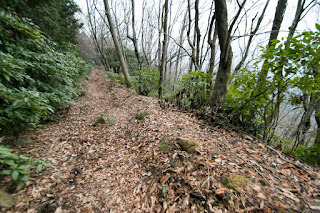 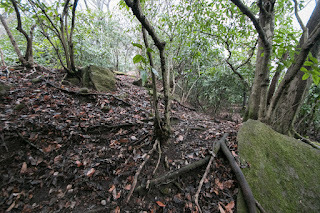 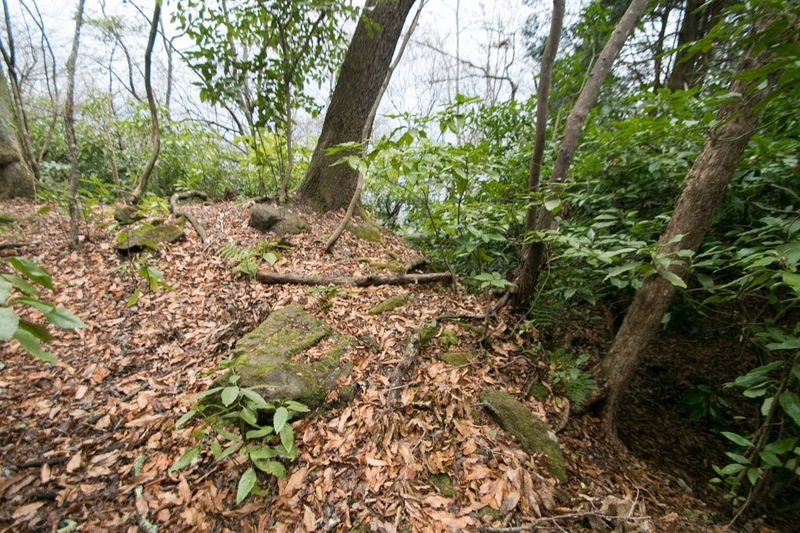 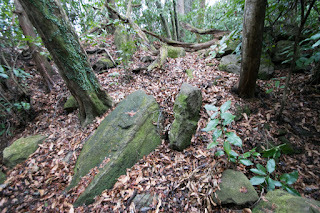 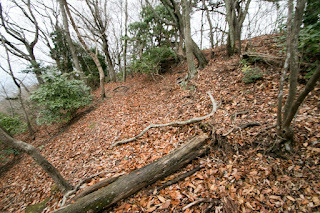 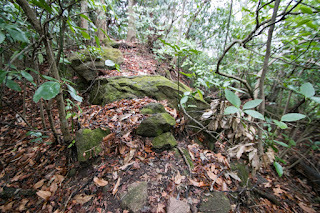 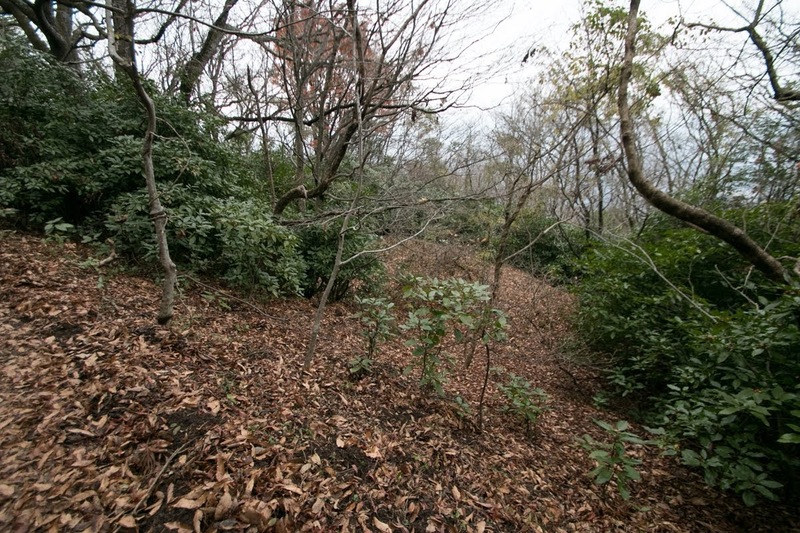 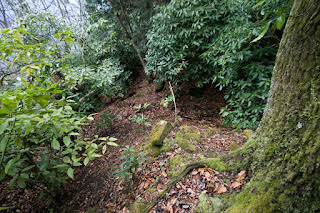 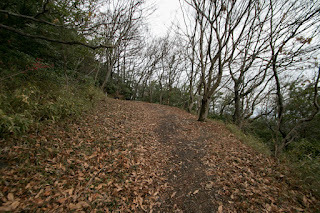 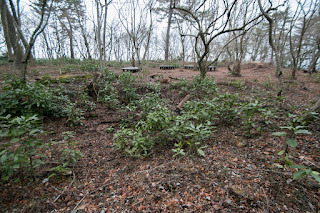 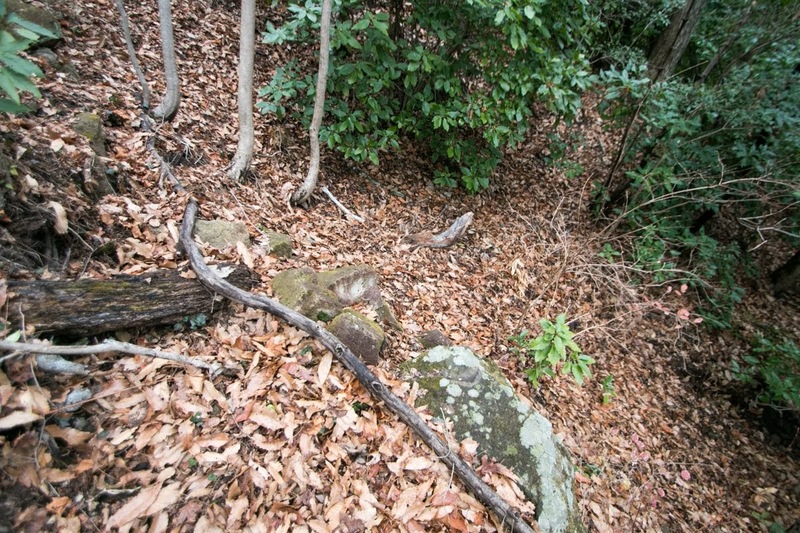 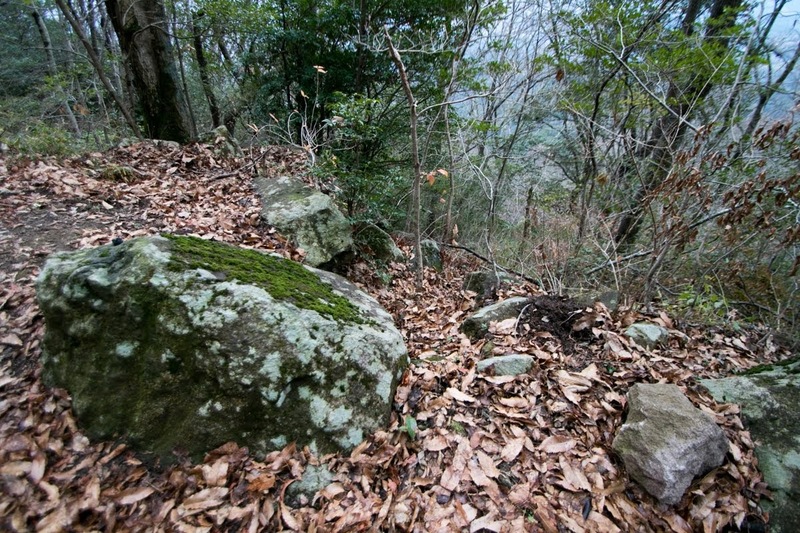 At the edge of this area there remains a ruin of signal fire basement built by Edo era. At the south of central area, ahead of huge dry moat, newly reformed area spreads over 200 meter long. 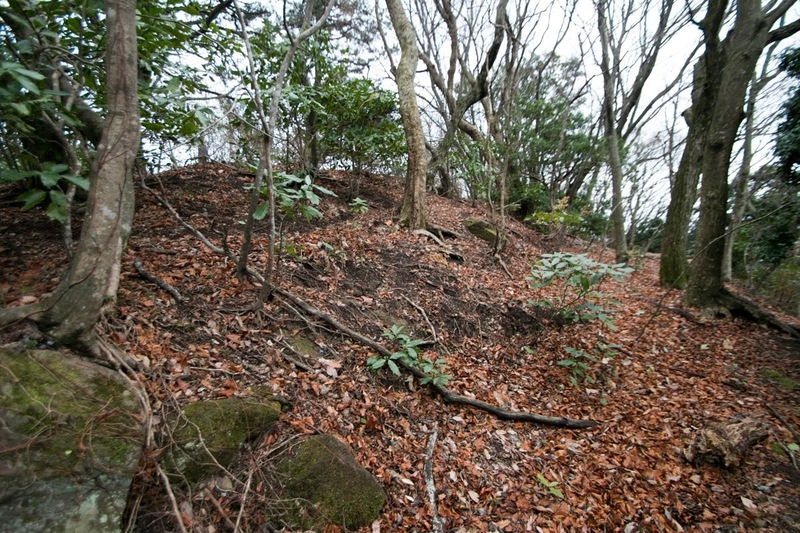 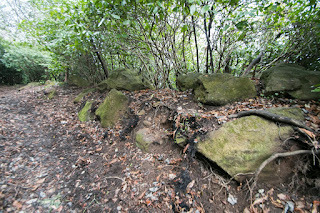 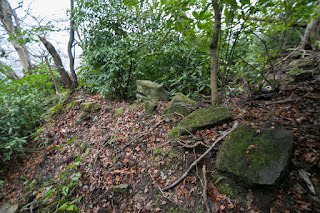 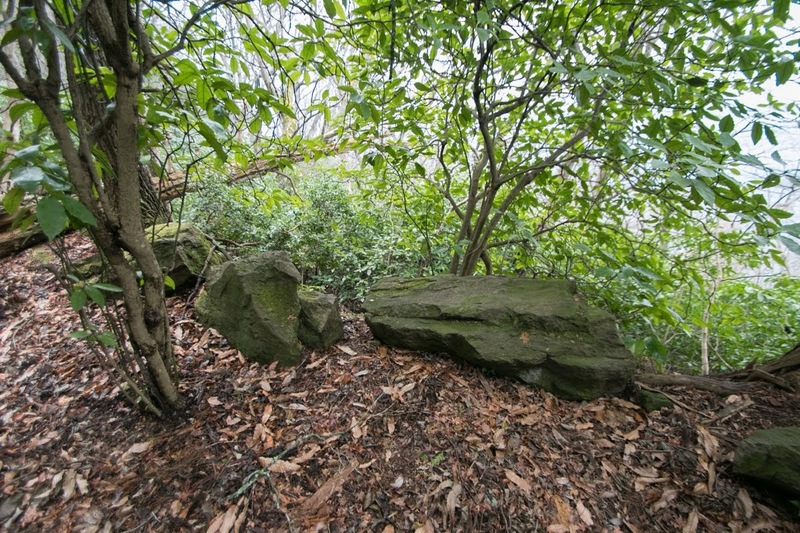 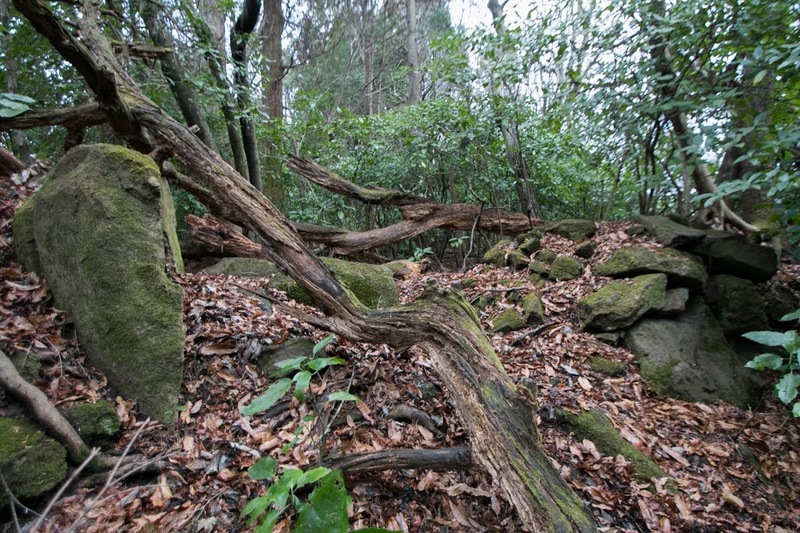 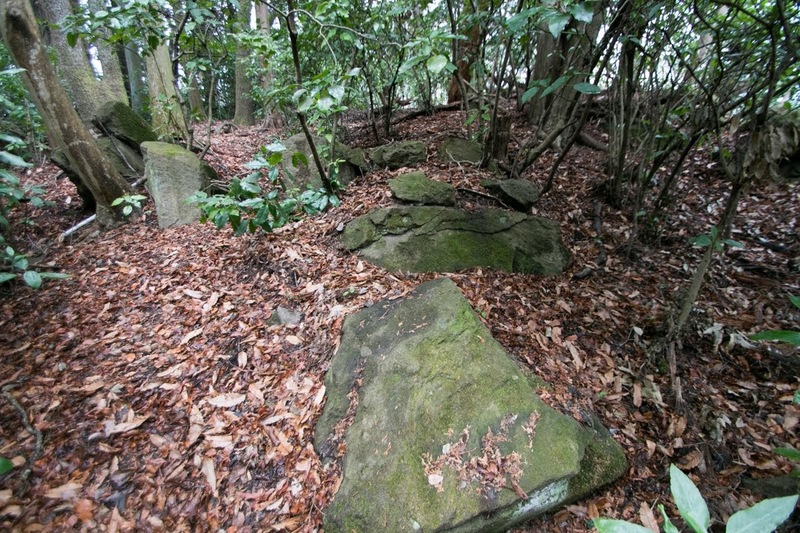 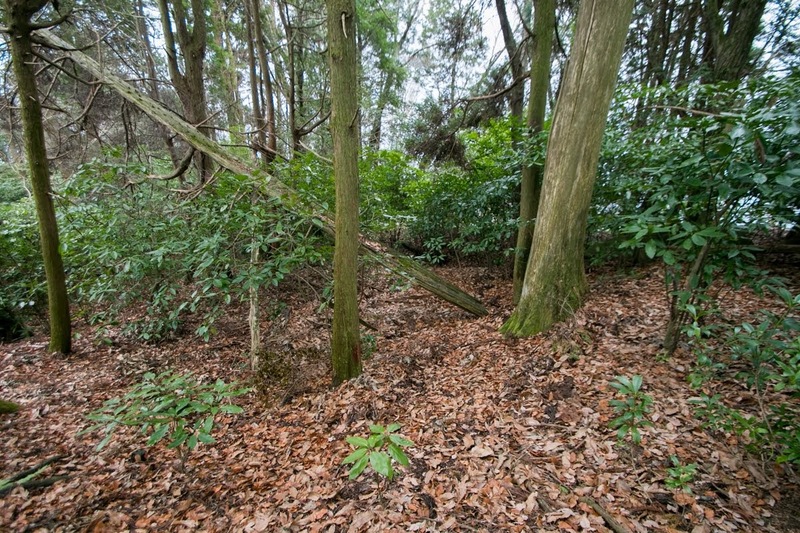 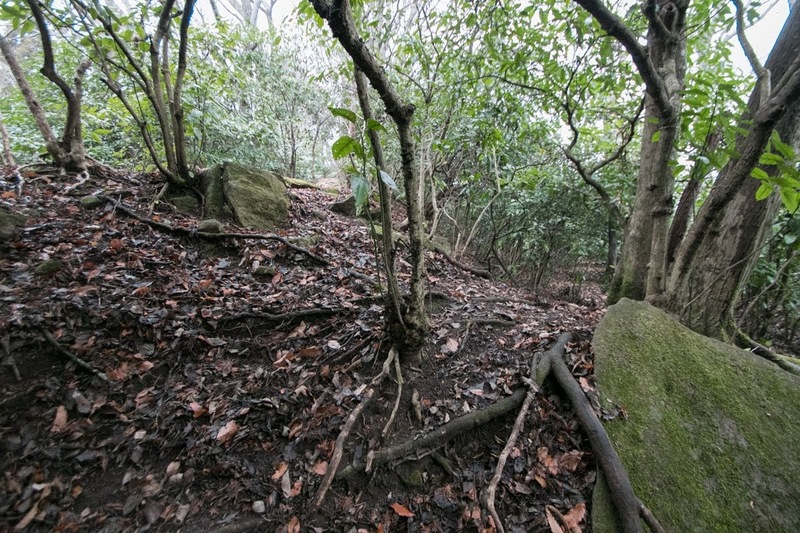 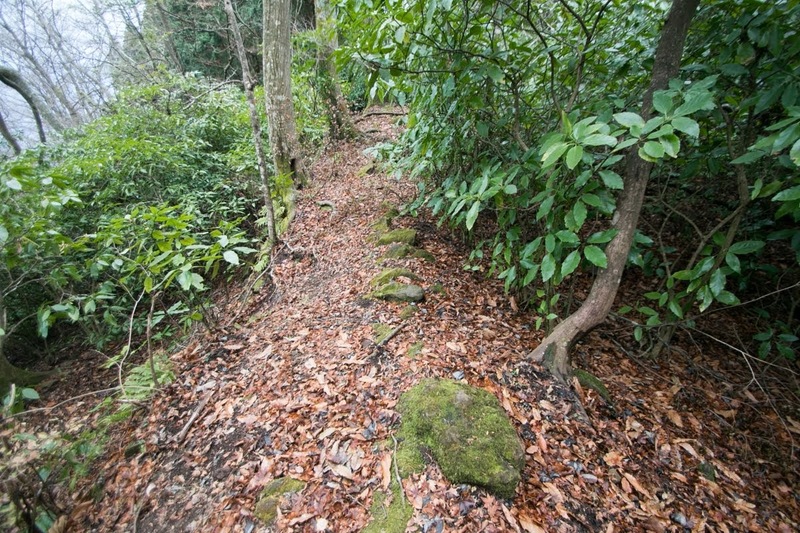 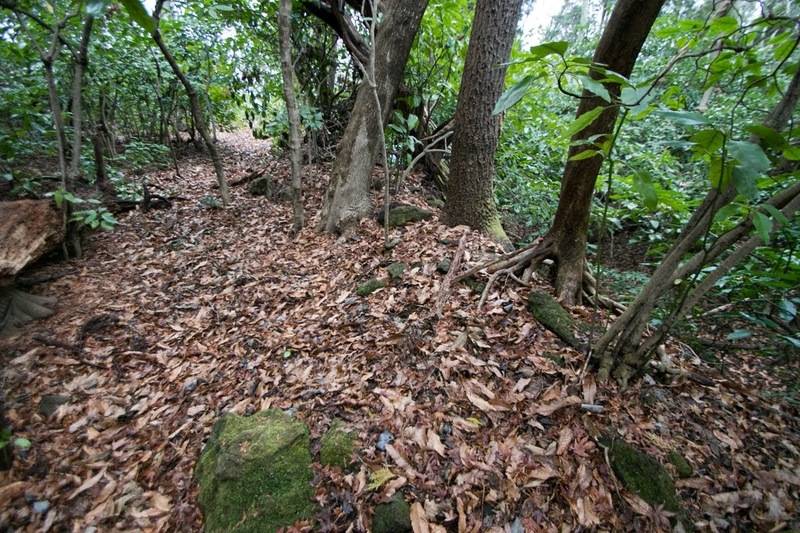 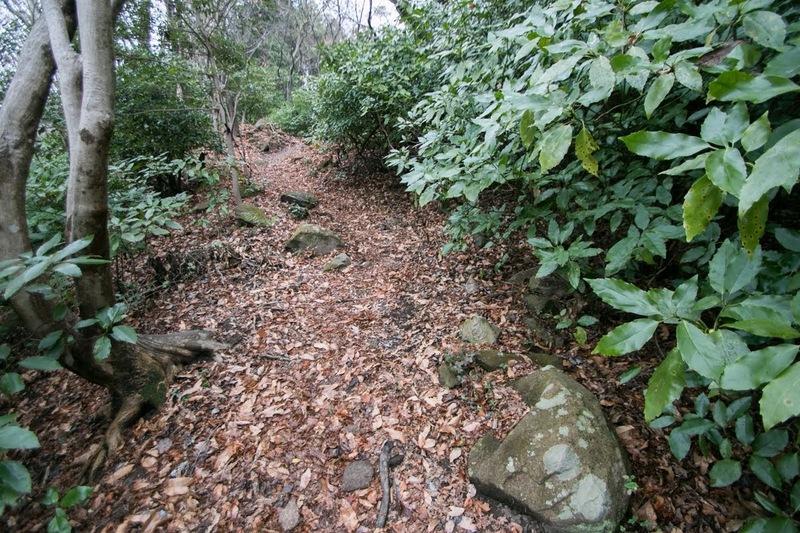 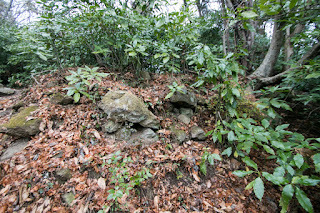 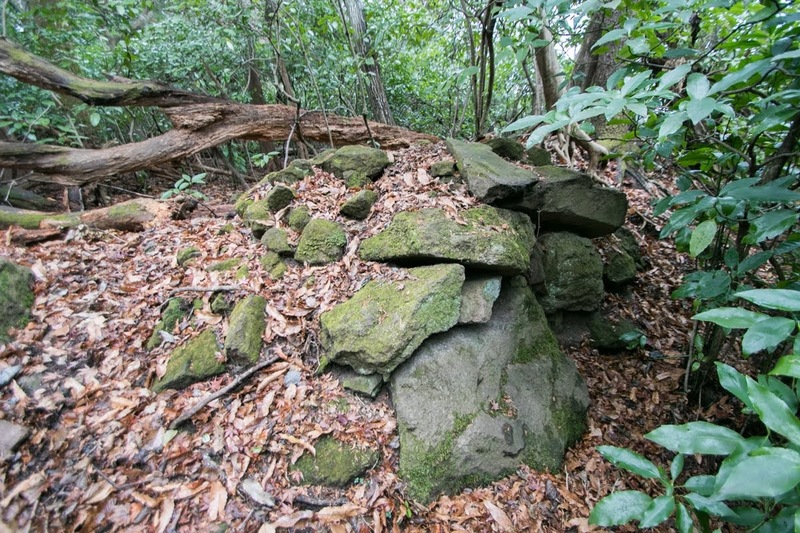 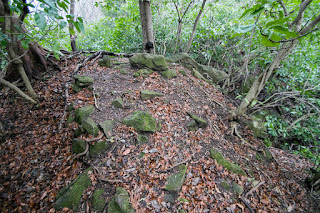 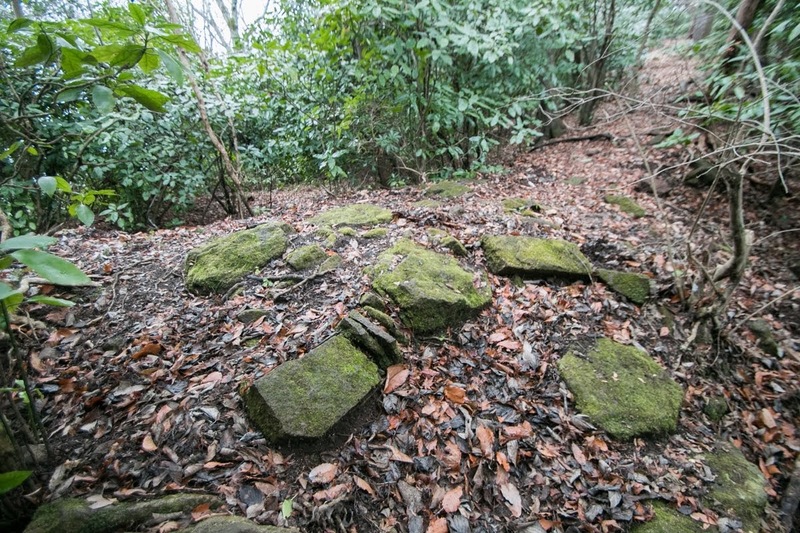 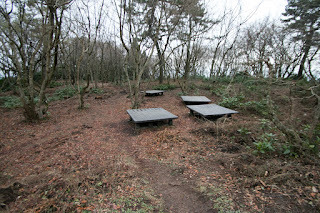 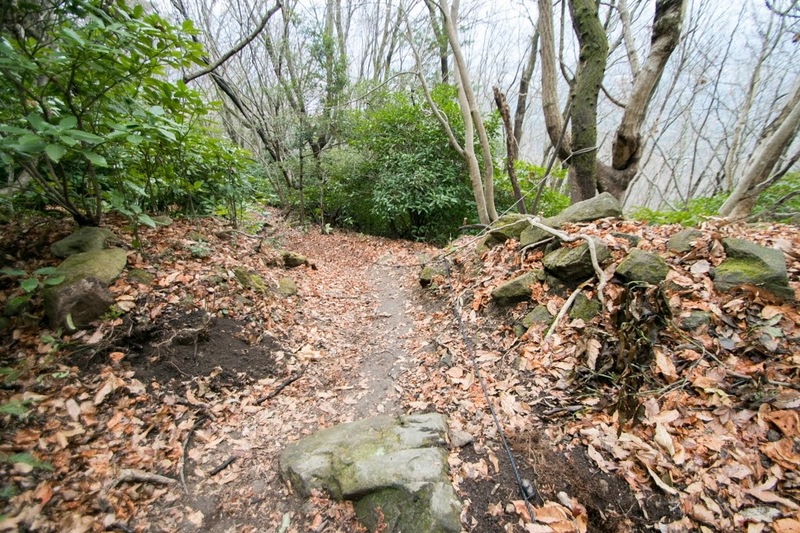 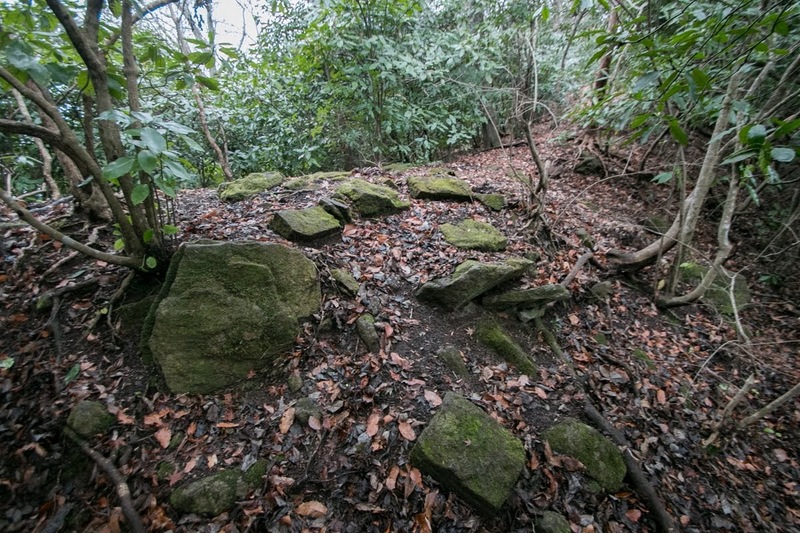 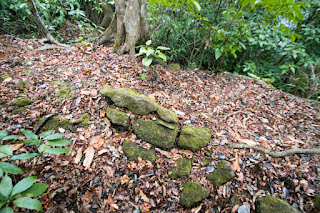 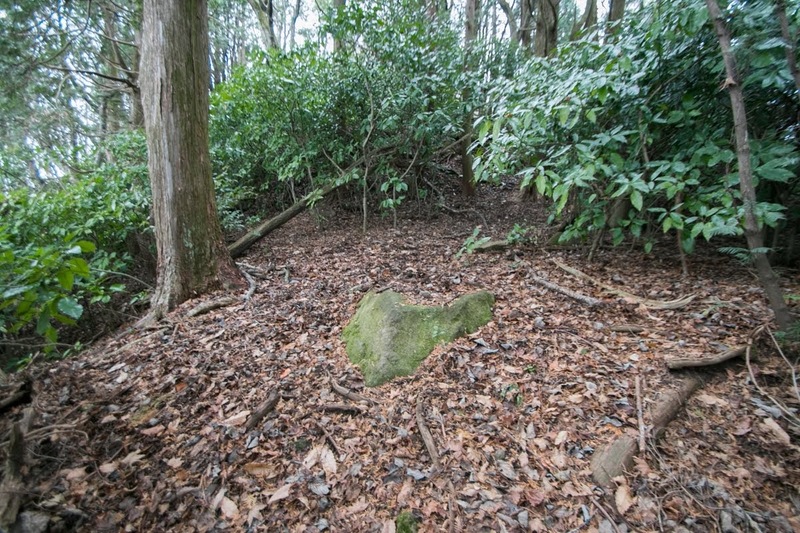 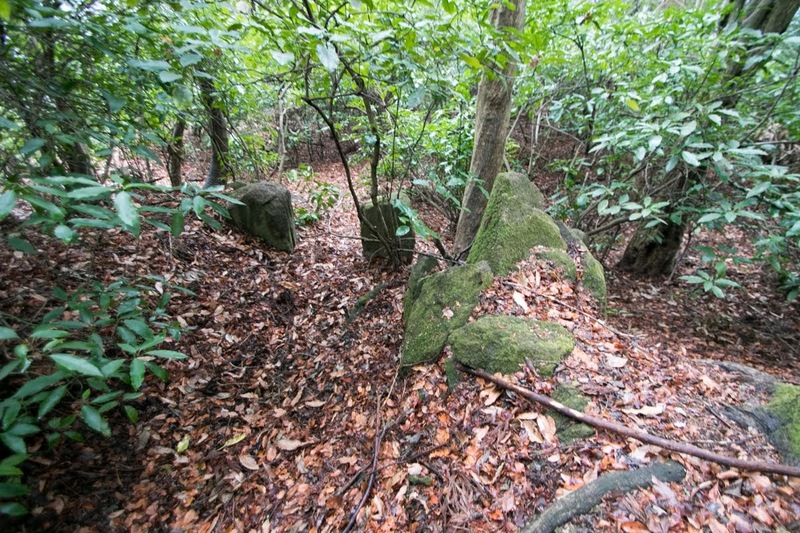 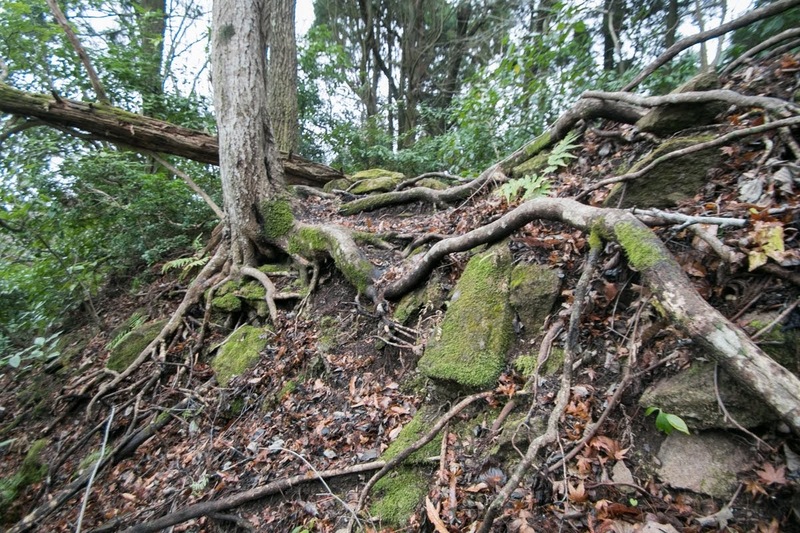 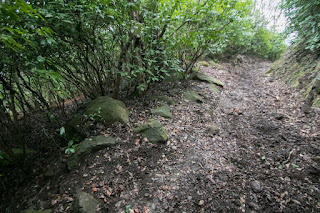 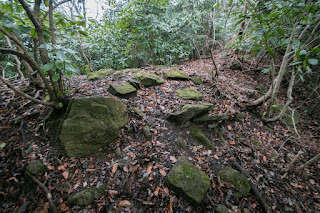 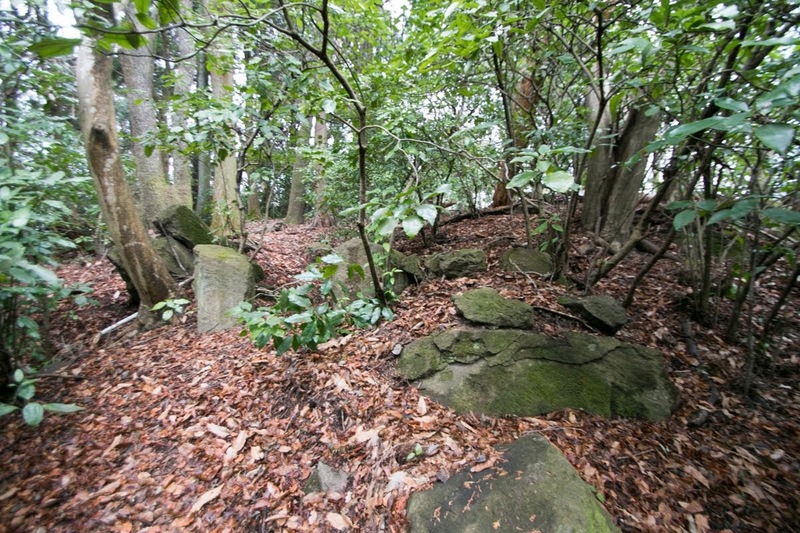 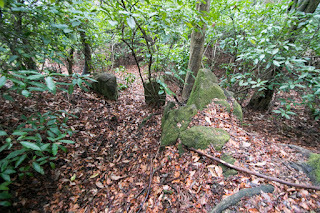 At the top of this area there is a rectangular area of 50 meter long and 30 meter wide surrounded by stone wall, which might be a commanding place. 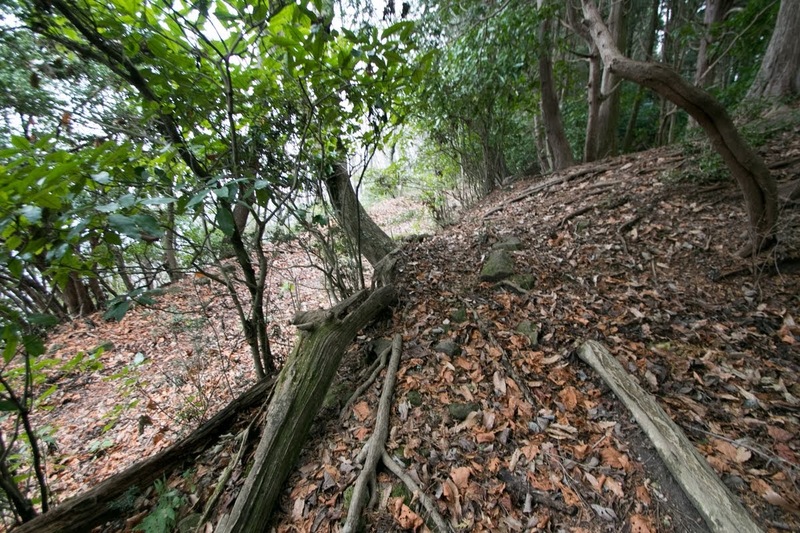 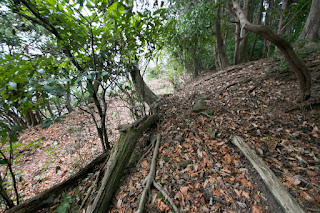 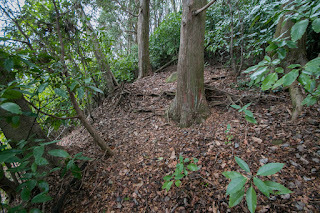 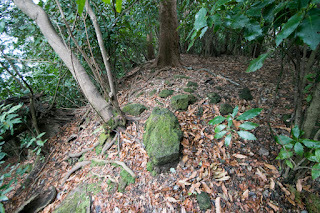 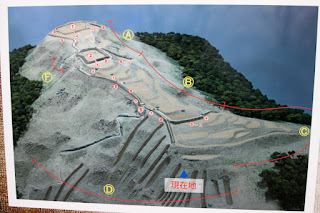 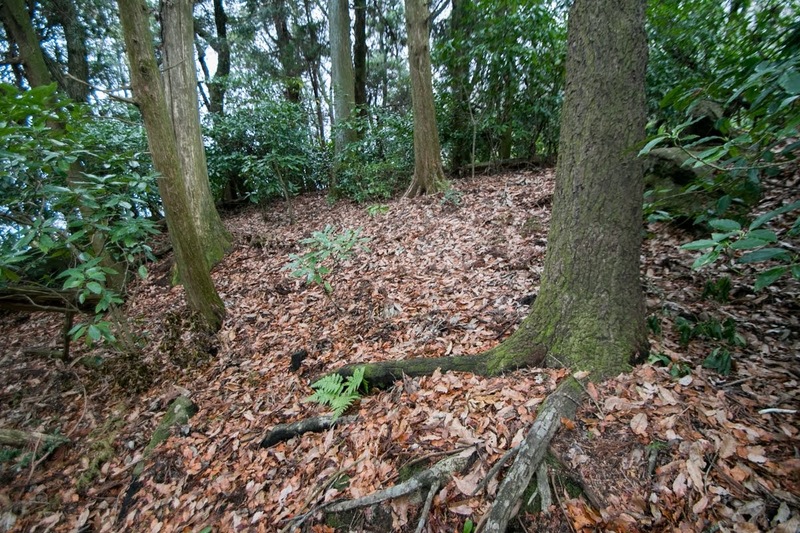 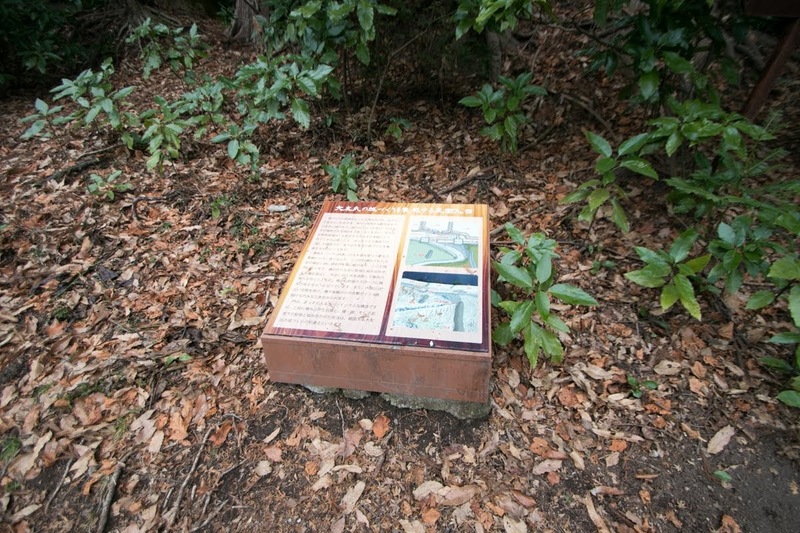 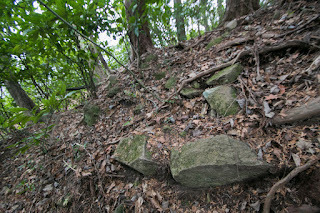 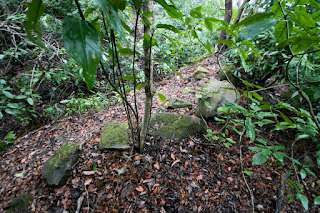 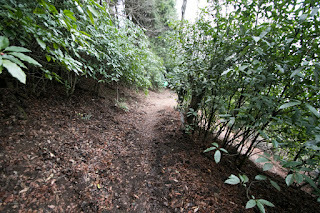 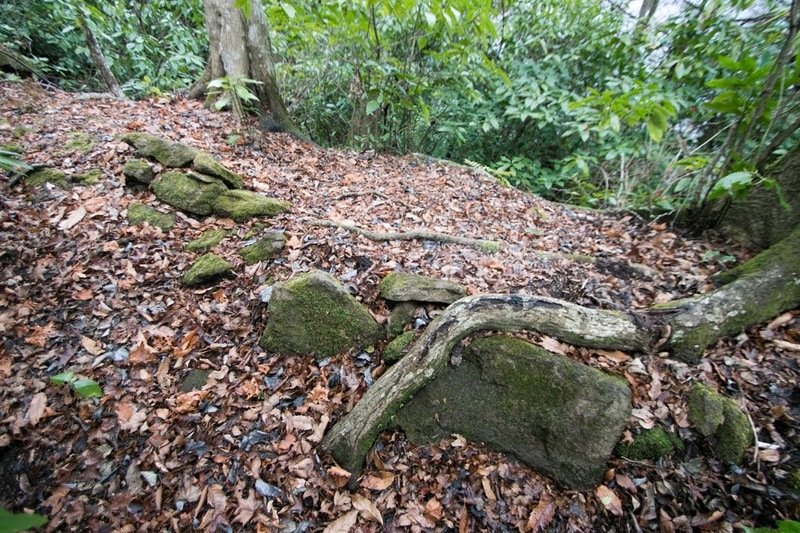 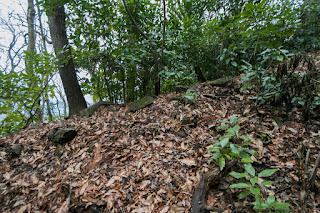 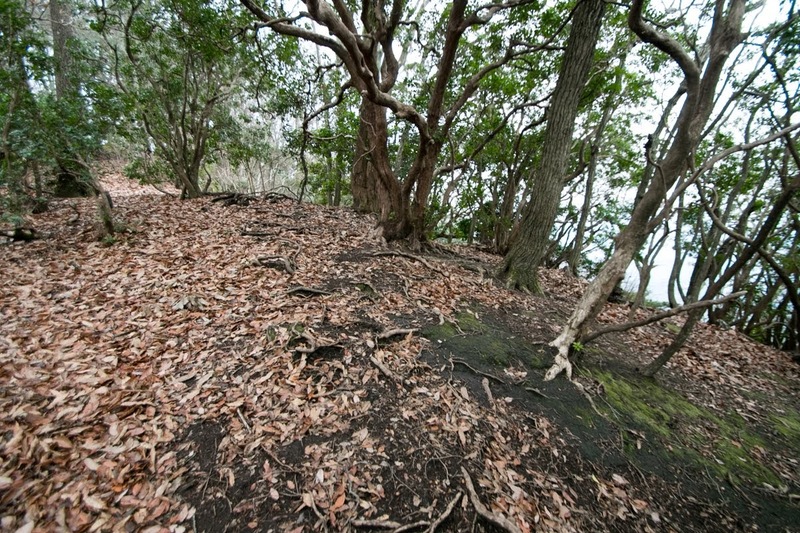 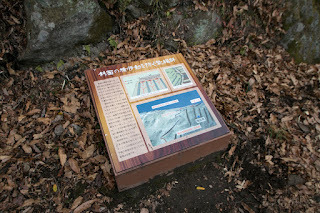 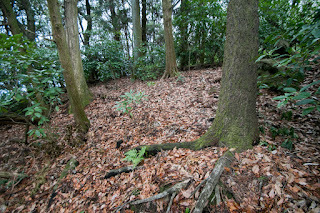 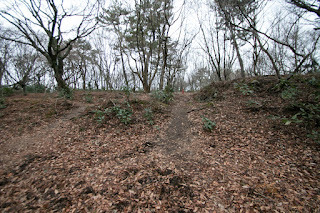 In front of this area over 10 terraces are built at the slope, and main route runs at the western edge of these areas. 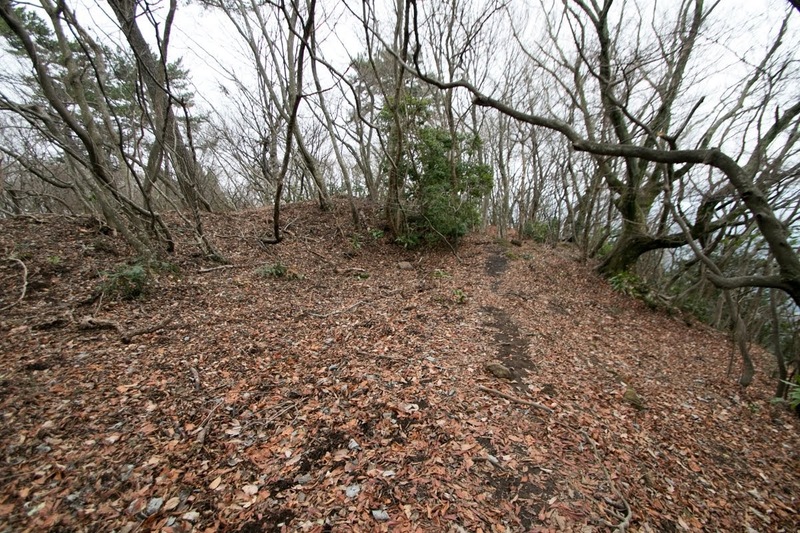 At the end of these areas, the front gate of the castle existed. 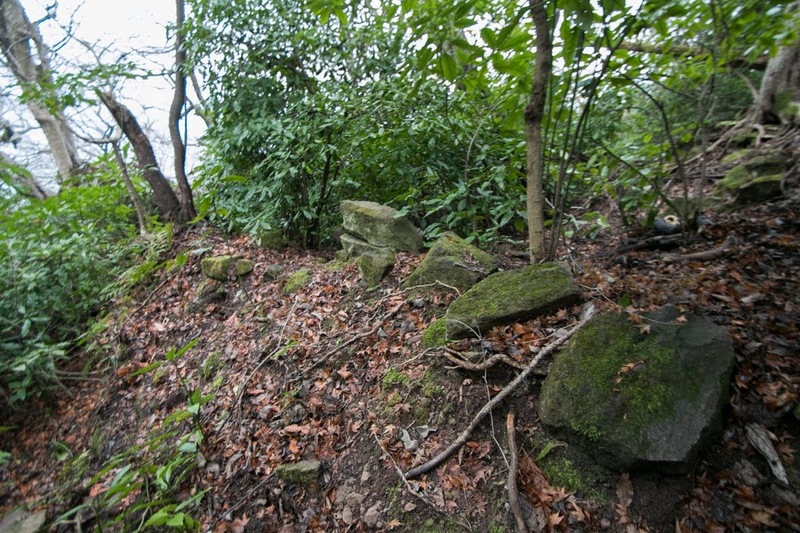 This front gate is protected by stone walls and two attached turret, and equivalent to the gate of modern castles. 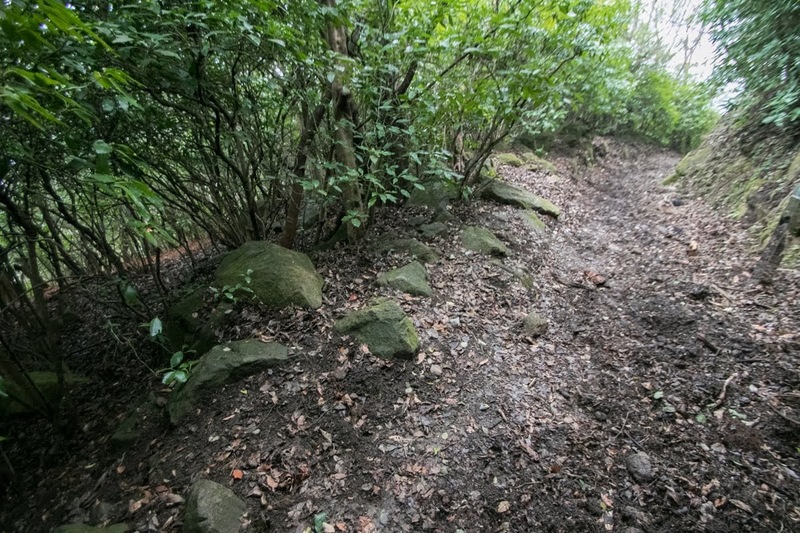 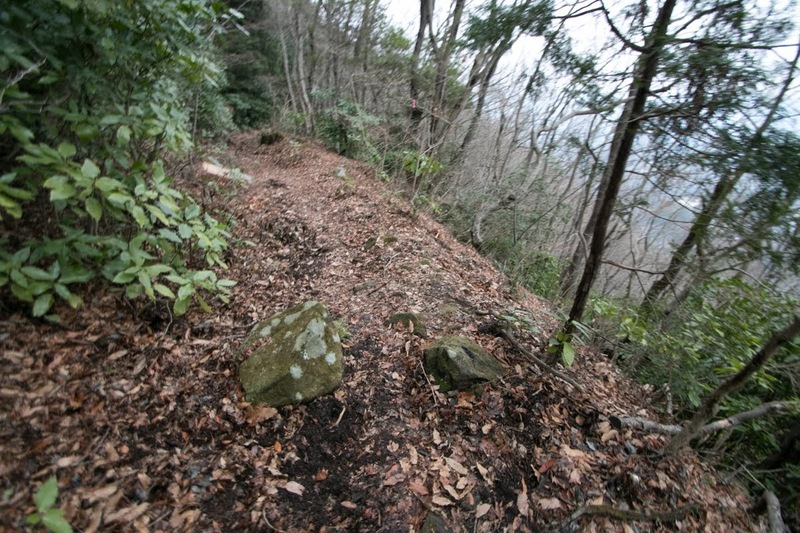 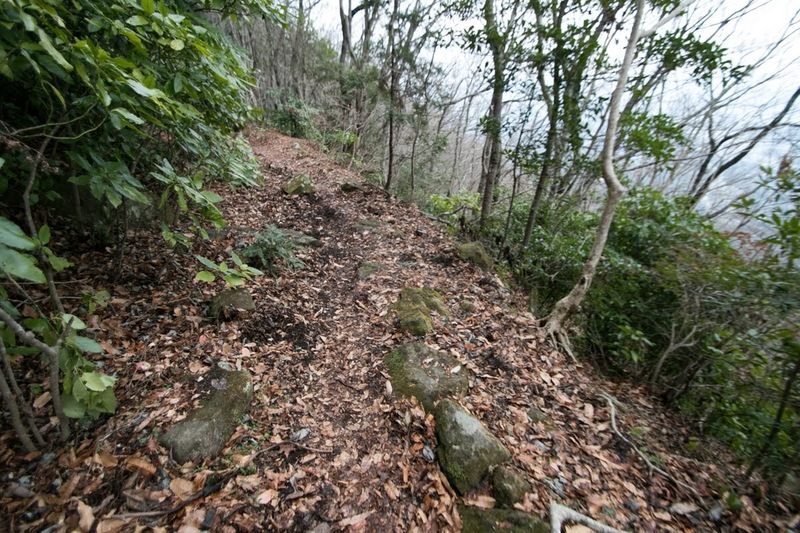 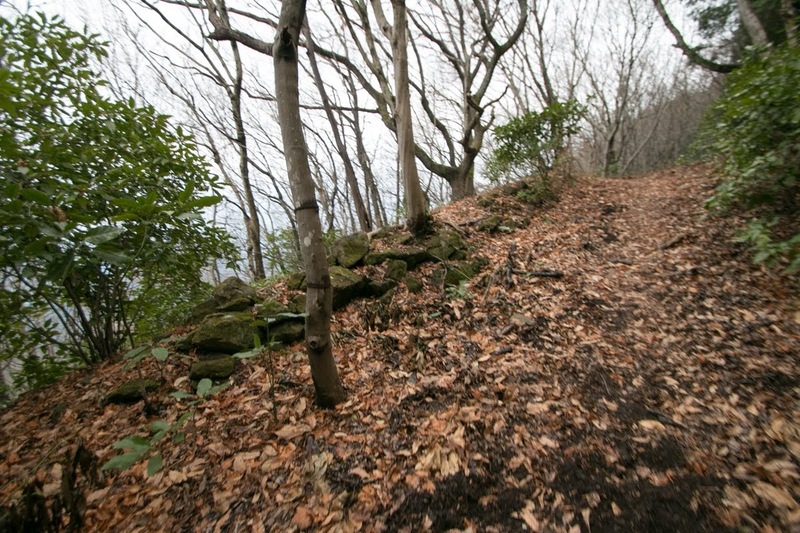 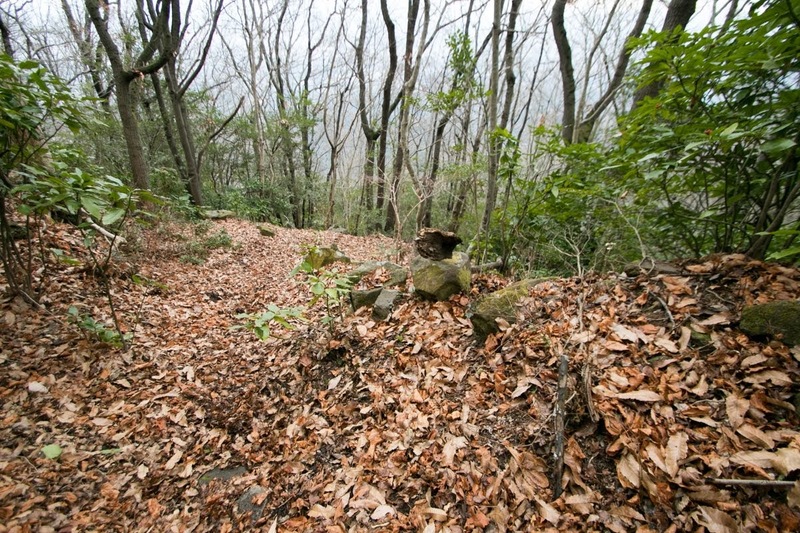 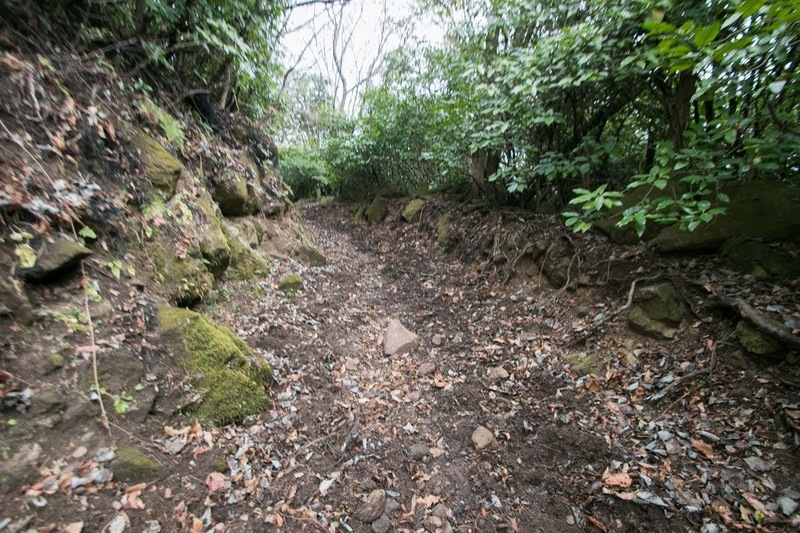 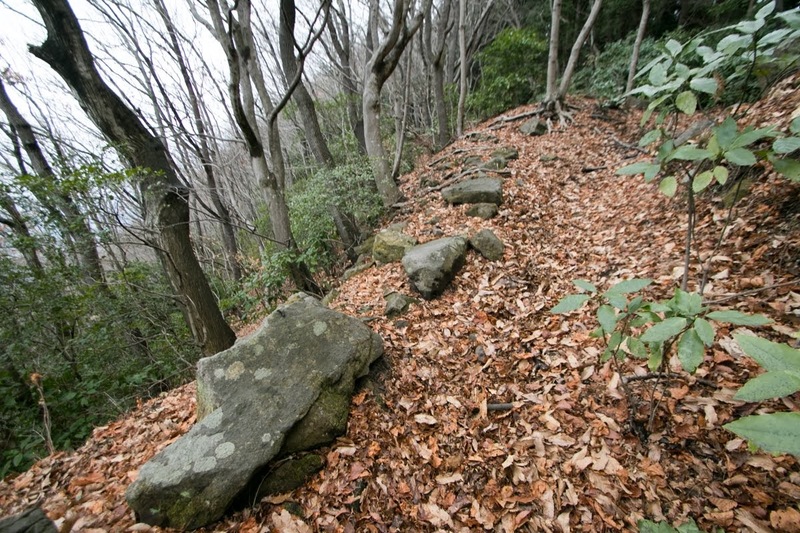 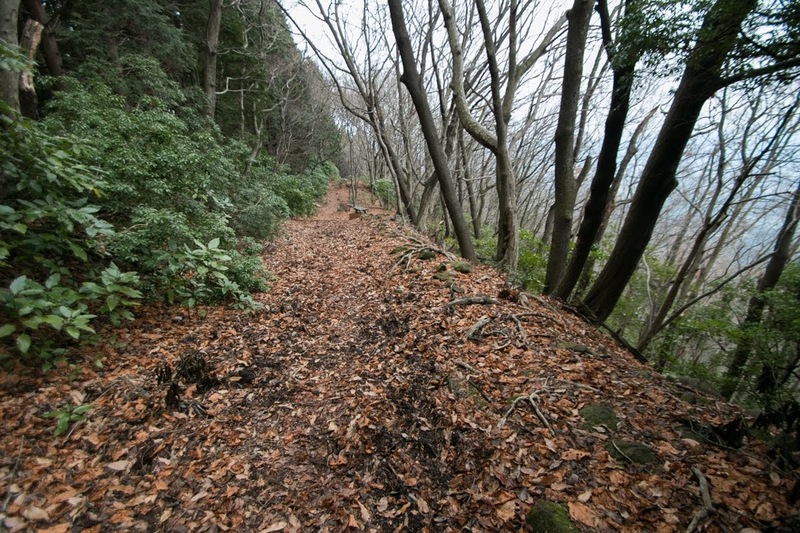 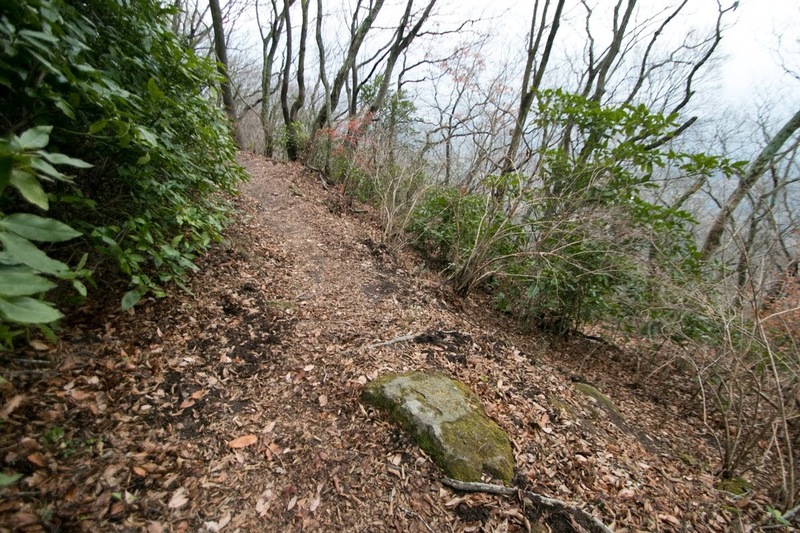 The western slope of central area and secondary area is protected by the long line of stone wall which might be added at final period. 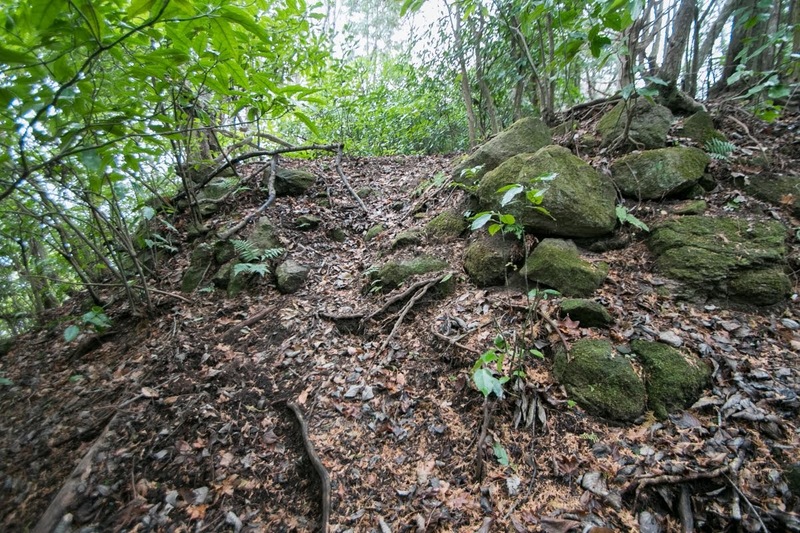 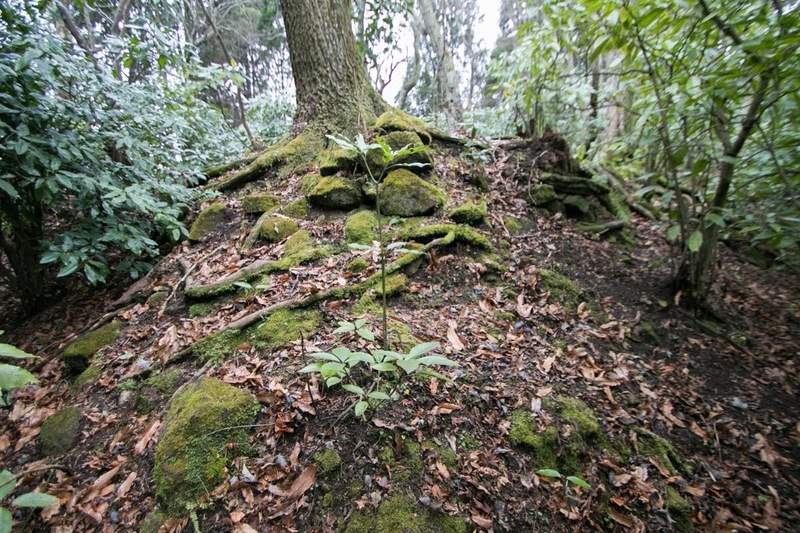 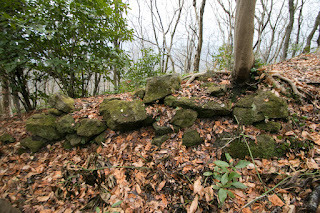 Ahead of this stone wall, small terraces and vertical moats are built to prevent the attack from gentle slope. 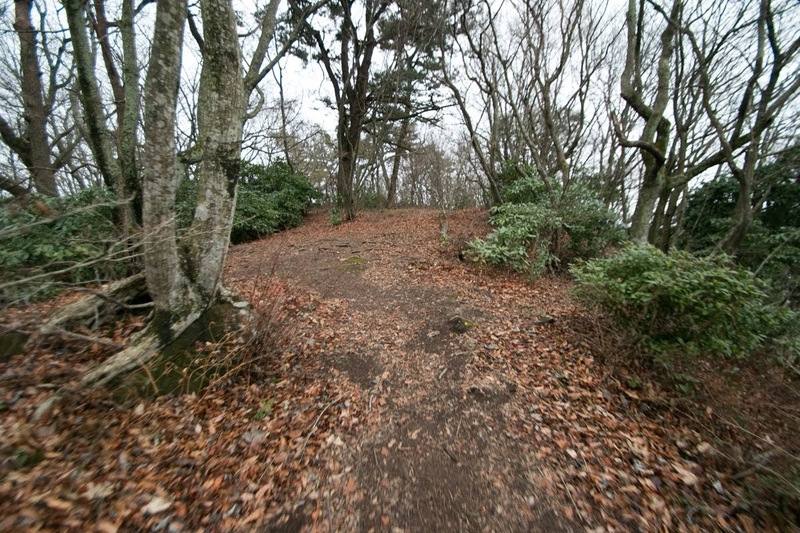 Total length of the castle exceeds over 600 meter, and is one of the largest castle of Otomo clan. 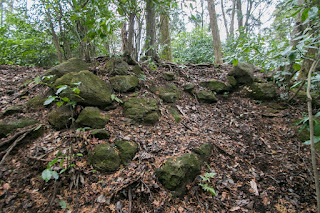 In addition to this size, elements of the castle such as clearly shaped terraces, deep vertical moats or lines of stone walls shows the latest castle technology of Otomo clan. Otomo clan relied on Takasakia castle as last resort, where formerly saved their ancestor from strong enemy. 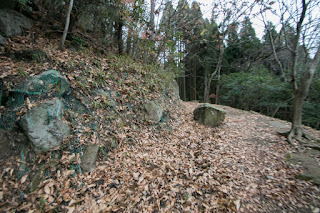 In 1586 autumn, Shimazu clan which was the governor of Satsuma province (Kagoshima prefecture) and broke Otomo army at the battle of Mimikawa in 1578, started total attack to Otomo clan. 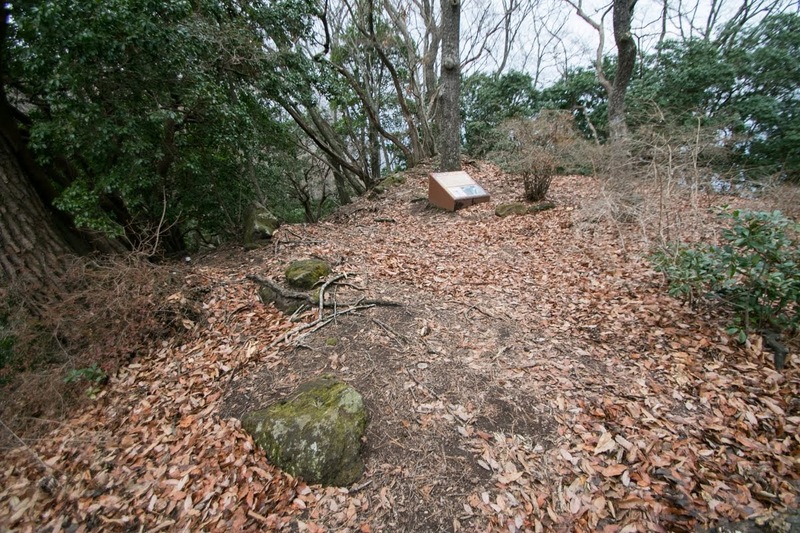 Because of the defeat at Mimikawa and rebels of important retainers, Otomo clan did not have the power to prevent the invasion any more. 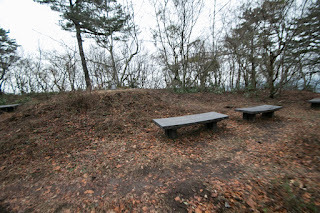 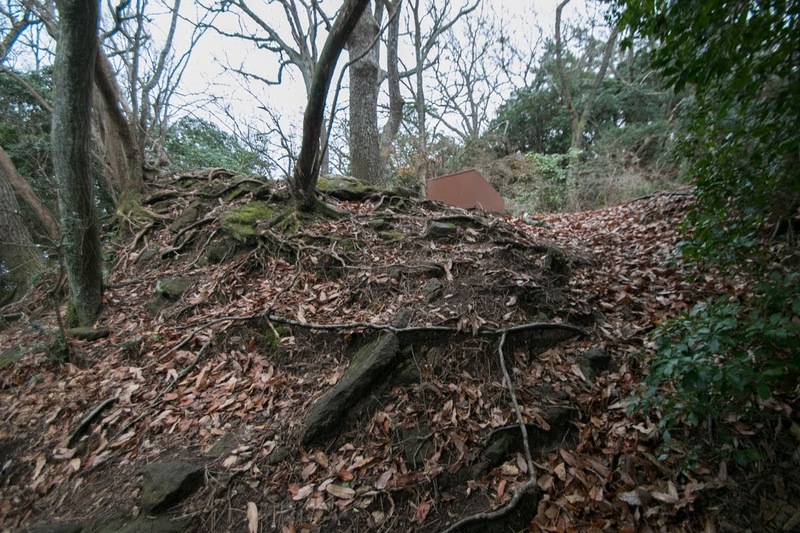 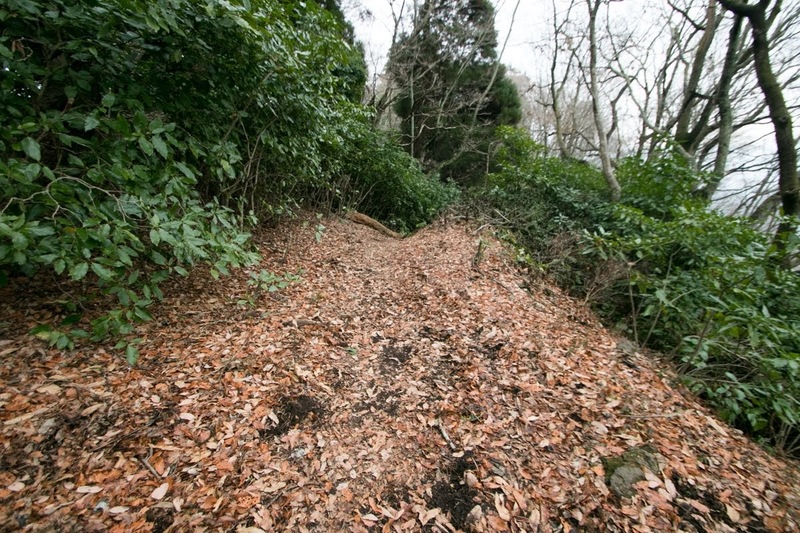 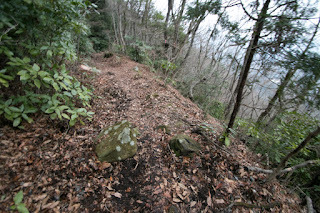 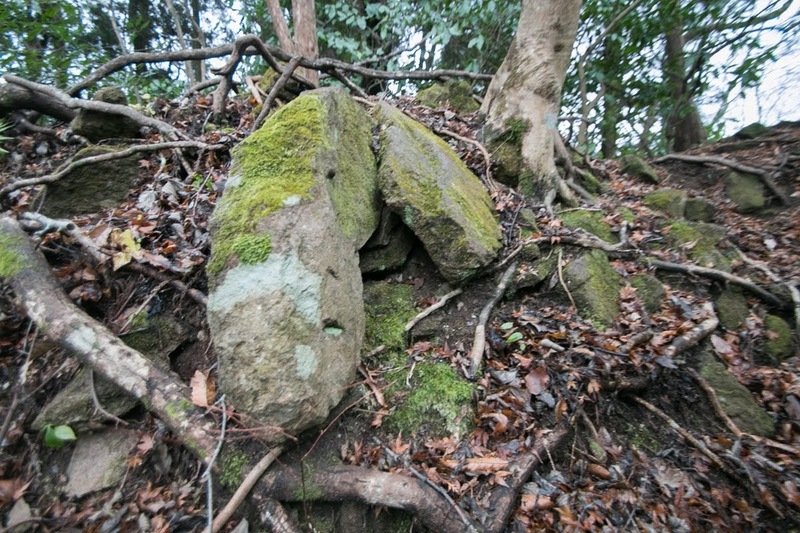 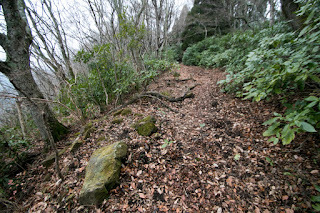 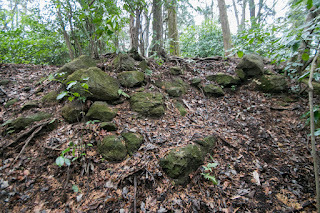 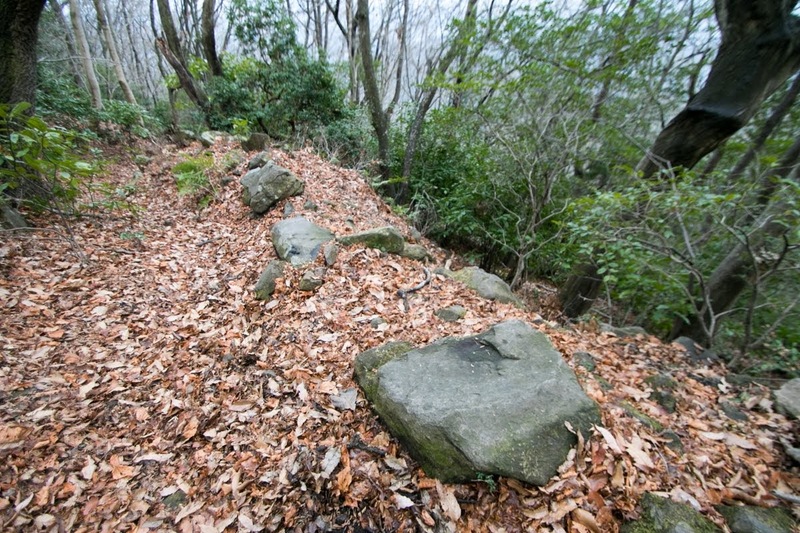 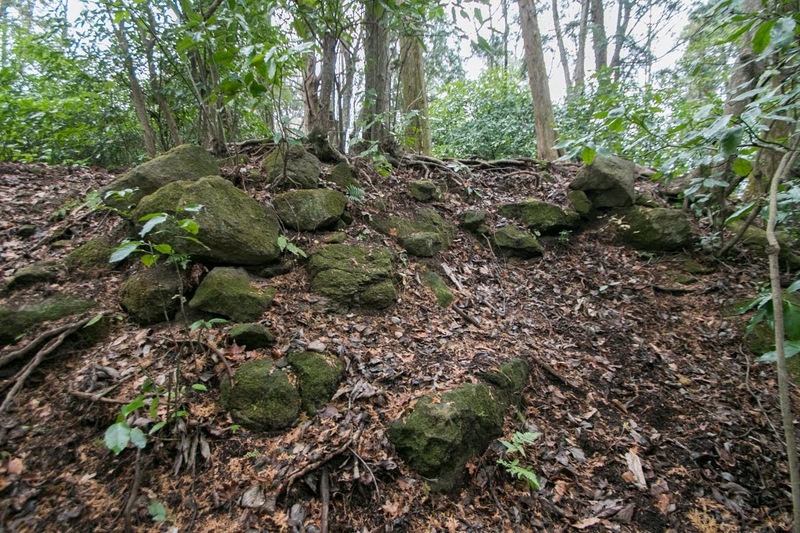 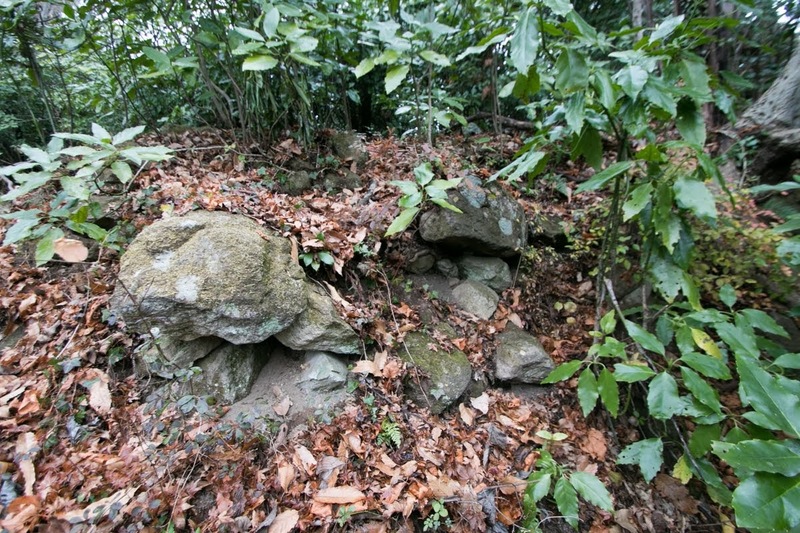 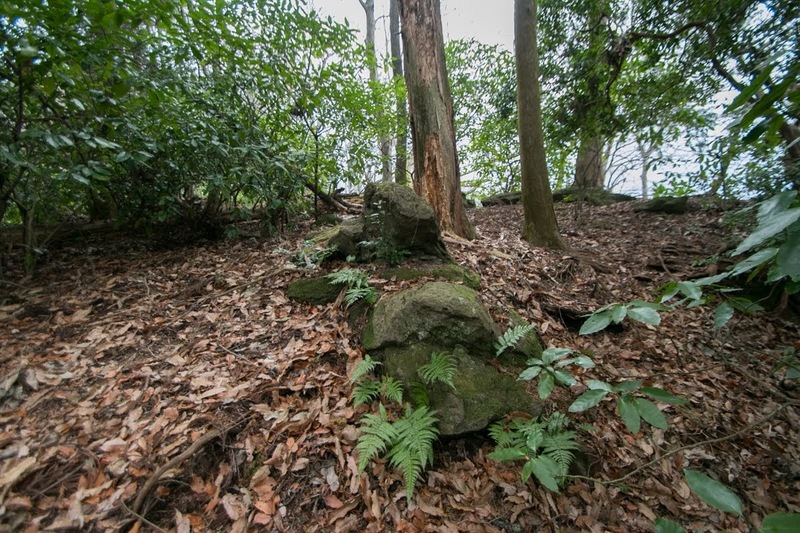 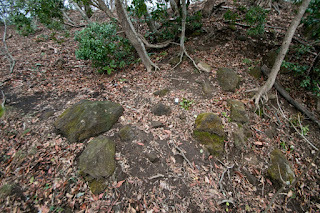 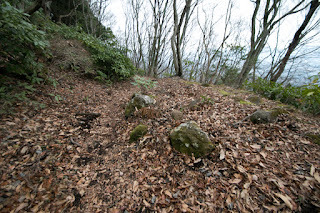 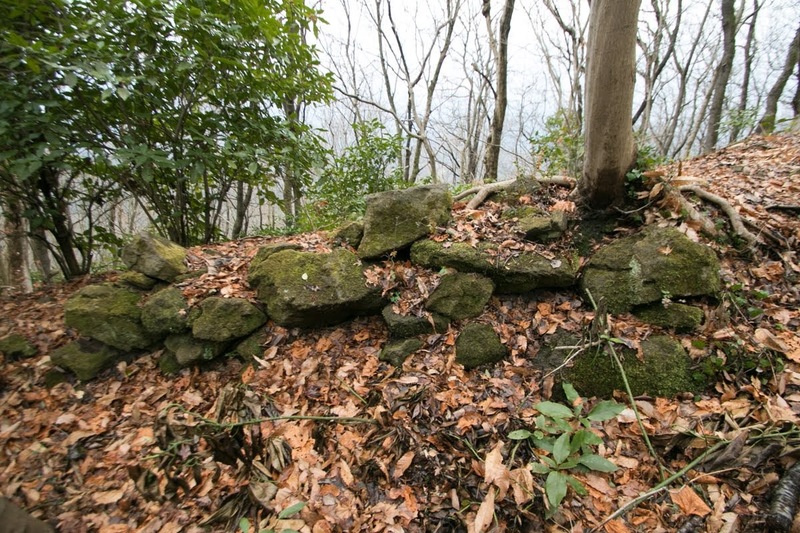 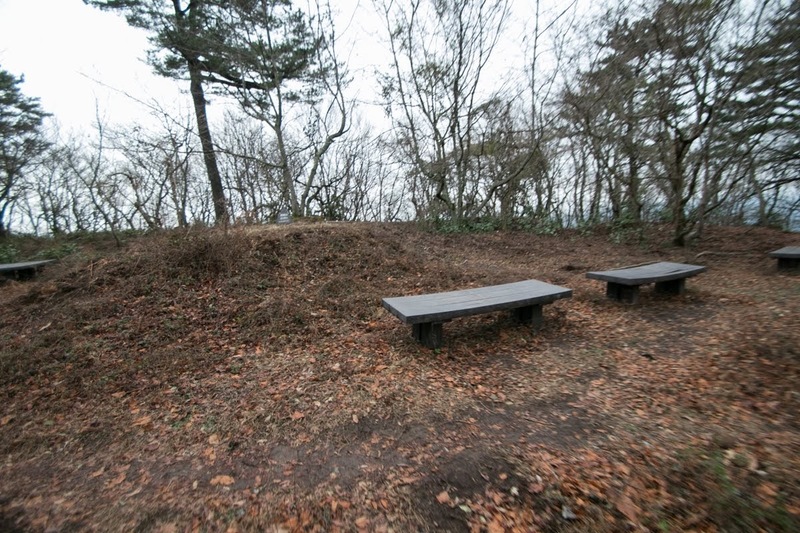 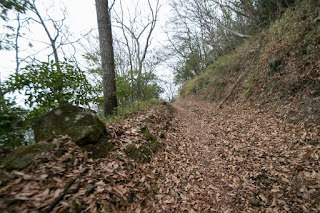 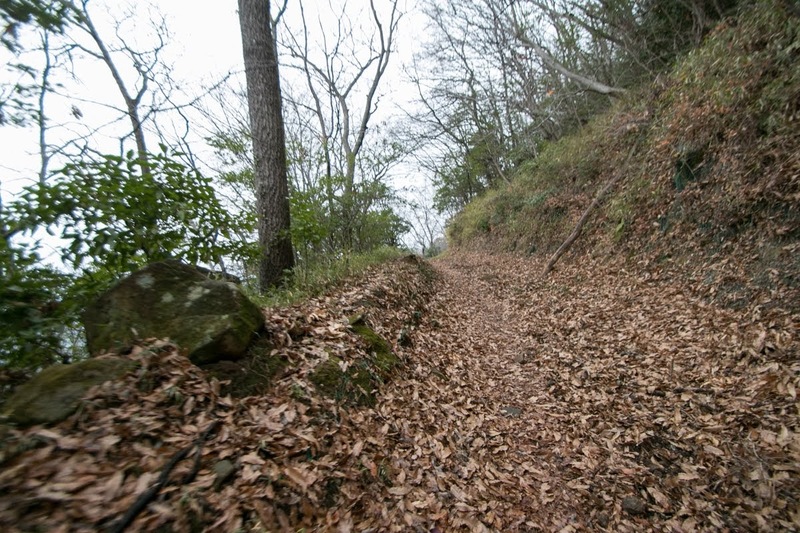 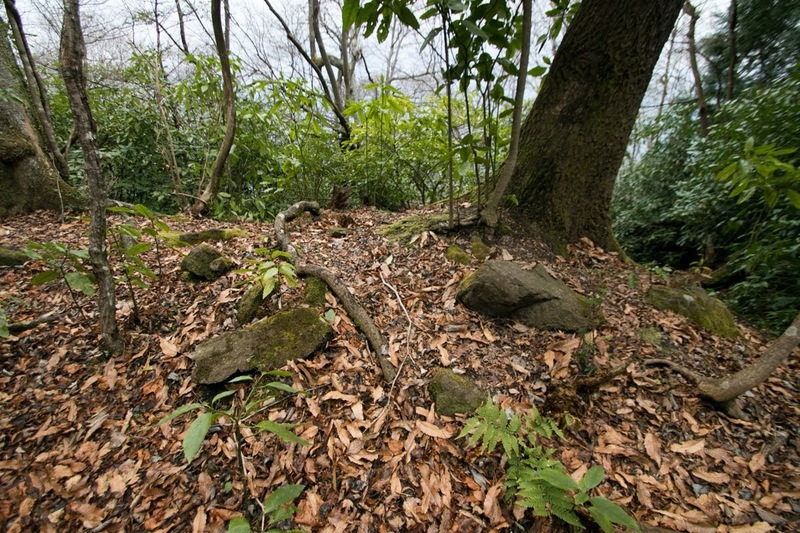 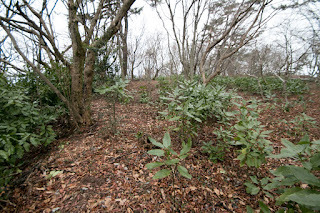 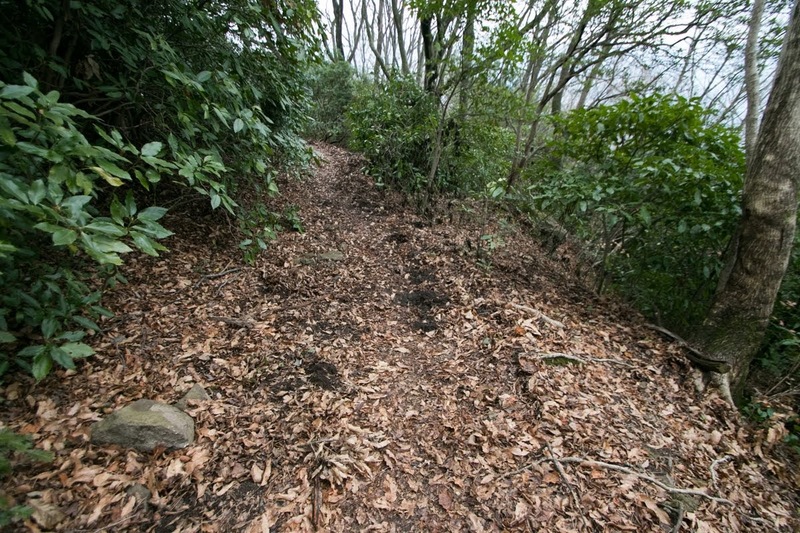 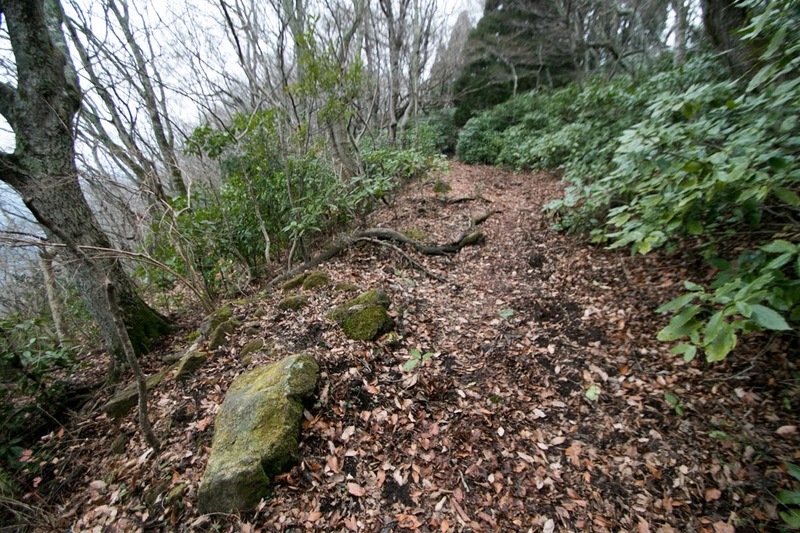 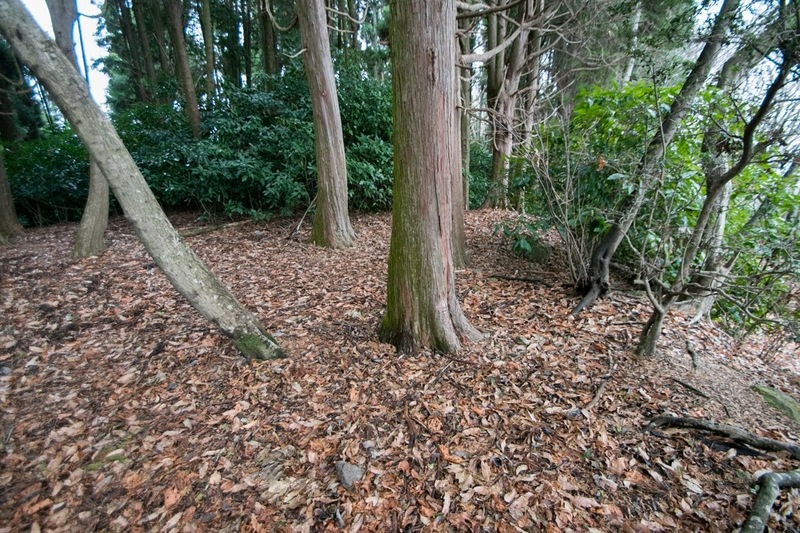 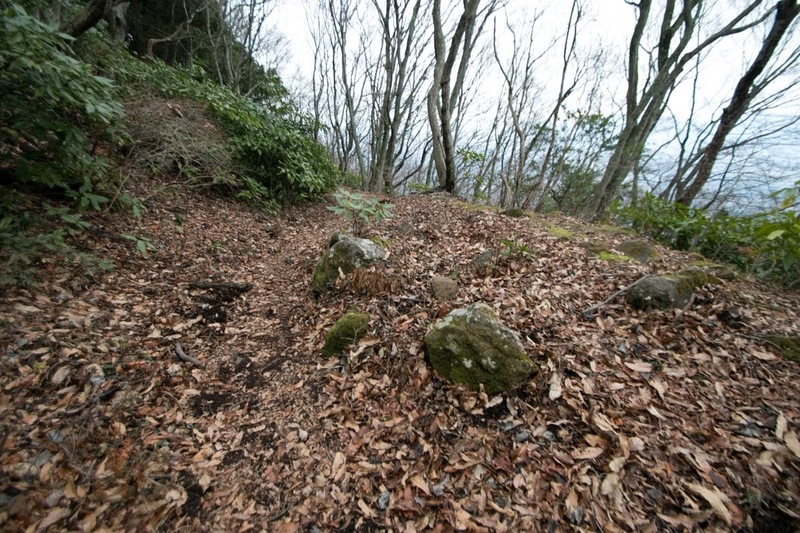 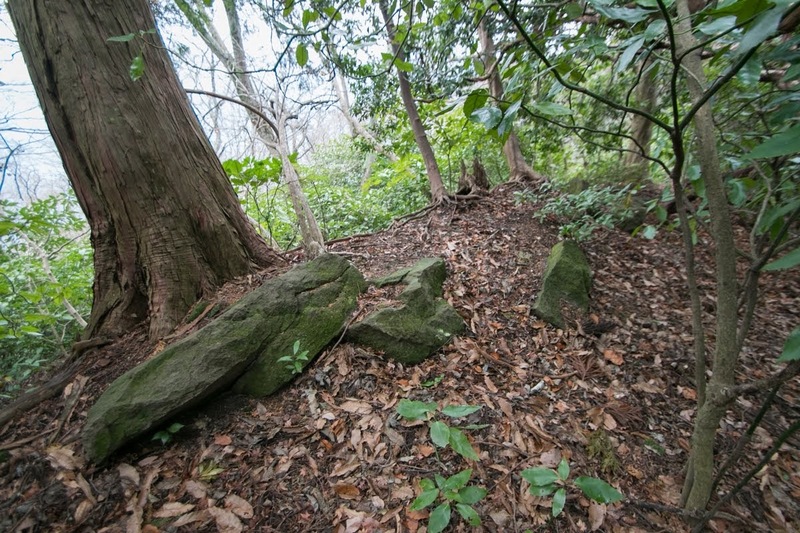 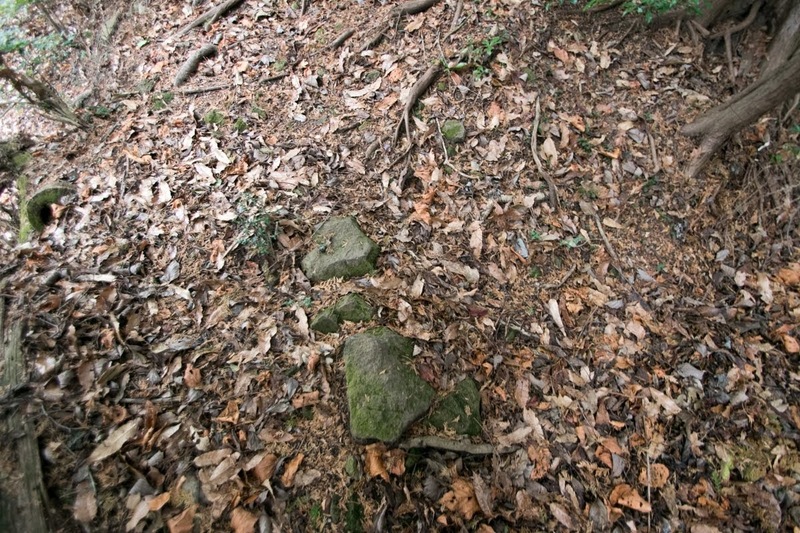 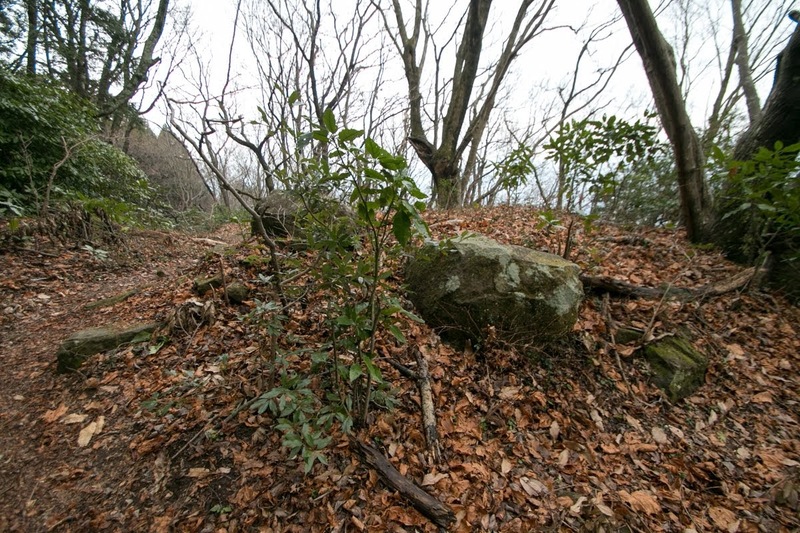 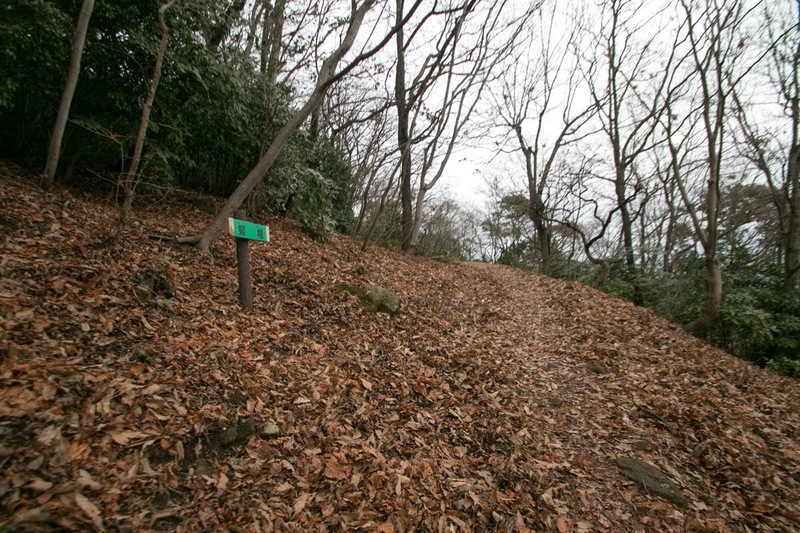 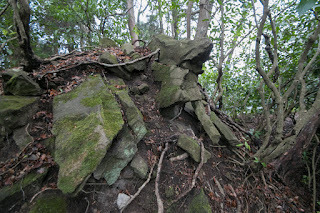 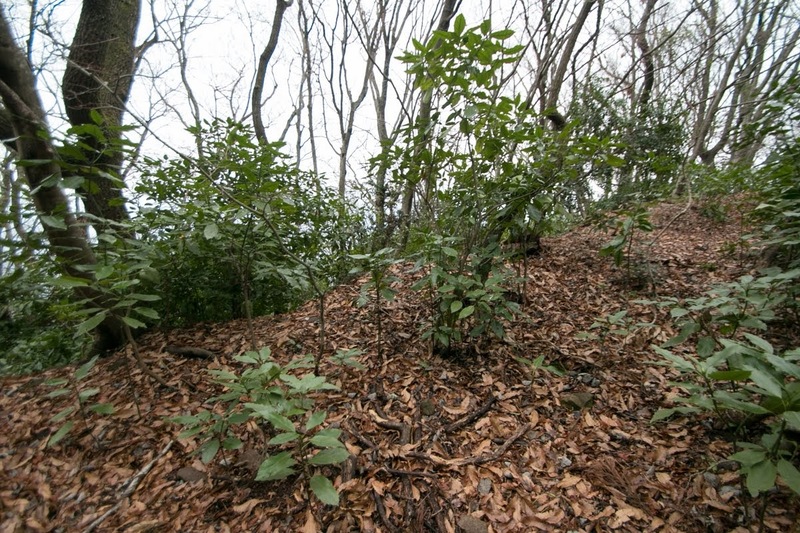 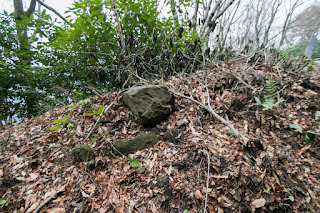 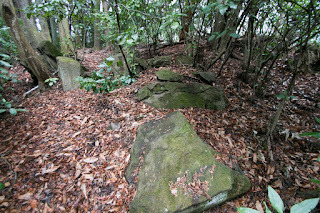 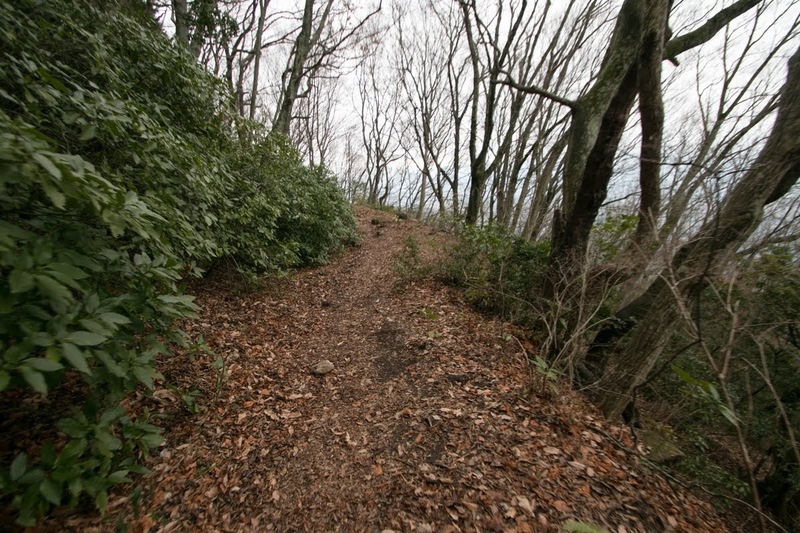 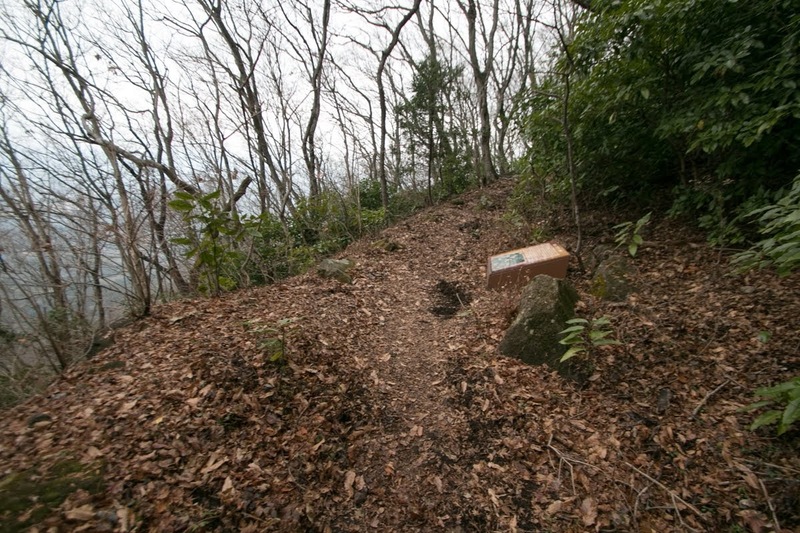 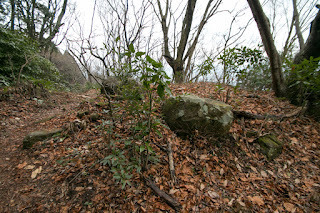 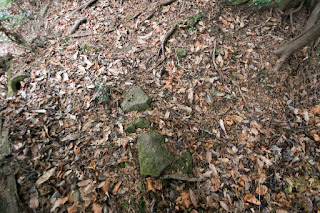 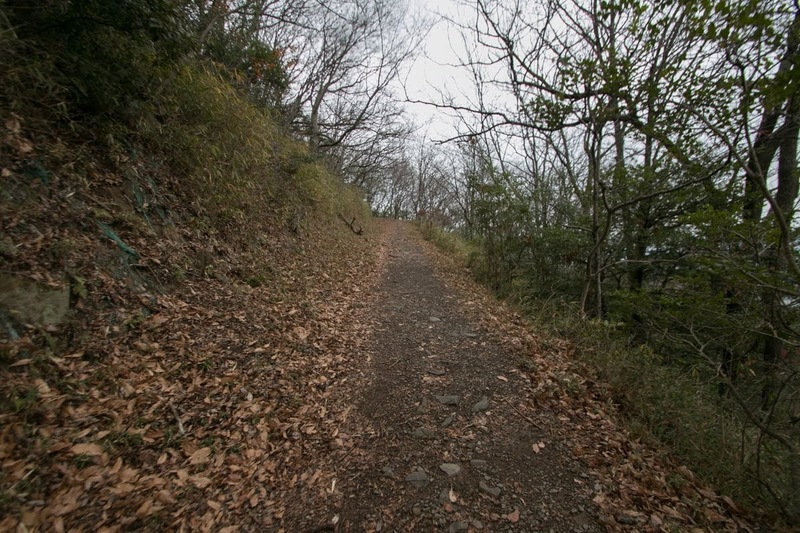 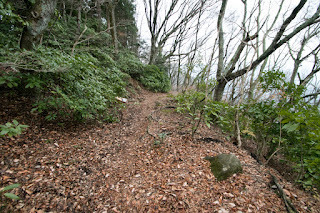 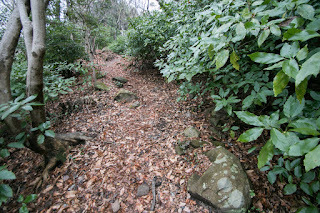 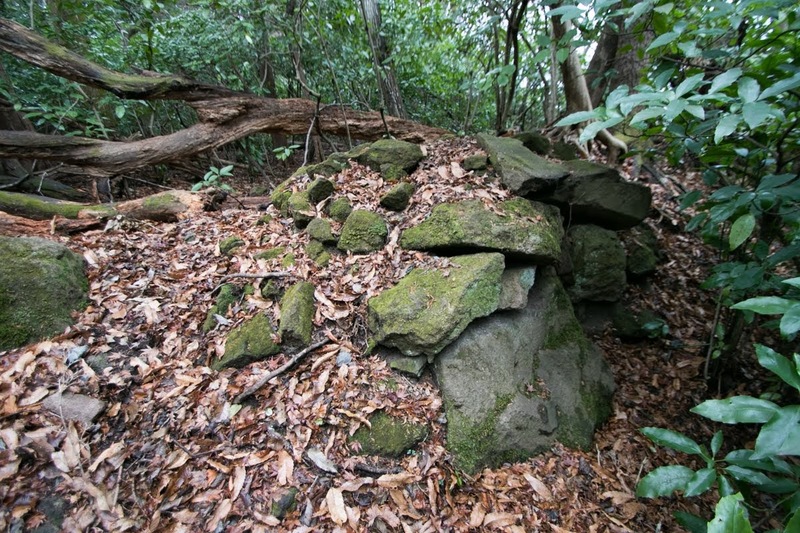 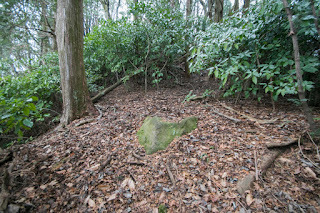 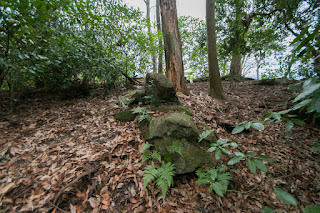 Several retainers such as Koresada Saeki (1569-1618) at Togamure castle or Chikatsugu Shiga (1566-1660) kept resistance against Shimazu army, but many castles were fell or surrendered then opened the way for Shimazu army. Detached force of Shimazu army lead by Iehisa Shimazu (1547-1587) encircled Tsuruga castle, an important castle to protect Funai city. 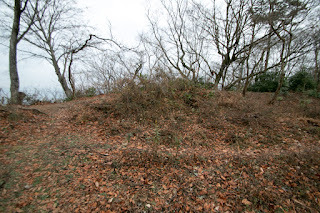 To save Tsuruga castle, Yoshimune Otomo (1558-1610) lead his army with reinforcement army from central ruler Hideyoshi Toyotomi (1537-1598), including Motochika Chosokabe (1539-1599) and Hidehisa Sengoku (1552-1614). 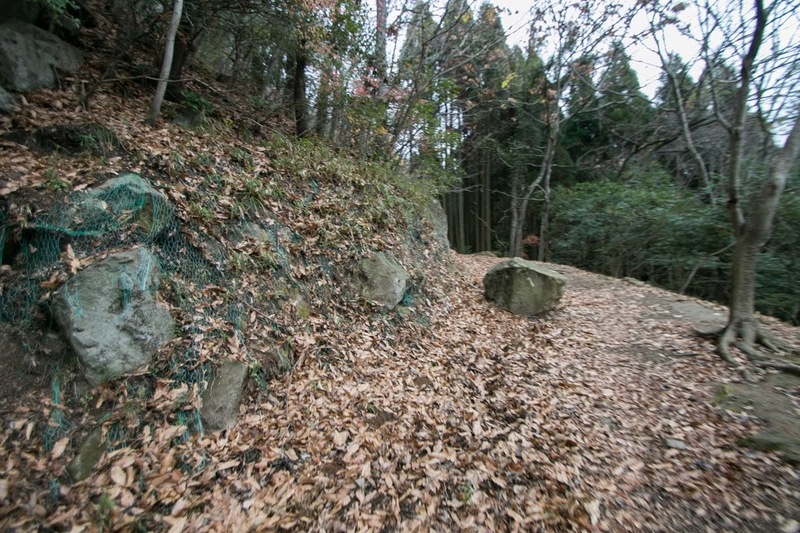 But because of the reckless tactics of Hidehisa, Otomo army suffered severe defeat by the trap of Shimazu army at this battle of Hetsugigawa. 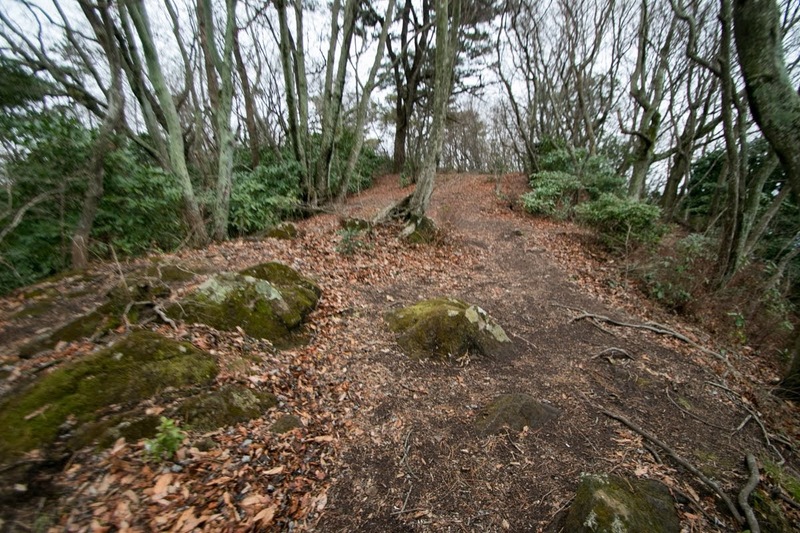 Yoshimune Otomo kept his army at this battle, but politics and religious policy of Otomo clan evoked dissatisfaction among retainers and there was a fear of betrayal. 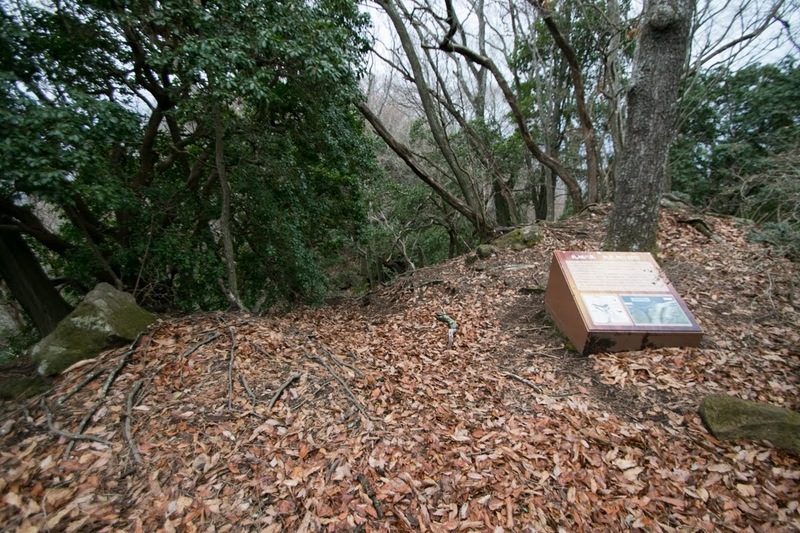 Yoshimune Otomo decided to abandon Funai city, and escaped to Takasaki castle. 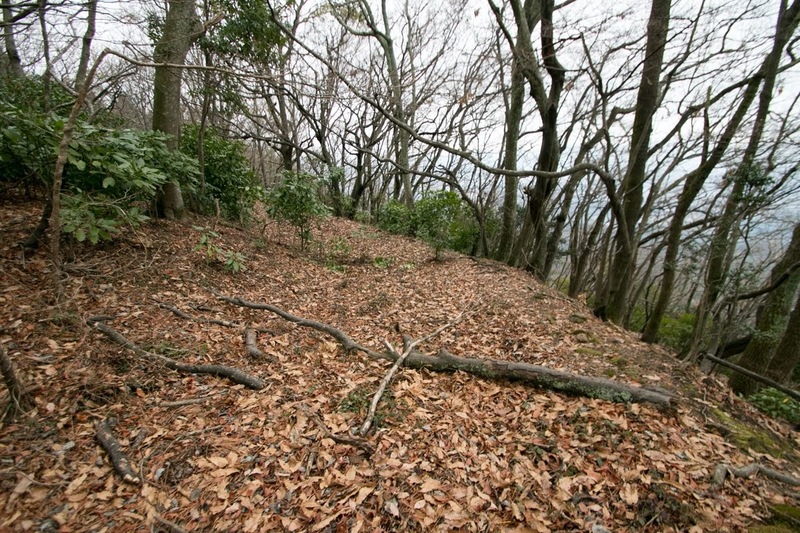 Shimazu army intruded into vacant Funai city and destructed it, and the burning Funai town might be well looked from Takasakiyama castle. 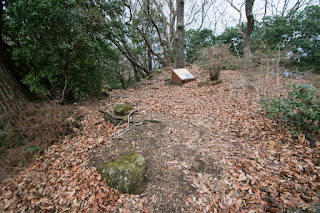 However, this time Yoshimune Otomo did not use Takasaki castle and further escaped to Ryuo castle of Buzen province at the northward. Because of sudden escape there was limited supplies, and the morale of soldiers was quite low. 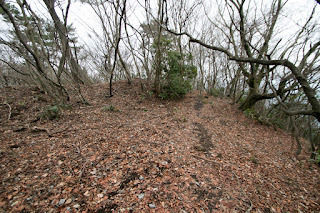 There was no hope for the reinforcement army, and it was better to approach to Toyotomi army already proceeded into Buzen province. 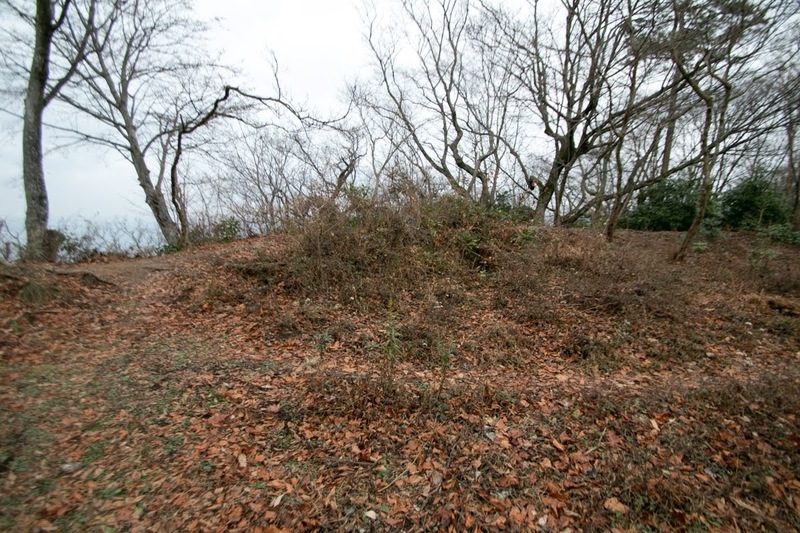 In December 1586 Yoshimune Otomo burnt down Takasaki castle and moved to Ryuo castle. 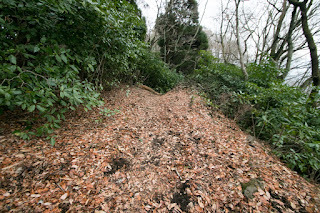 Formerly it was a useful castle at turn up but could not stop the fall at turn down. 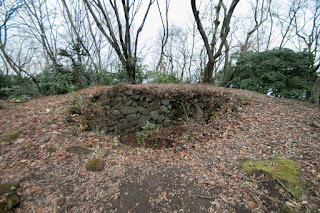 Yoshimune survived the attack of Shimazu army from this escape, but this attitude might be a one reason of later expulsion of Otomo clan by Hideyoshi. 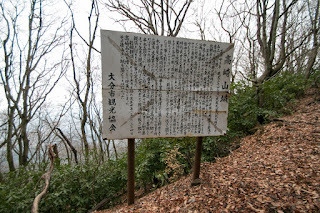 Finally Shimazu army retreated from Bungo province and surrendered before the attack of Hideyoshi, and Yoshimune Otomo once regained Bungo province. 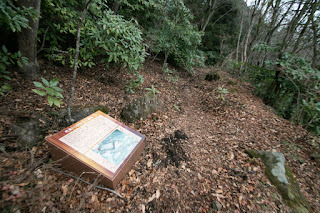 But Yoshimune was expelled due to the failure in foreign expedition, and Funai area became the territory of Naotaka Fukuhara (?-1600). 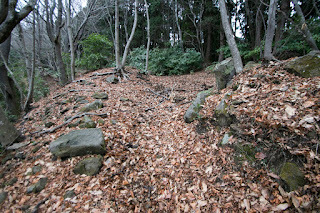 Naotaka abolished Takasaki castle and used stones to build Oita Funai castle. 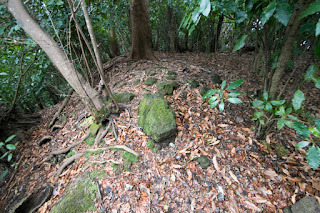 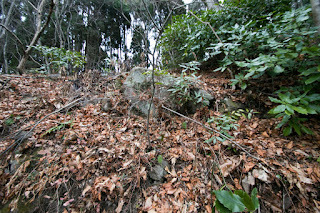 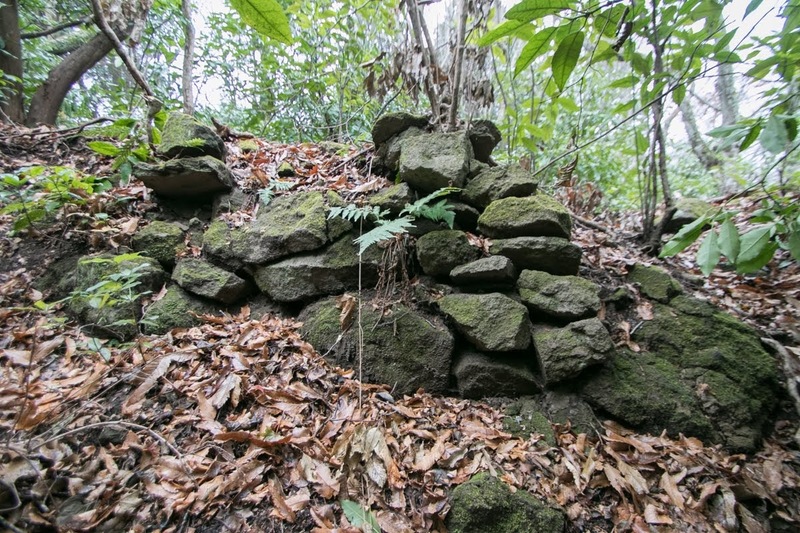 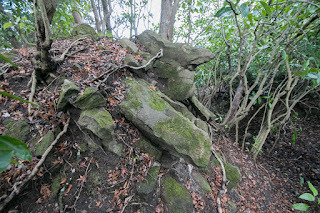 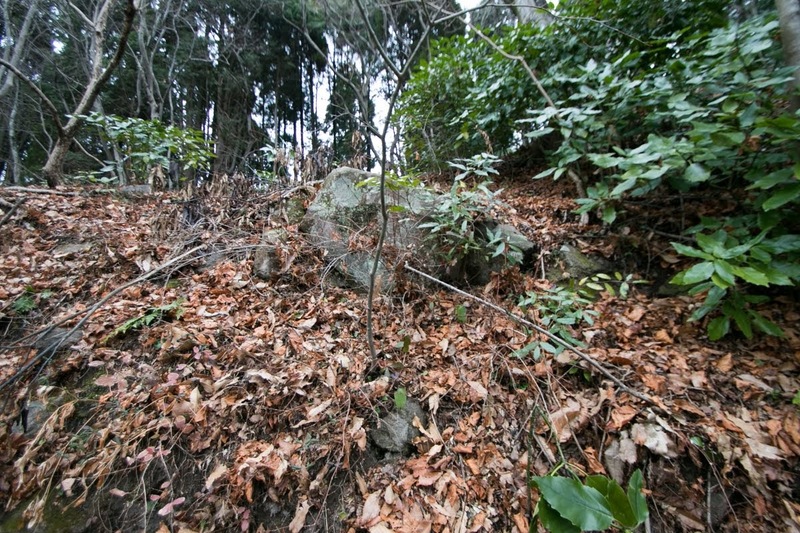 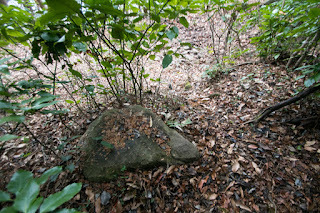 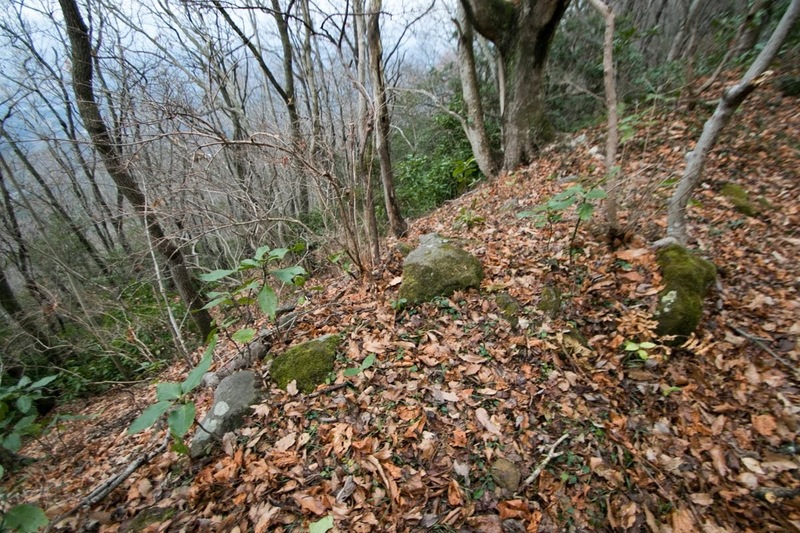 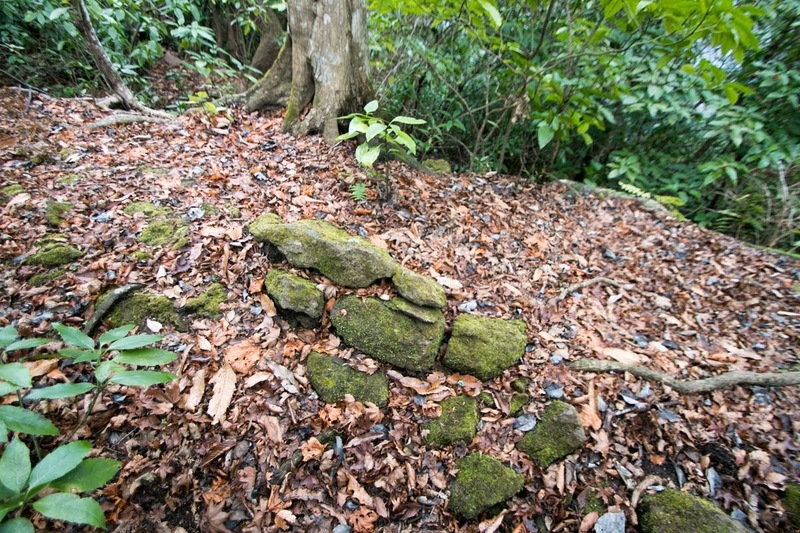 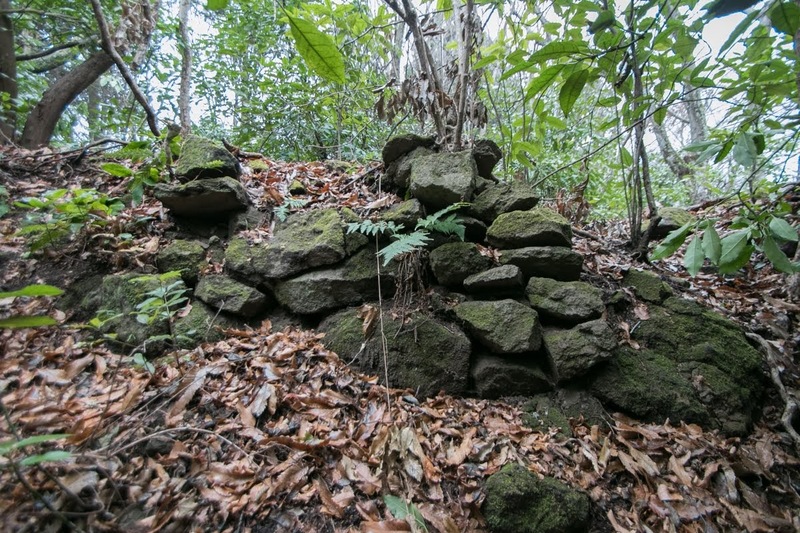 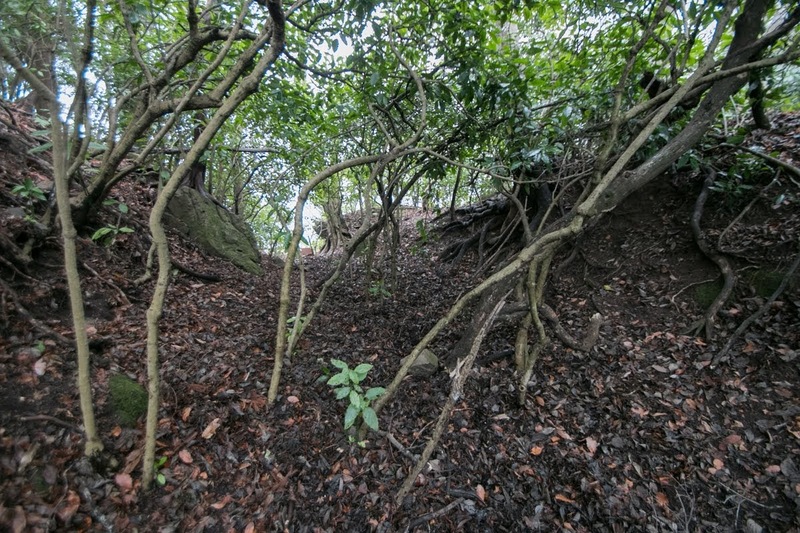 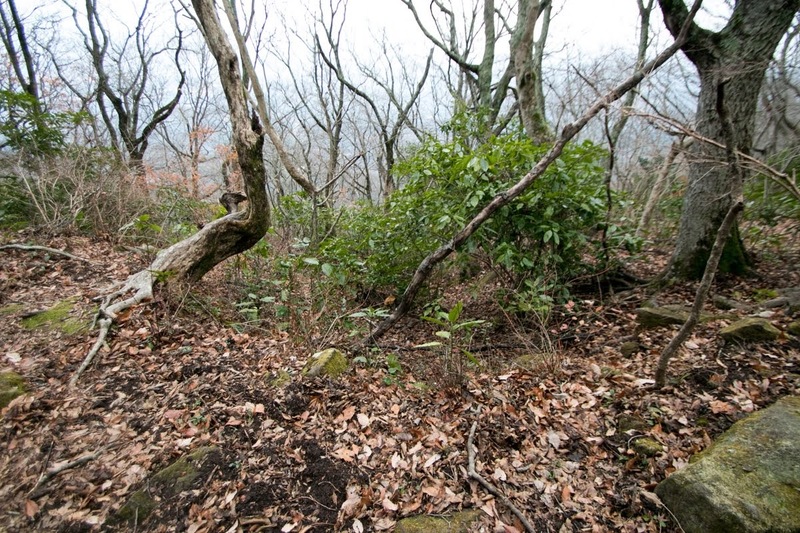 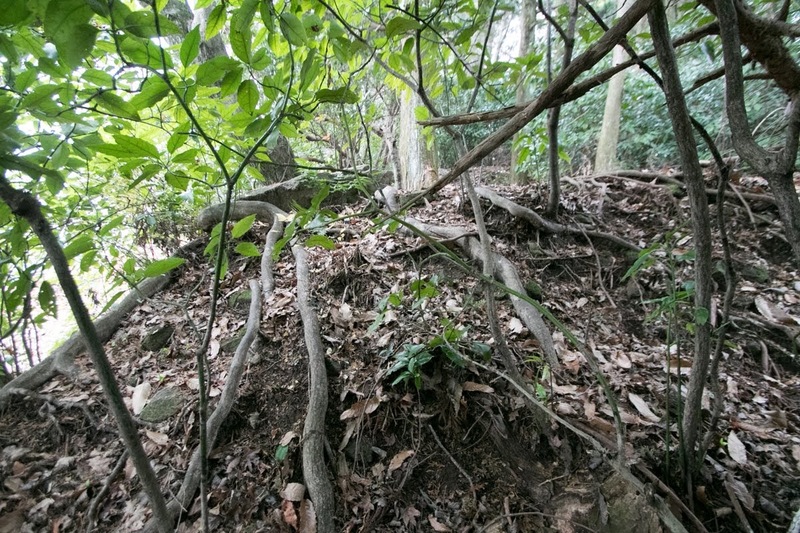 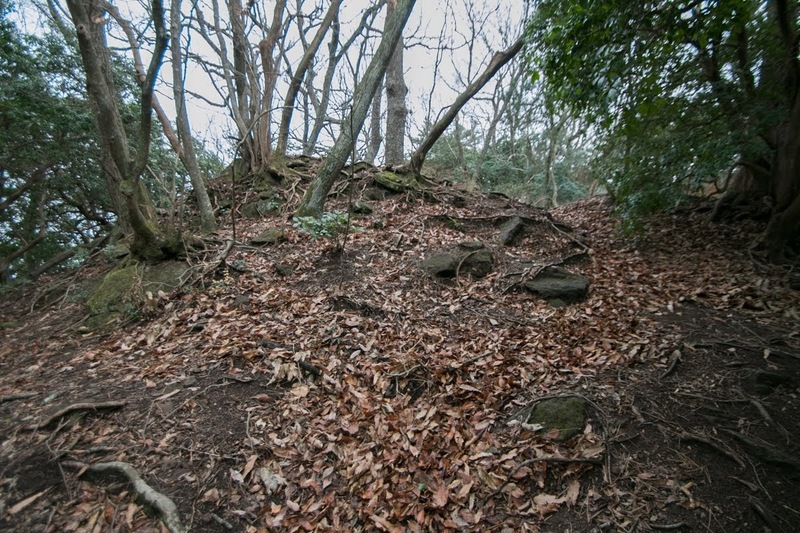 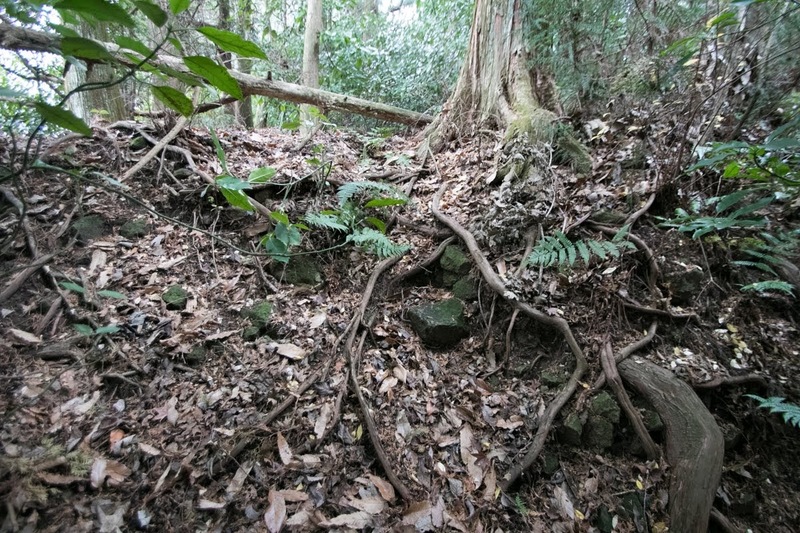 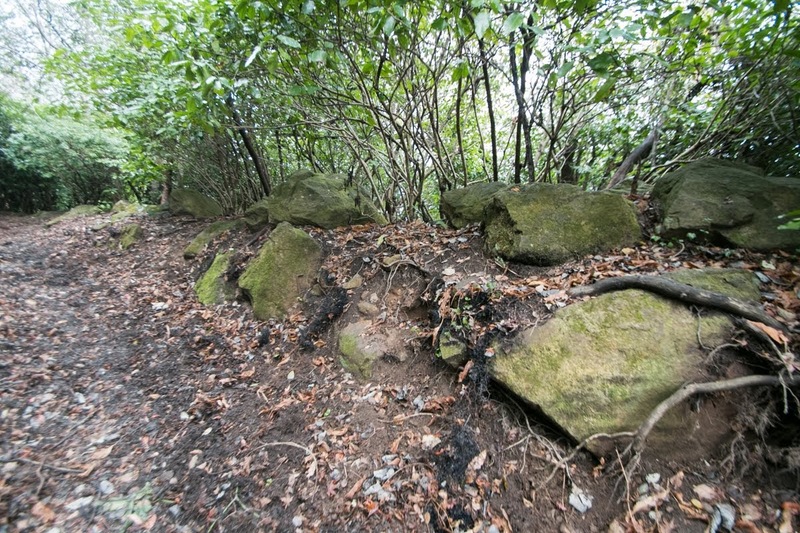 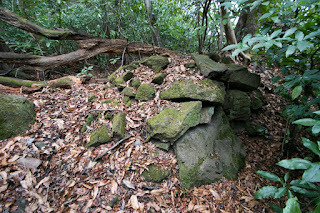 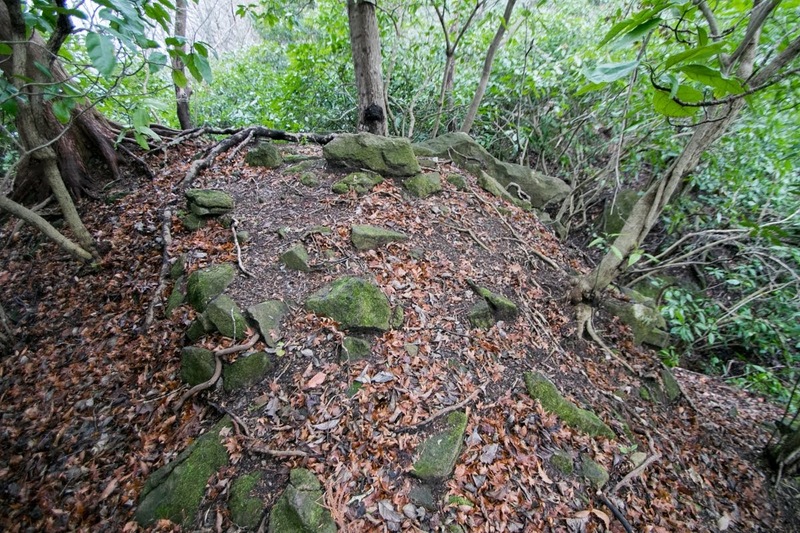 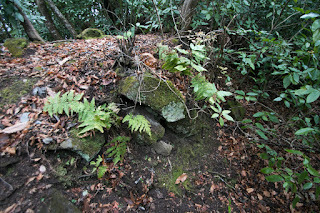 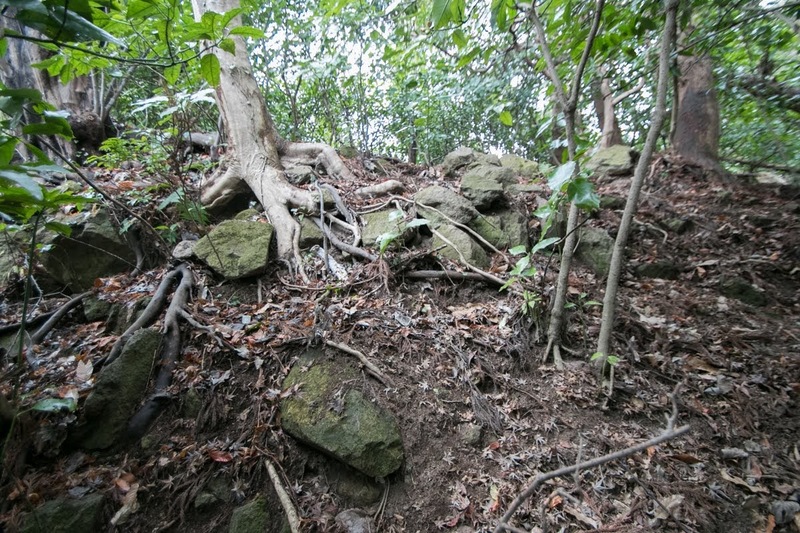 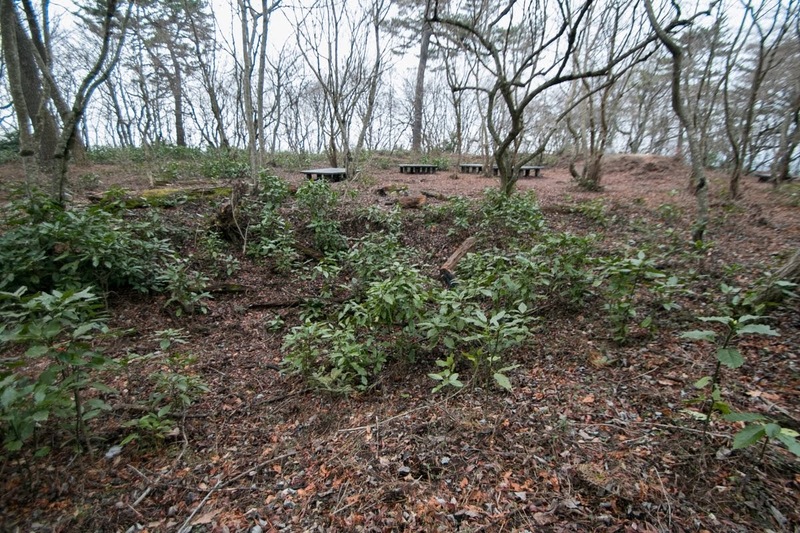 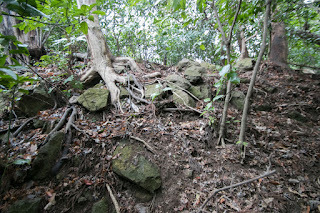 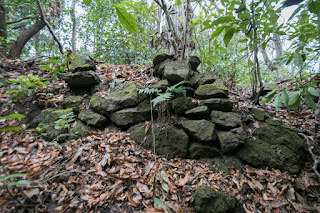 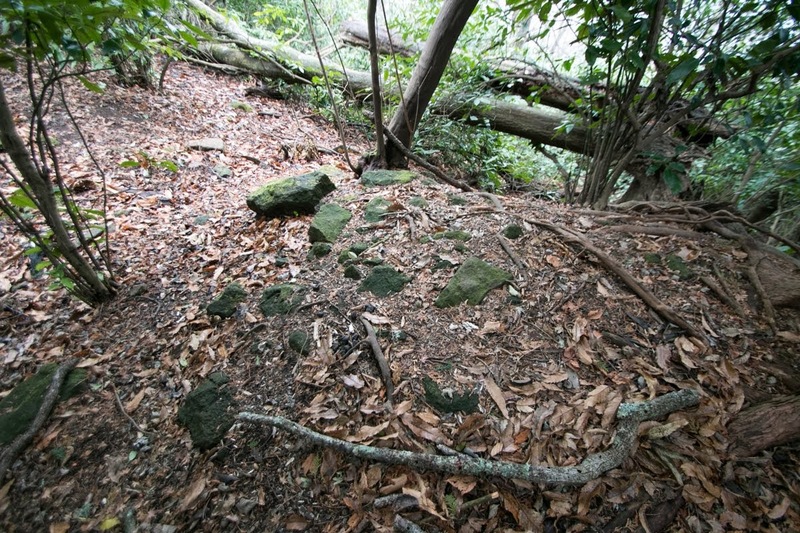 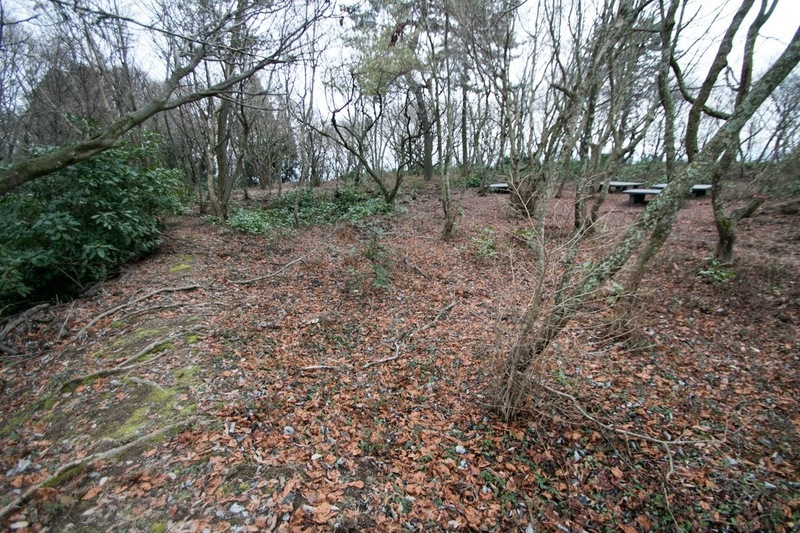 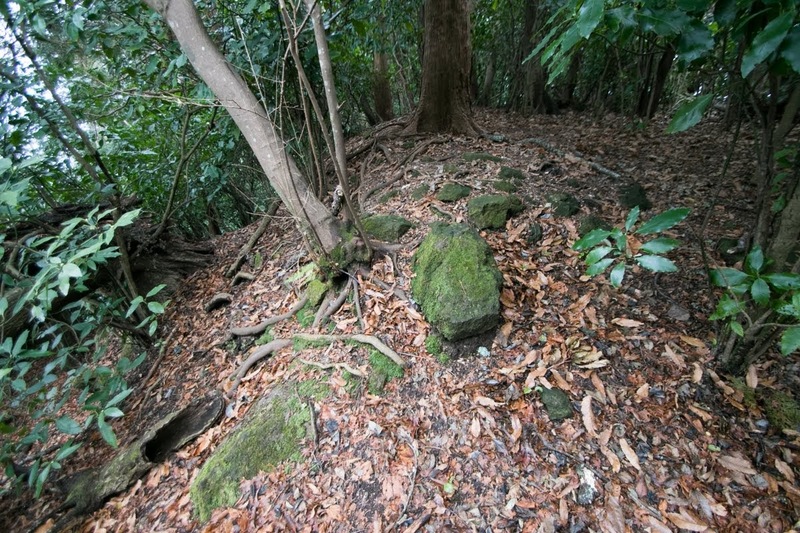 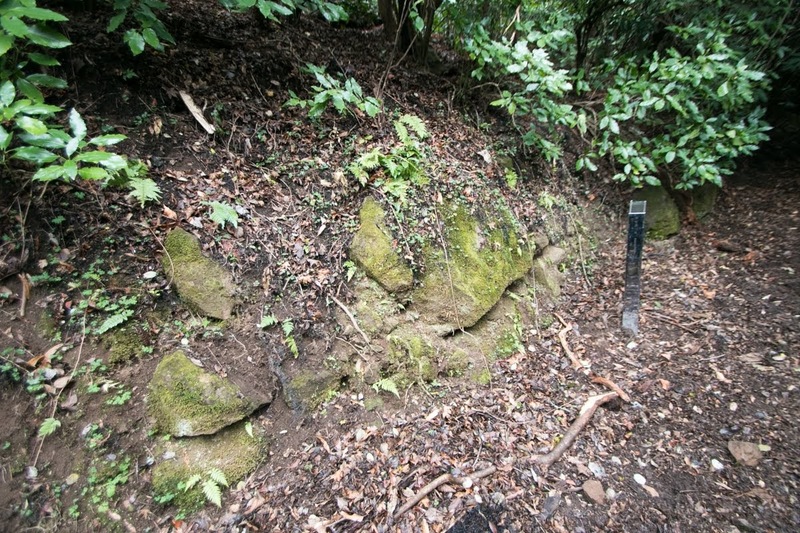 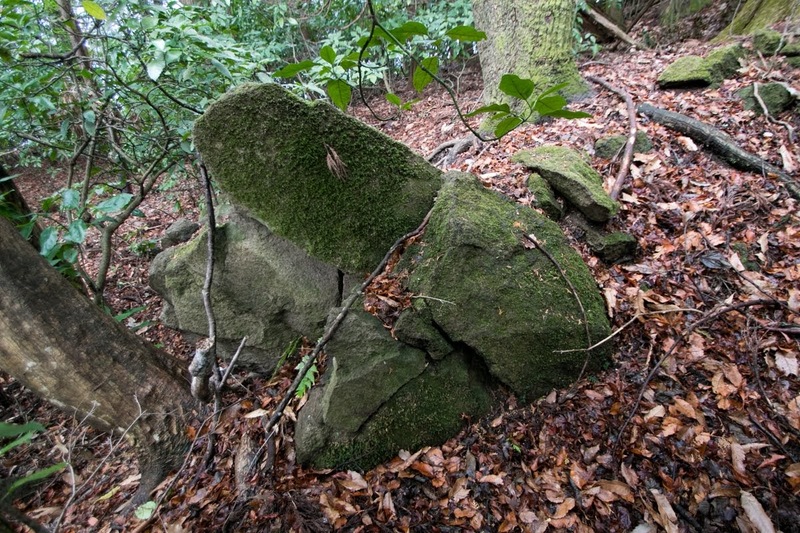 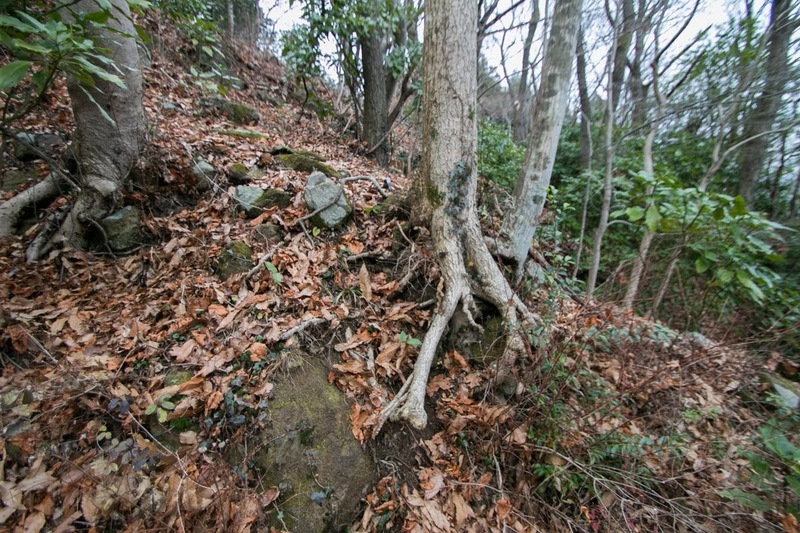 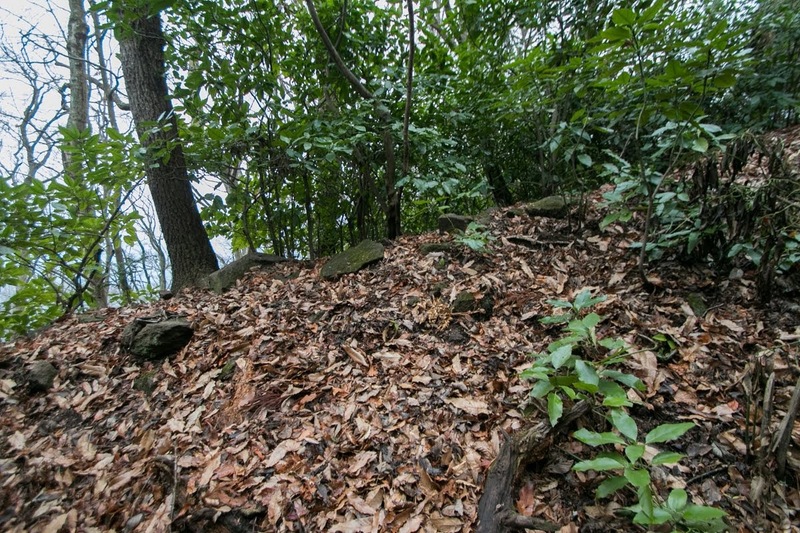 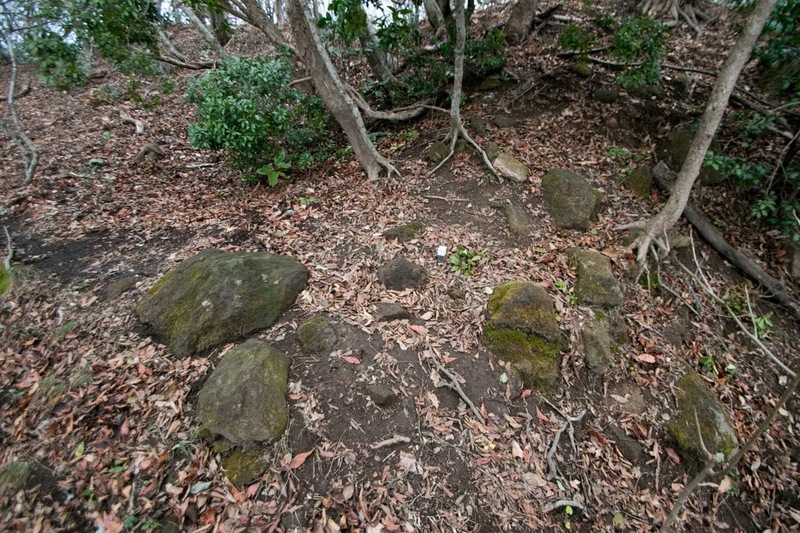 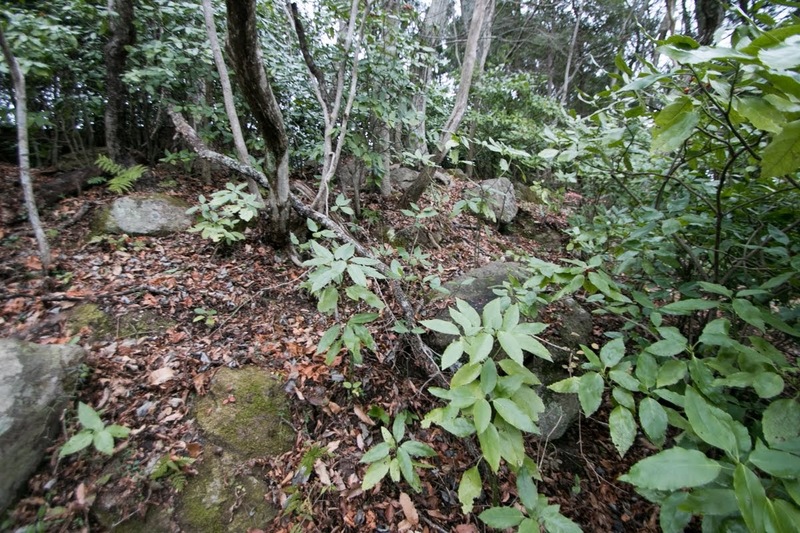 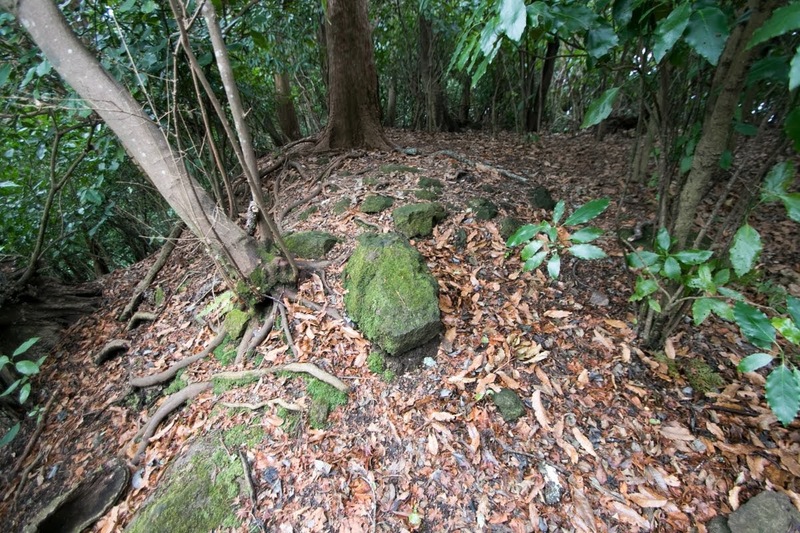 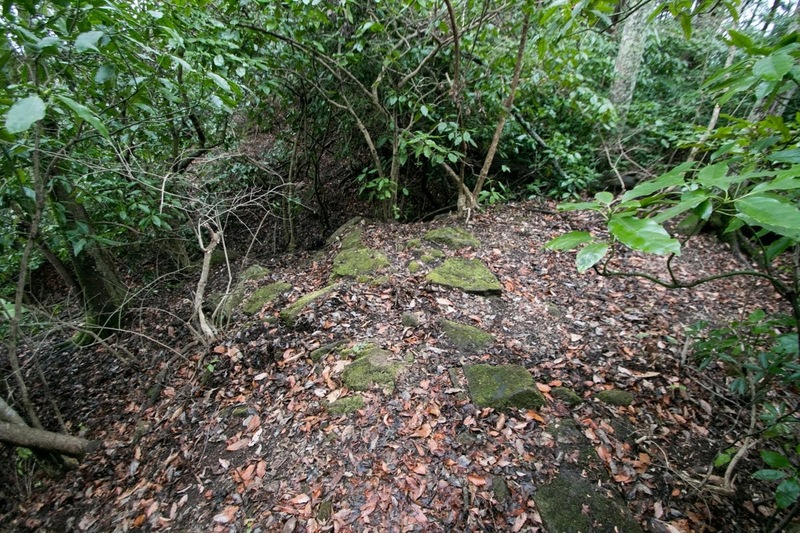 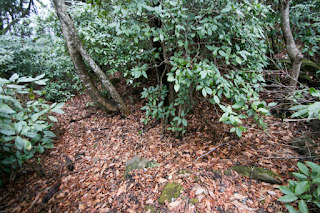 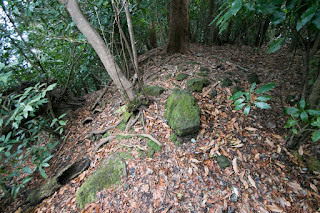 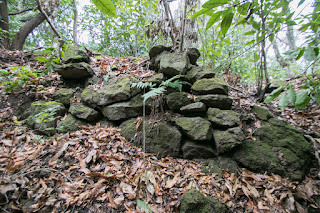 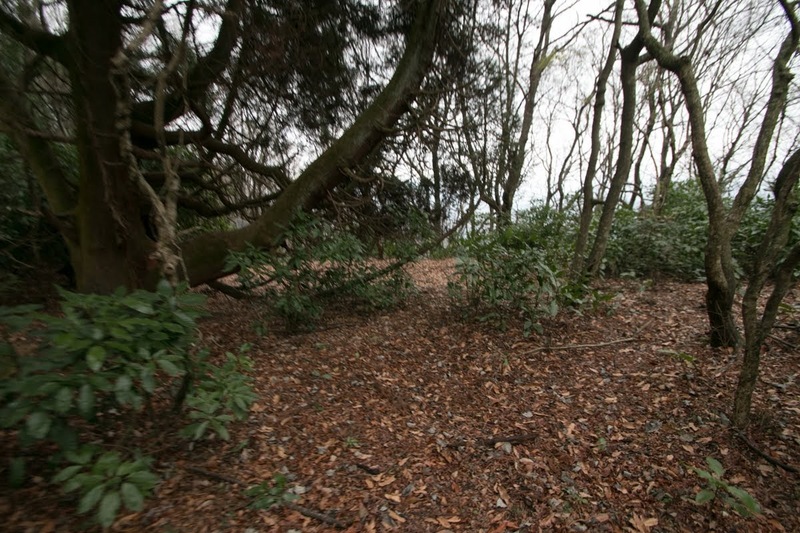 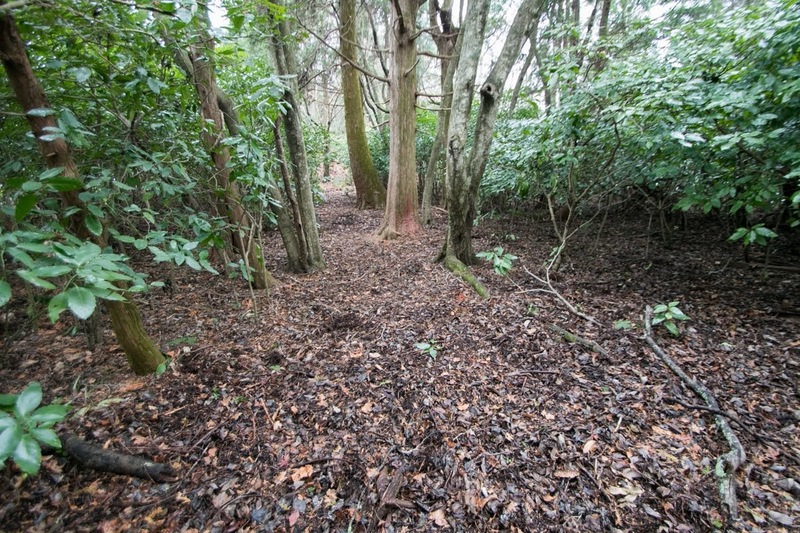 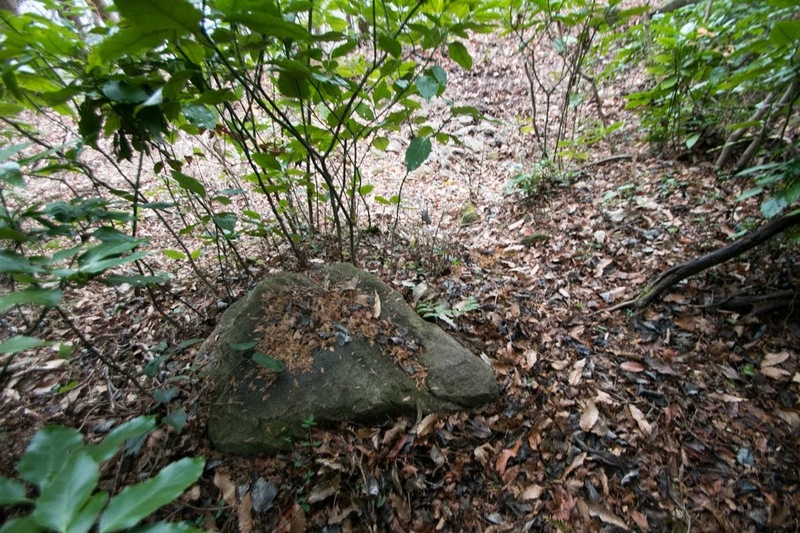 Now no building remains but structures of the castle well remain on the mountain, partially covered by bushes. 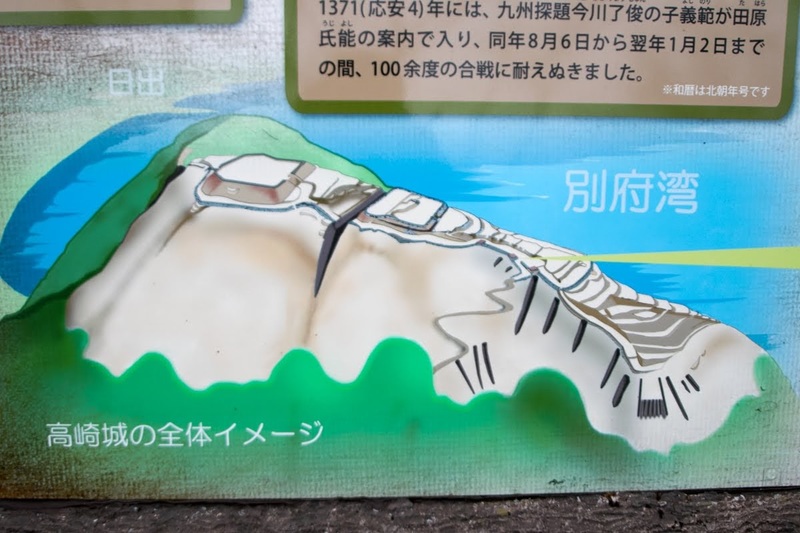 In addition to the impressive shape of Takasaki mountain, well built structure of the castle shows it was exactly a symbol of Otomo clan. 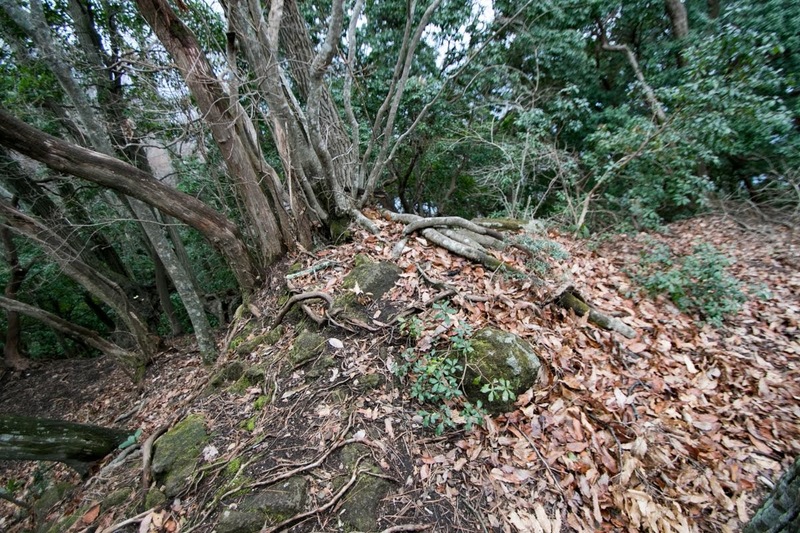 Otomo clan prospered at the brave fight at its symbol, and also fell by the lost of this castle. 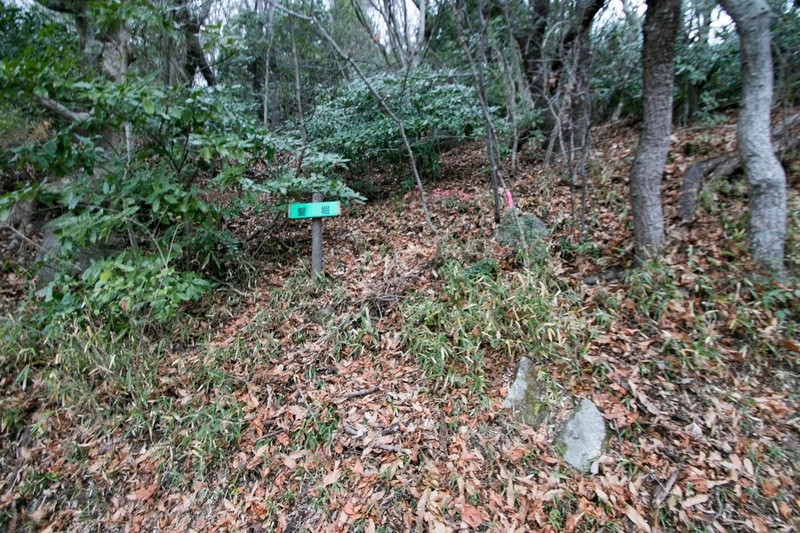 30 minutes drive from Oita Jidoshado Expressway Beppu interchange to halfway parking near Zenigame-Toge pass via Prefectural Road 51. 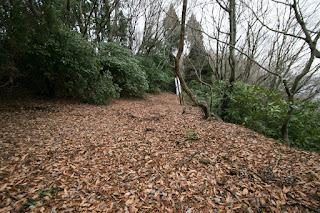 40 minutes from parking to hilltop castle.